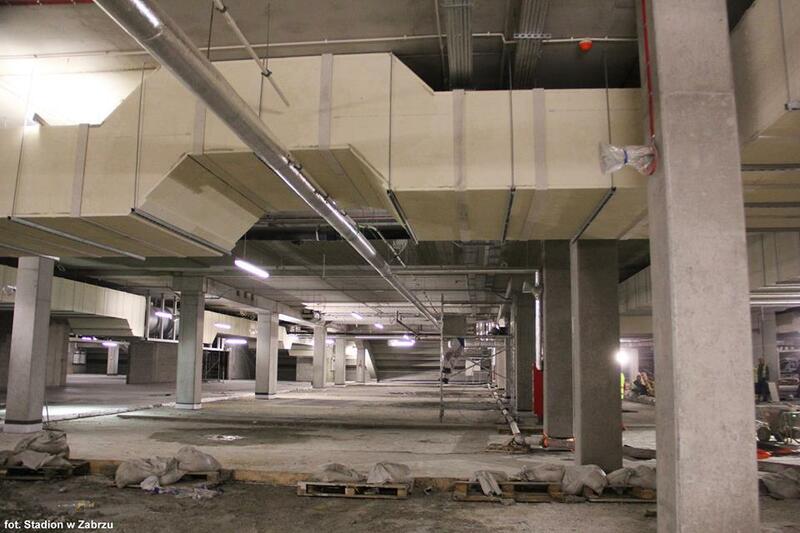 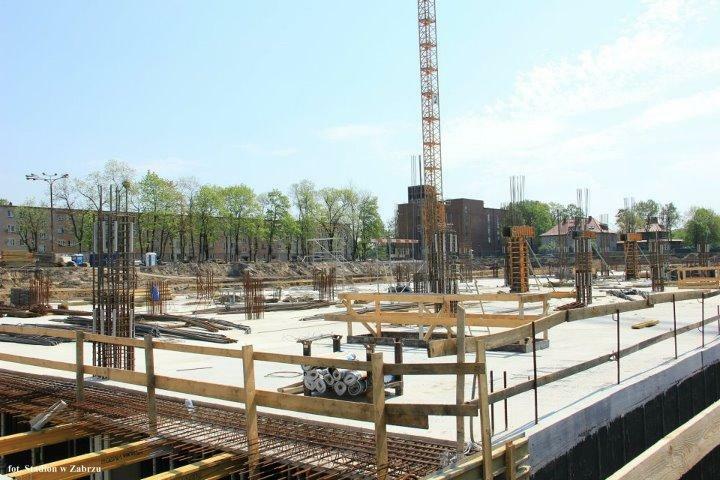 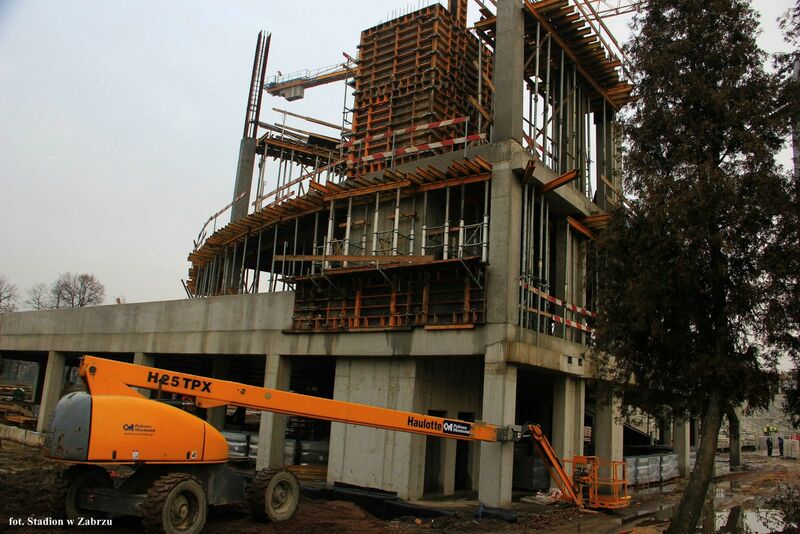 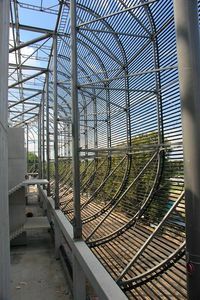 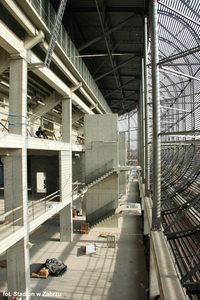 Construction has been divided into two phases. 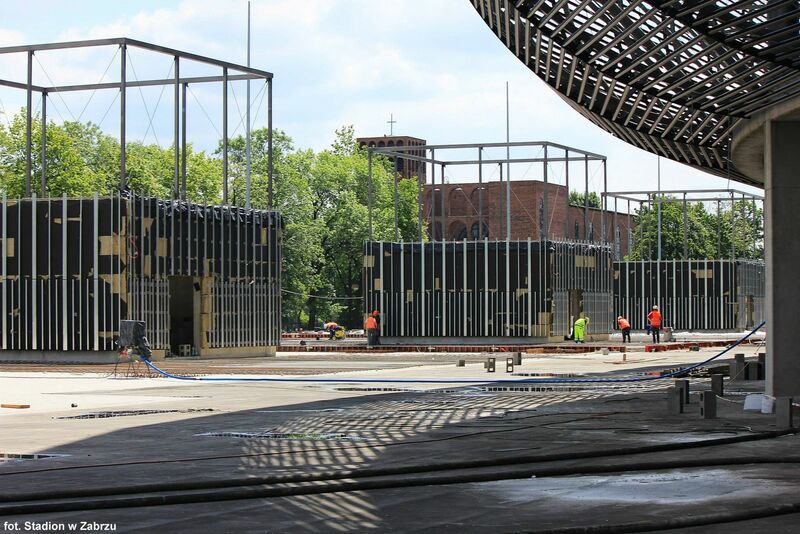 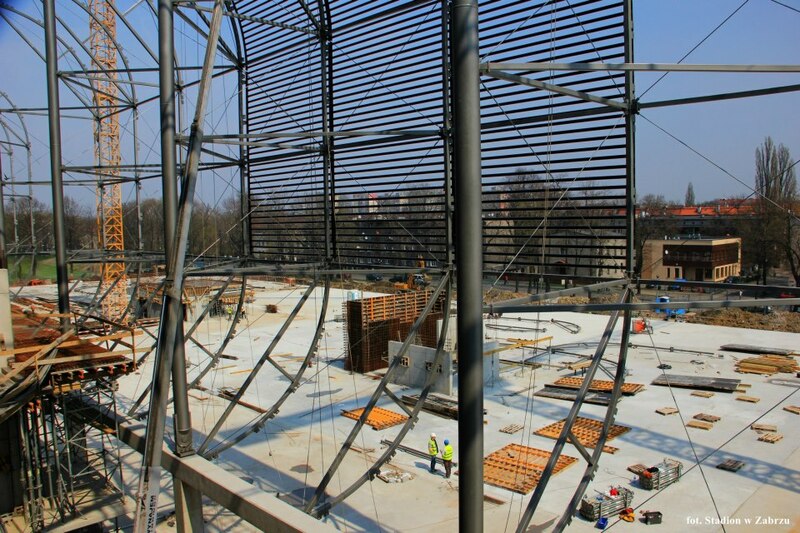 In phase 1 three stands will be built - two behind goals connected with one alongside the pitch. 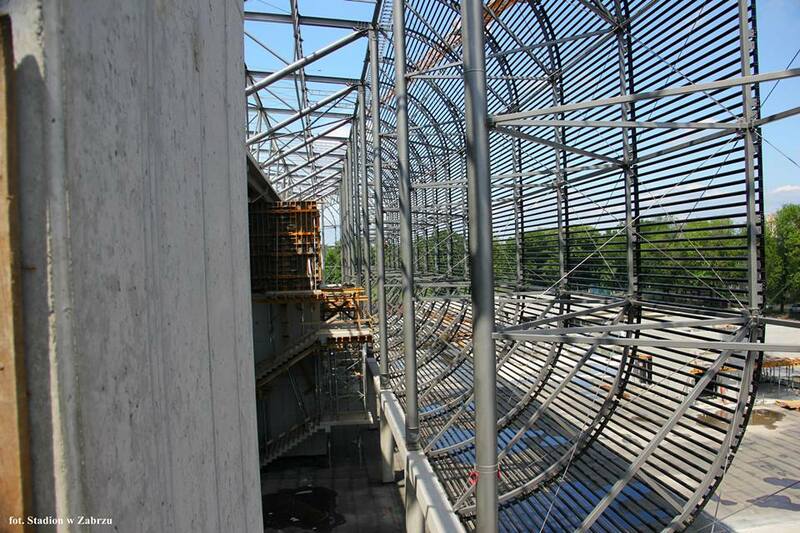 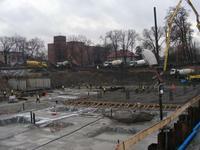 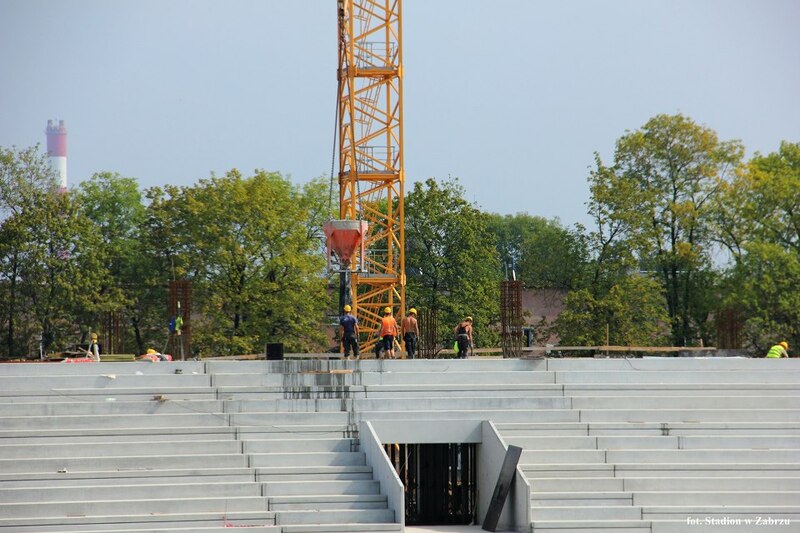 Main grandstand will be added in phase 2, closing the bowl. 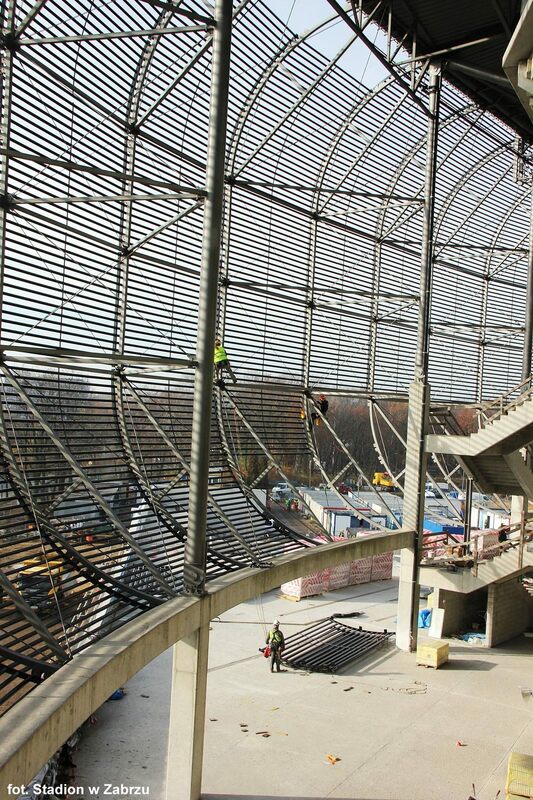 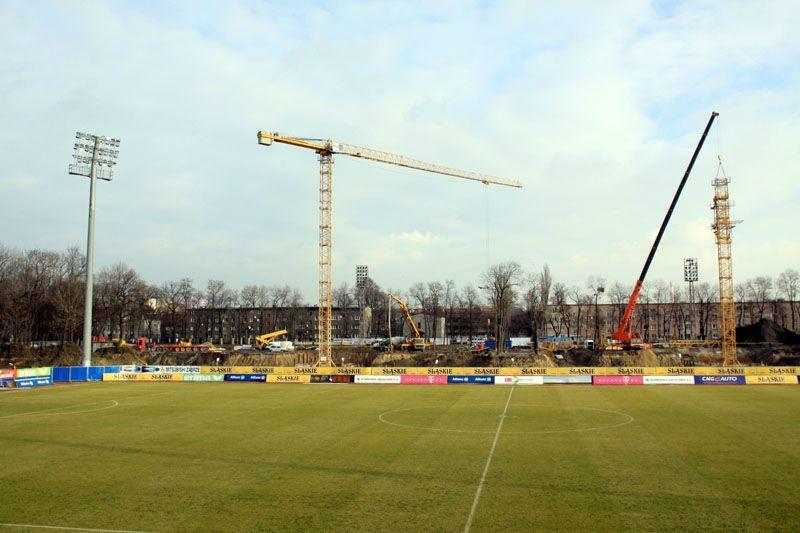 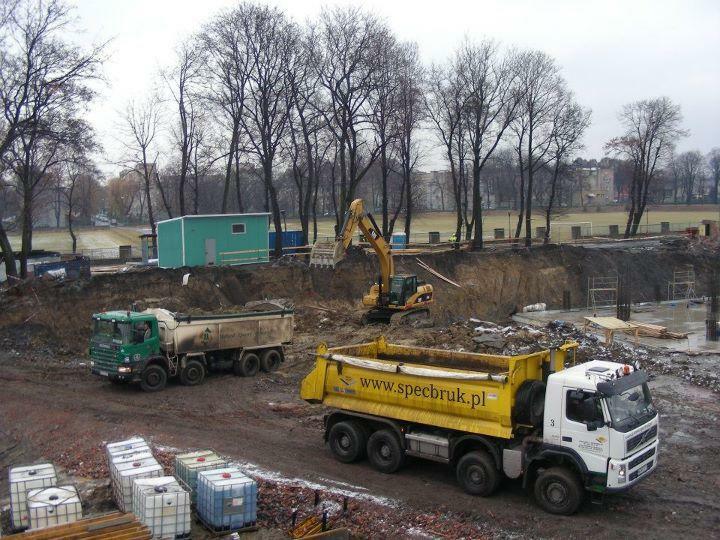 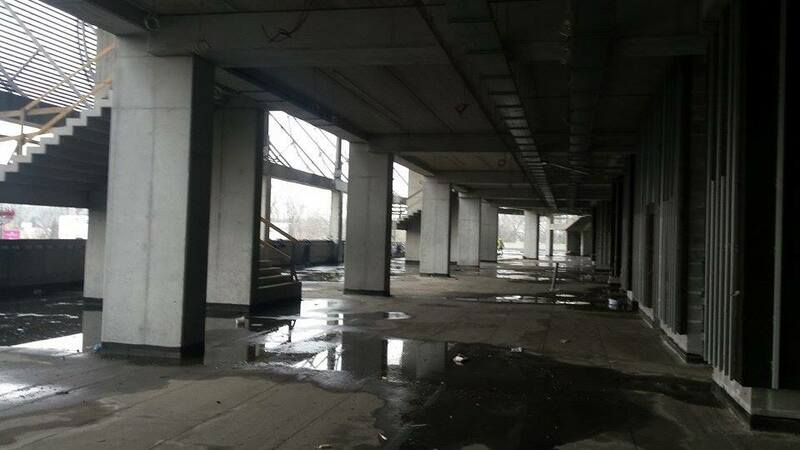 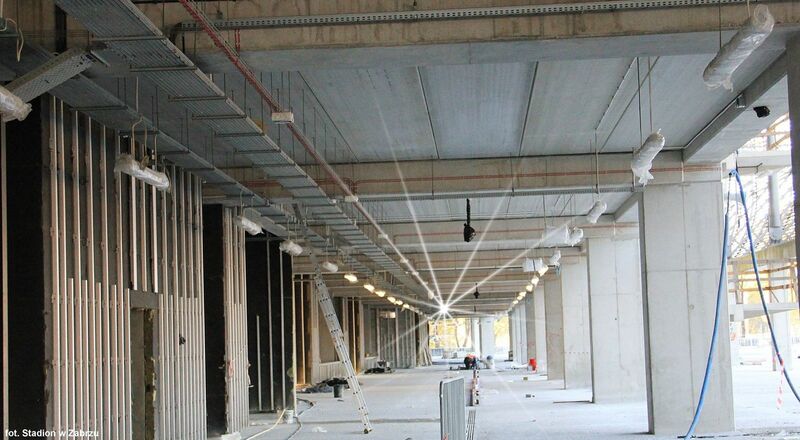 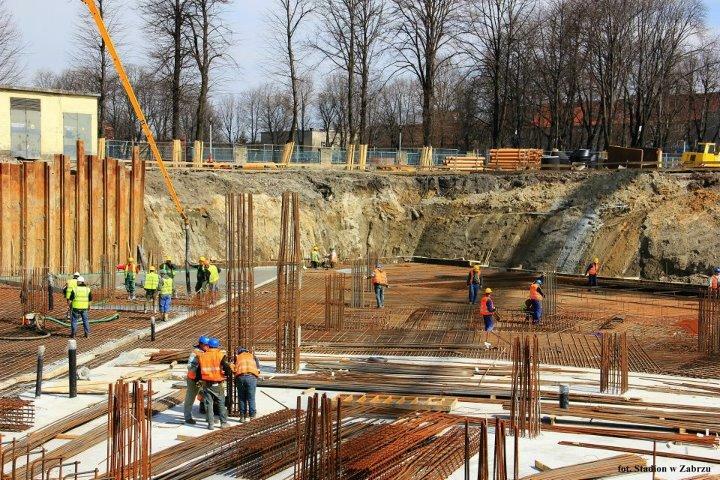 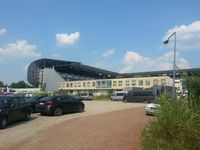 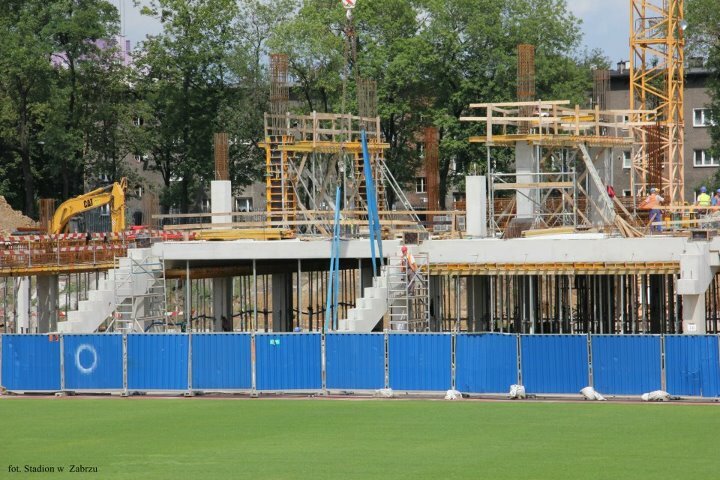 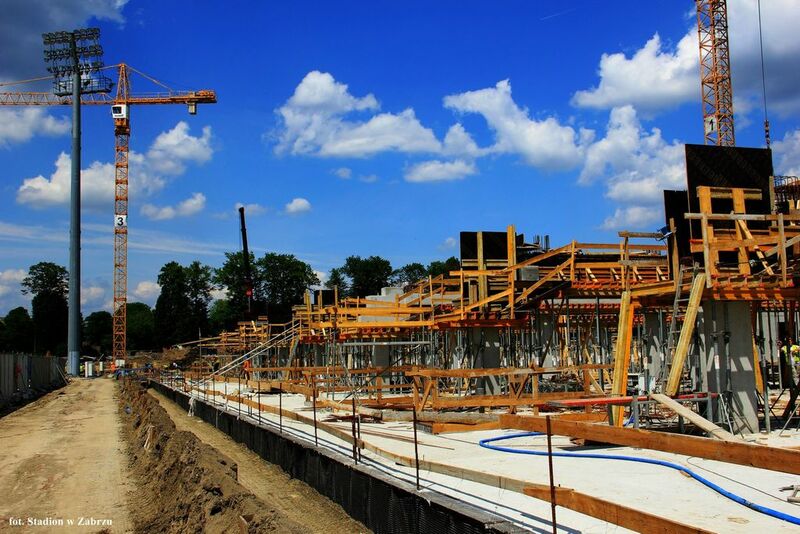 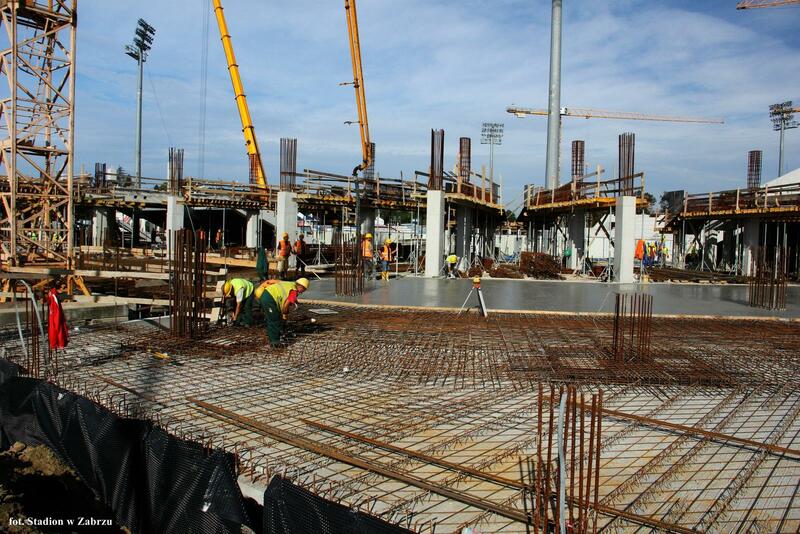 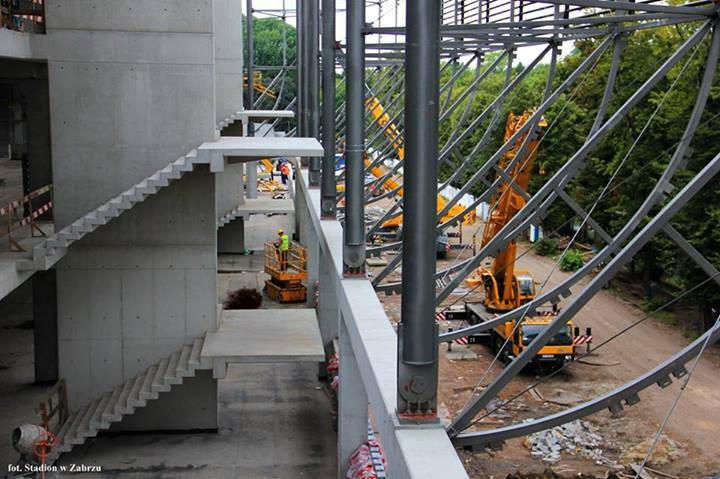 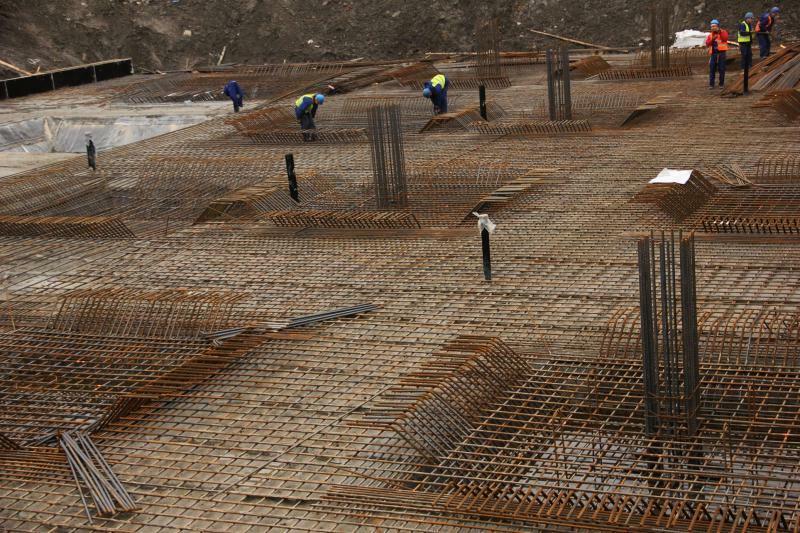 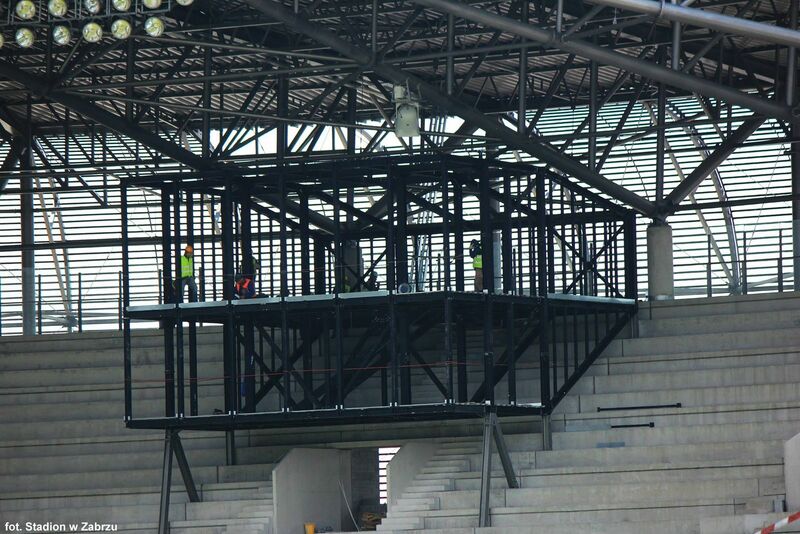 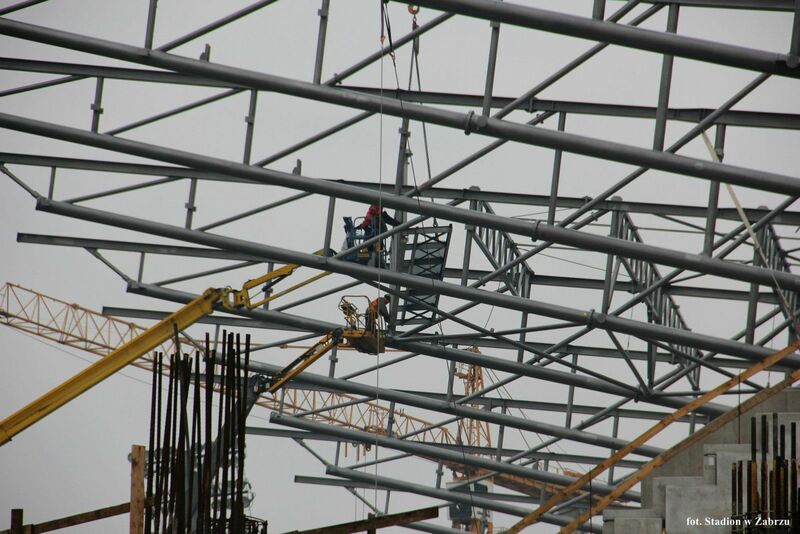 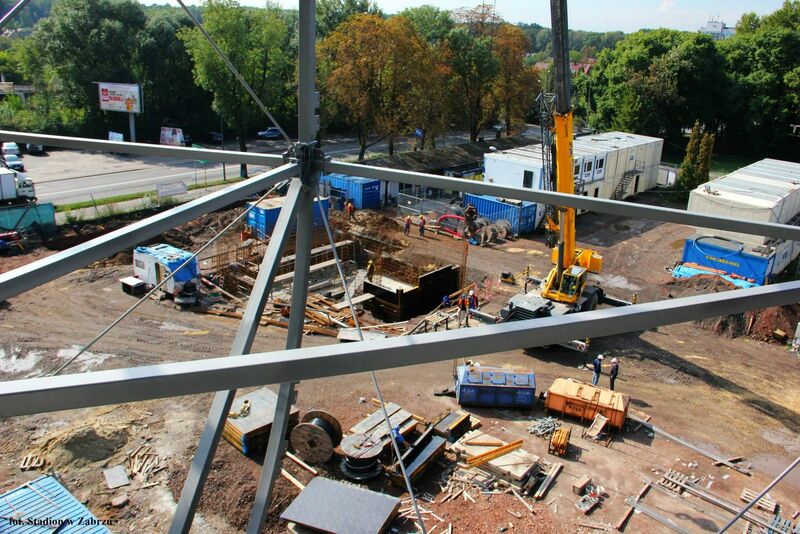 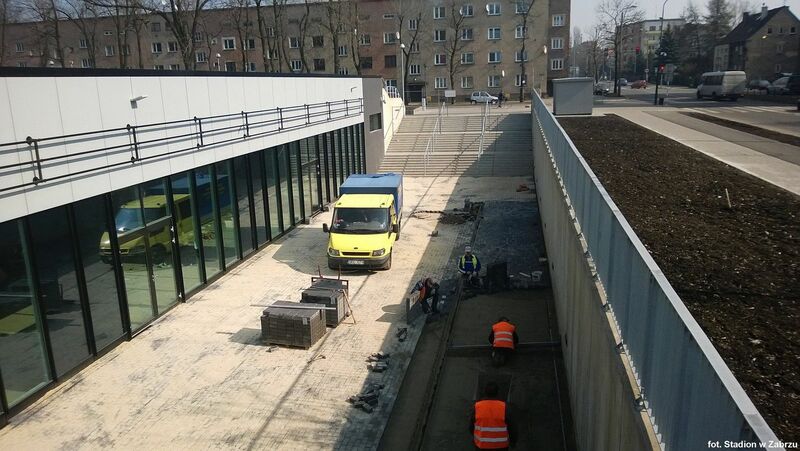 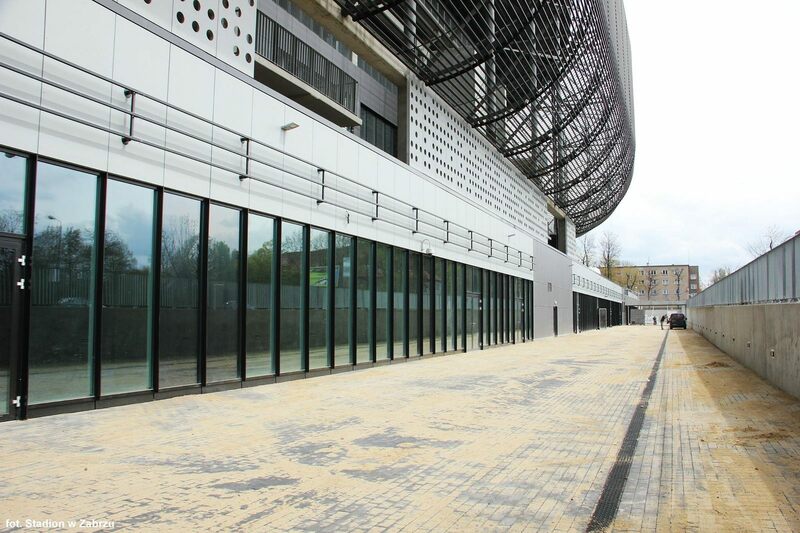 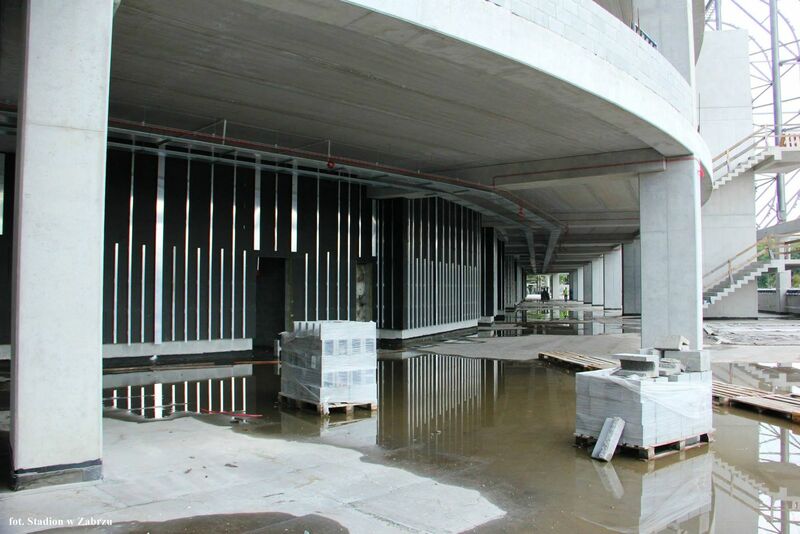 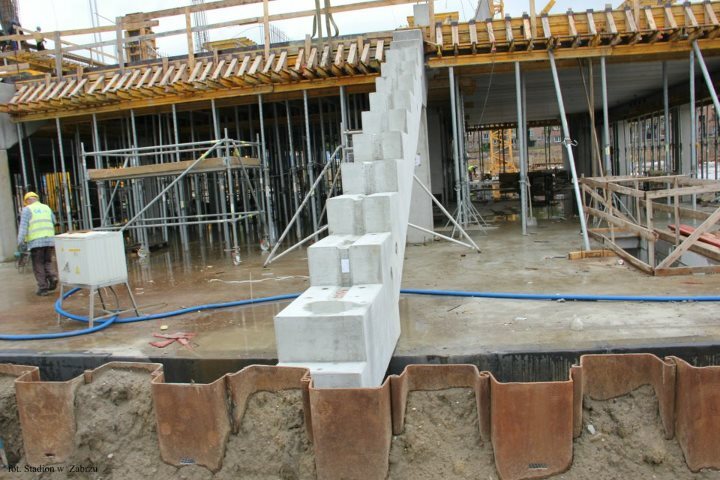 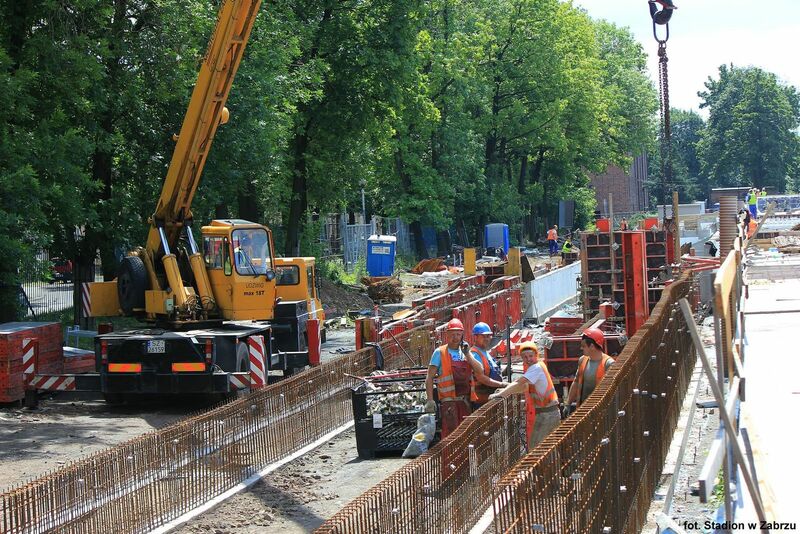 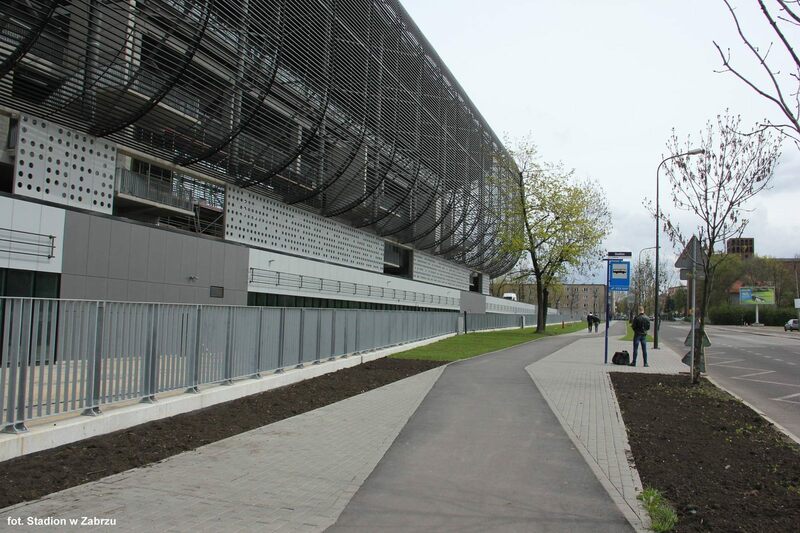 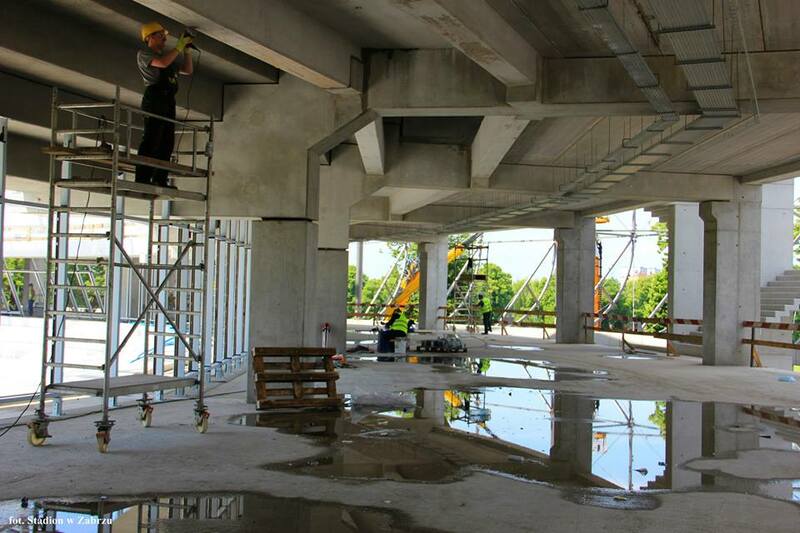 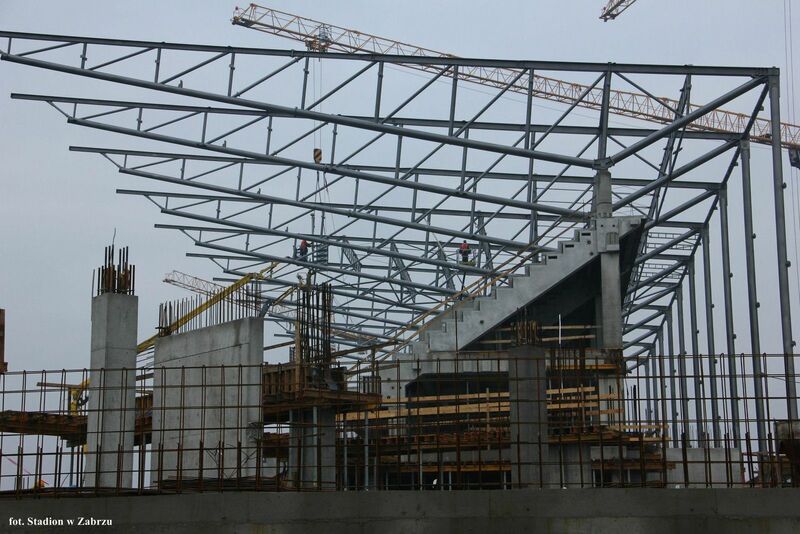 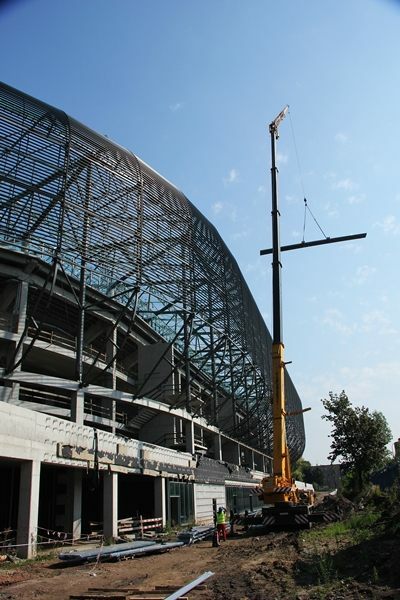 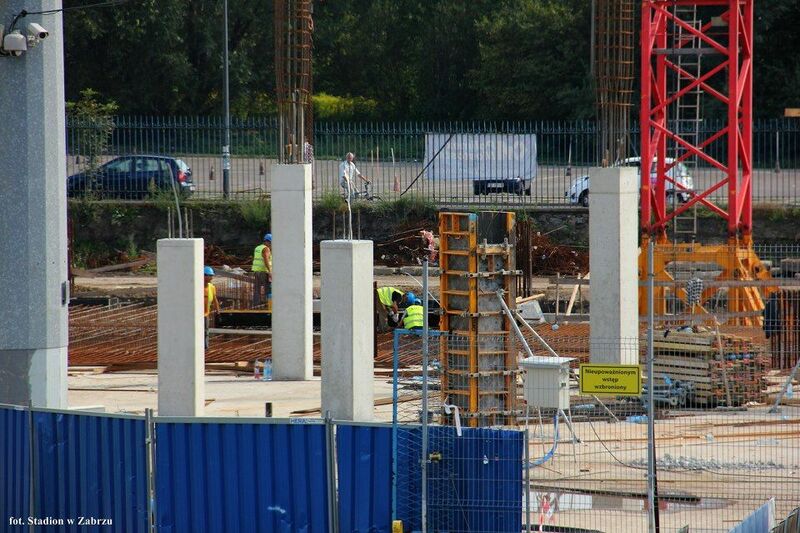 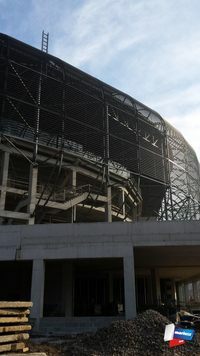 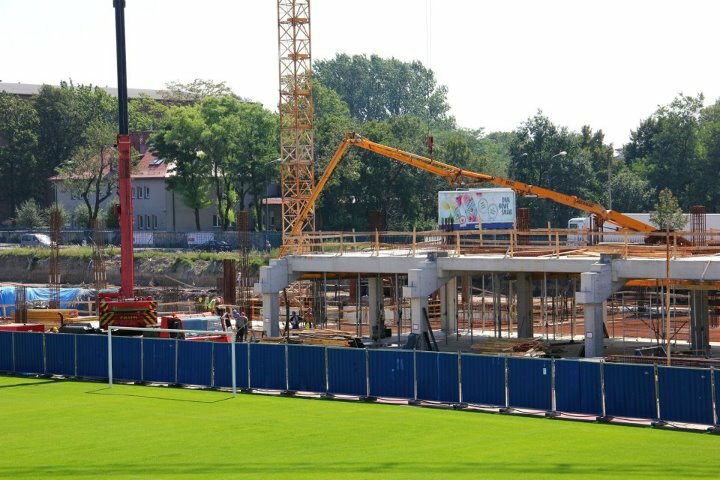 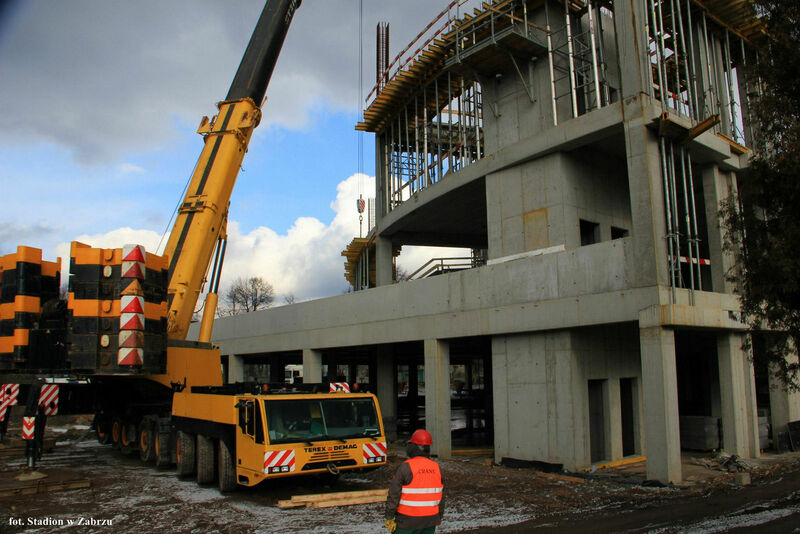 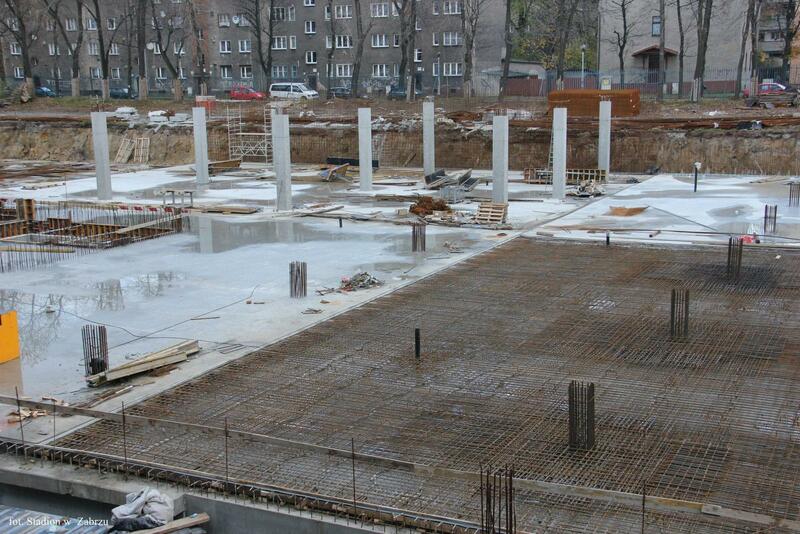 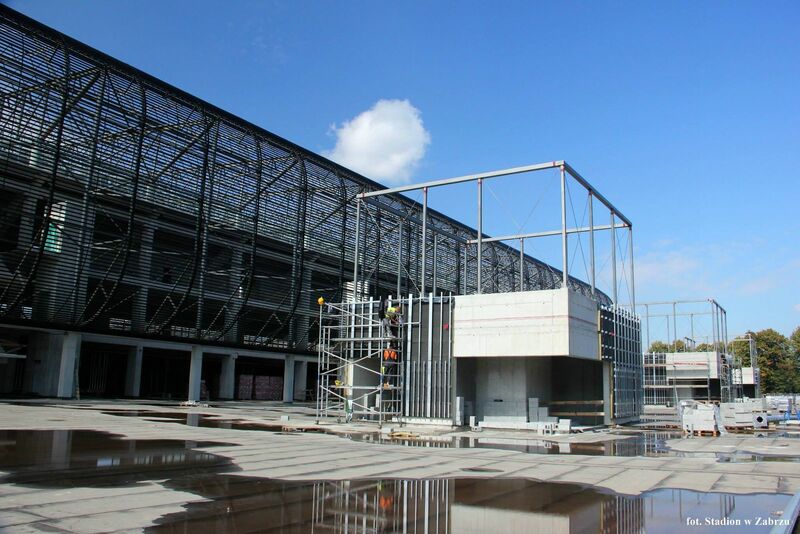 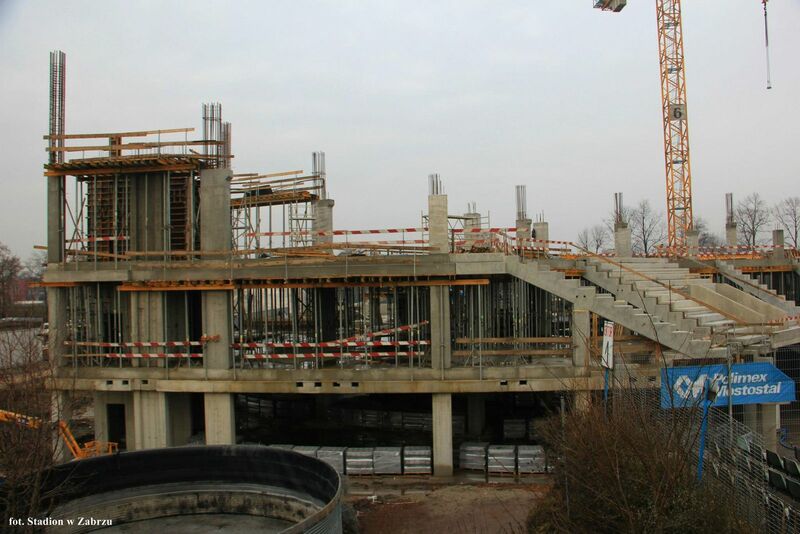 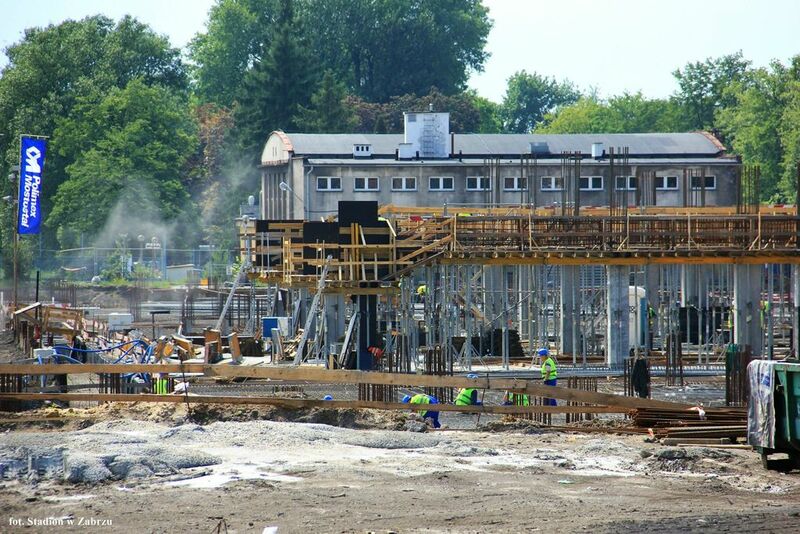 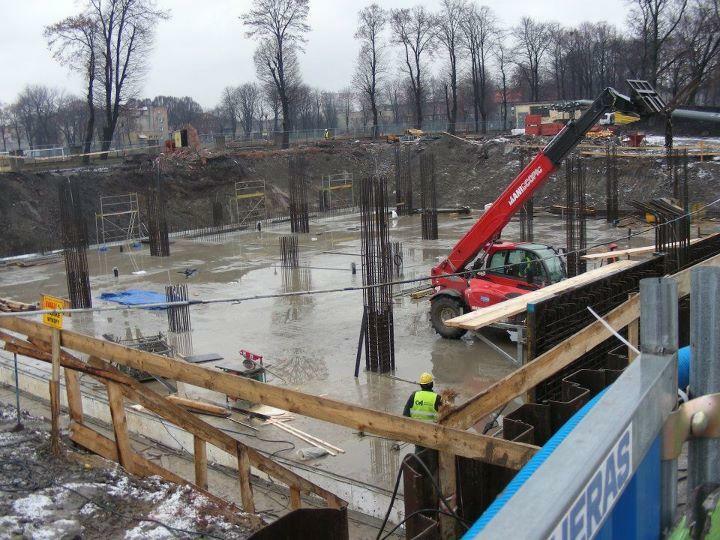 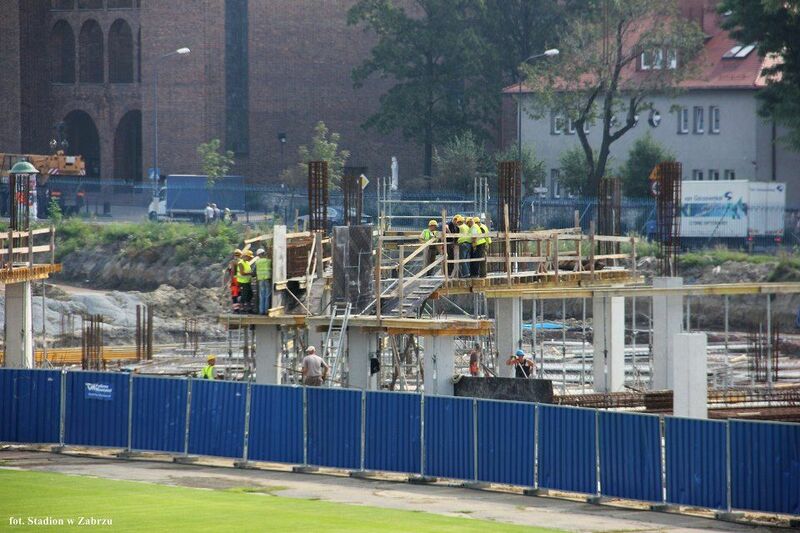 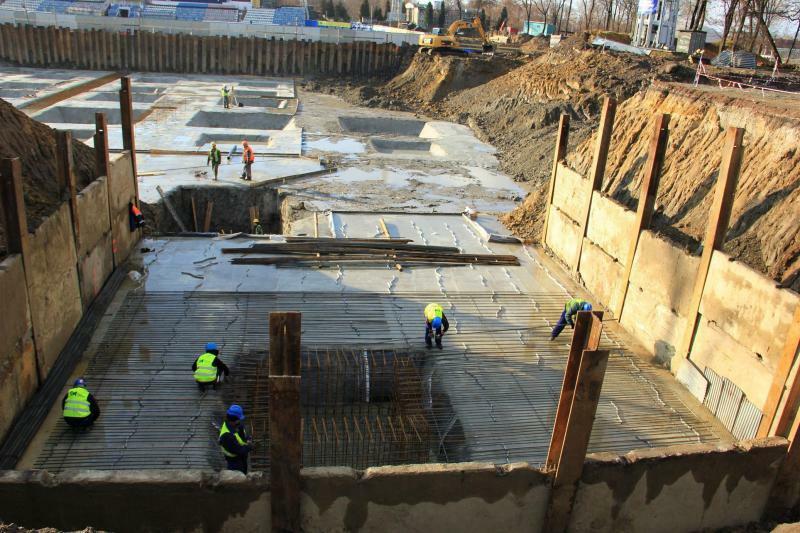 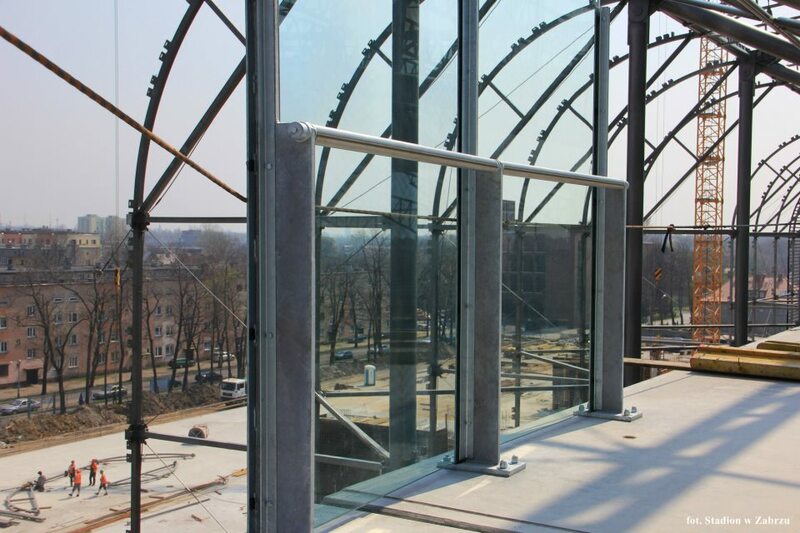 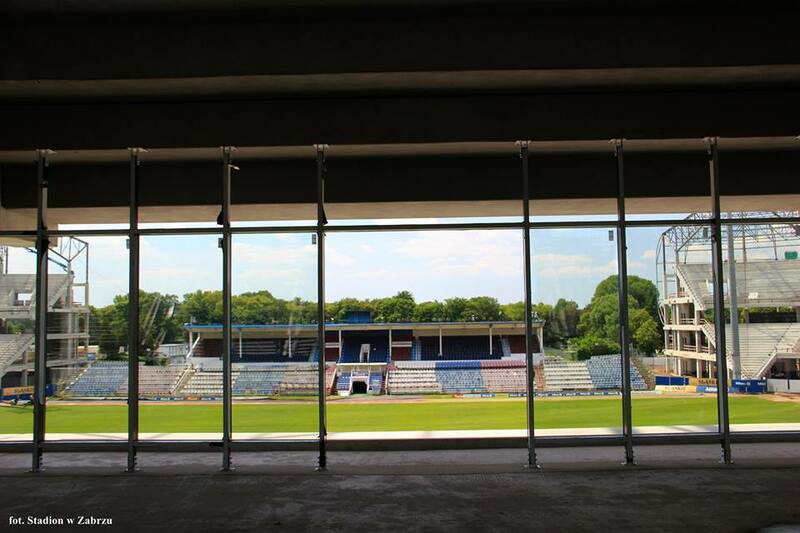 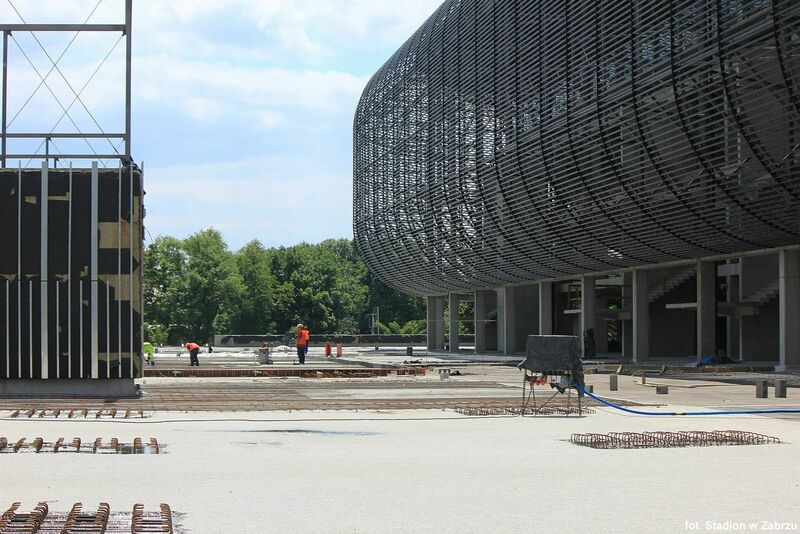 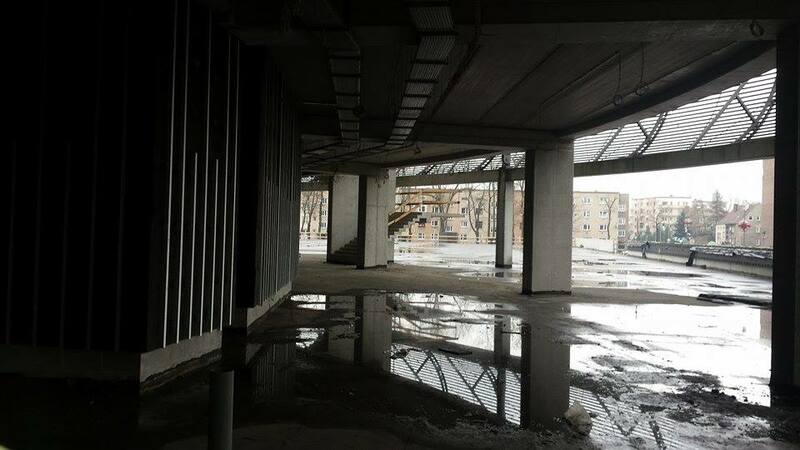 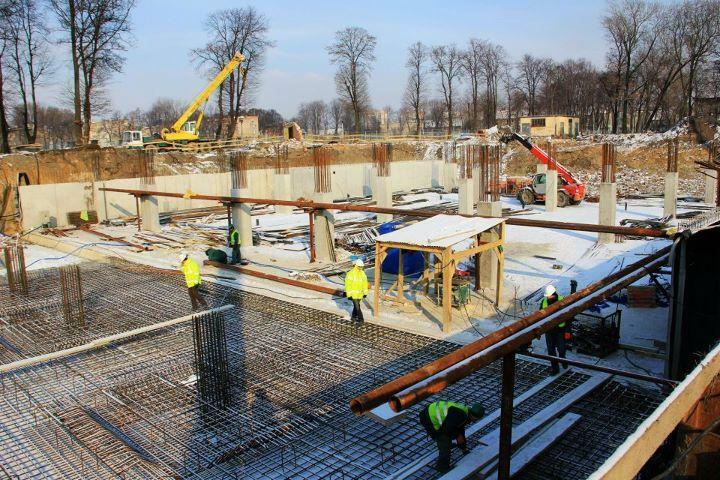 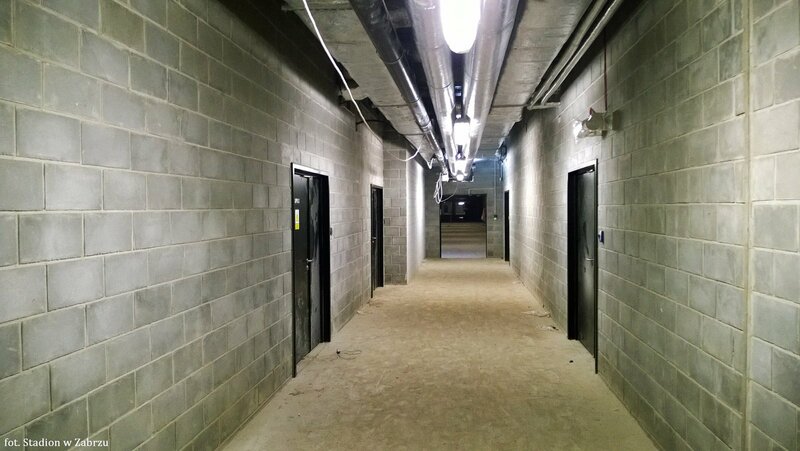 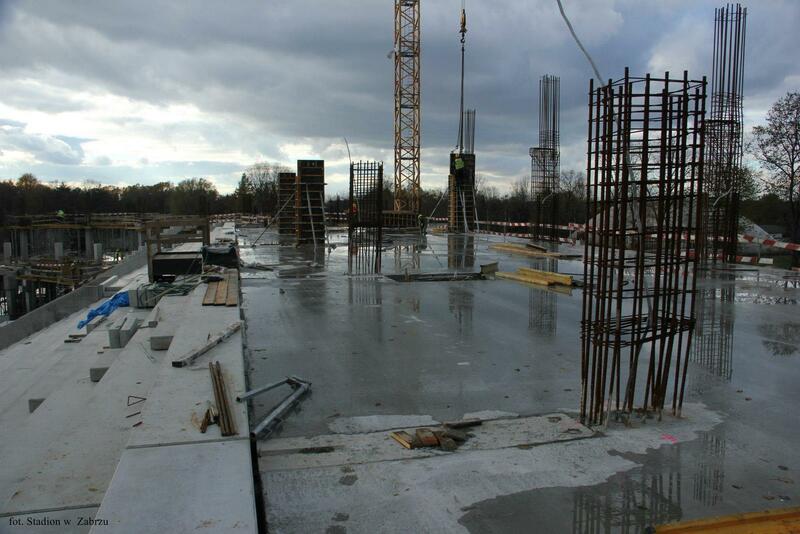 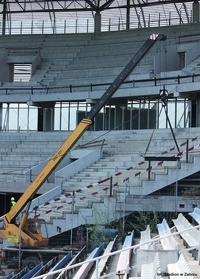 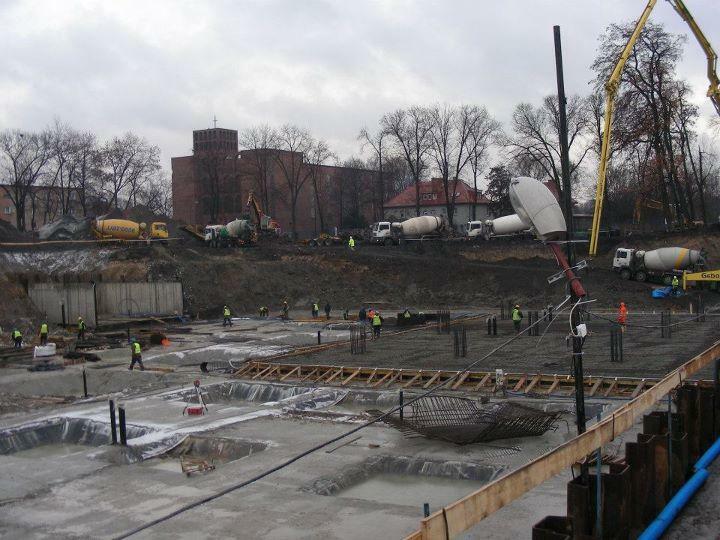 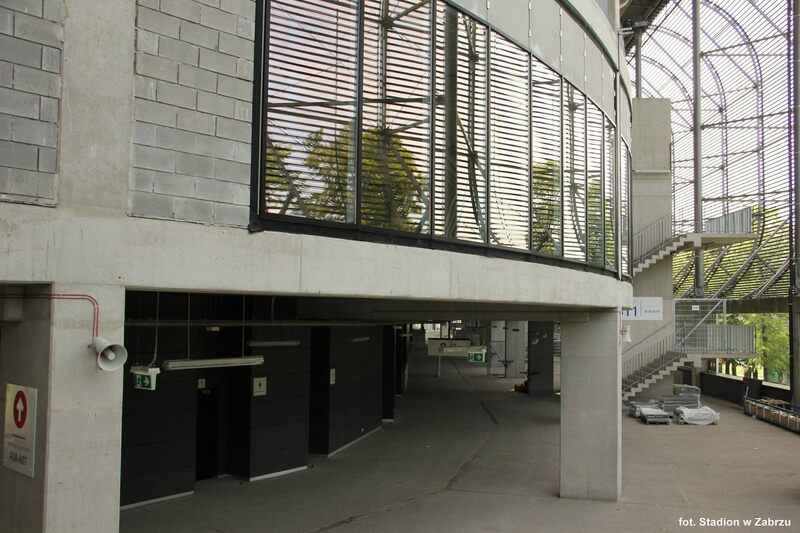 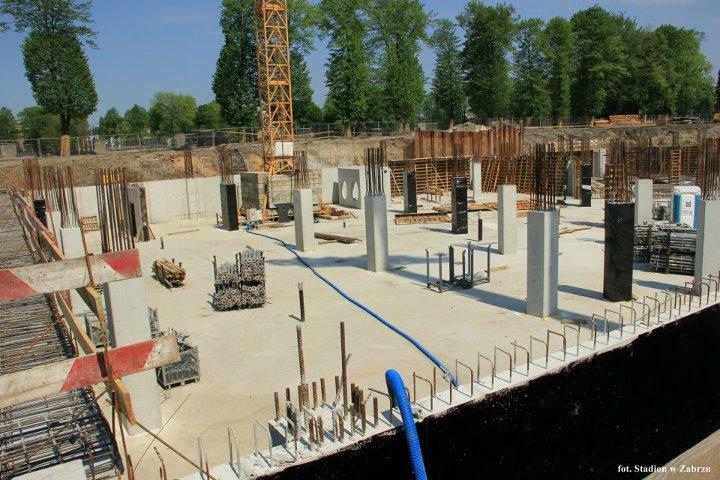 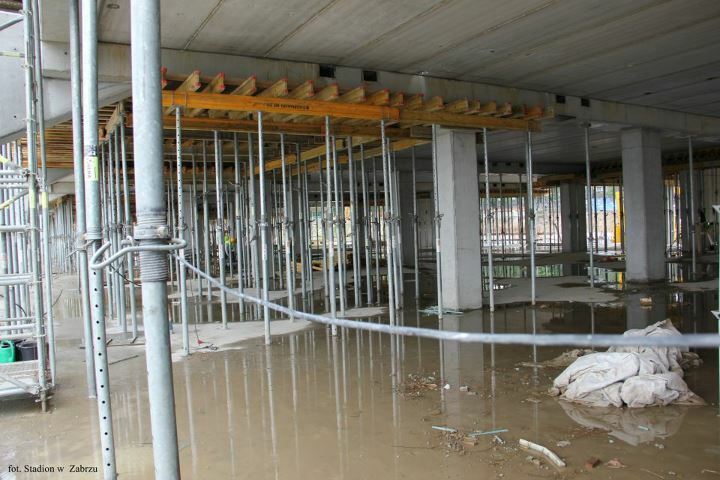 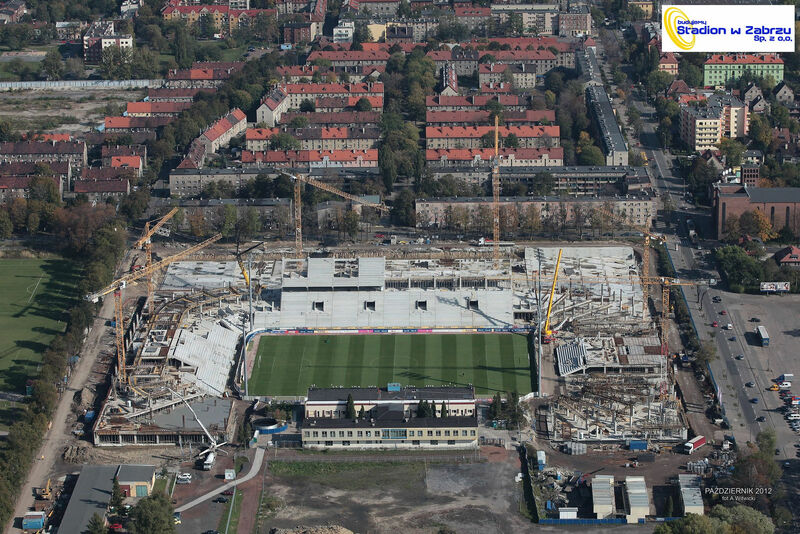 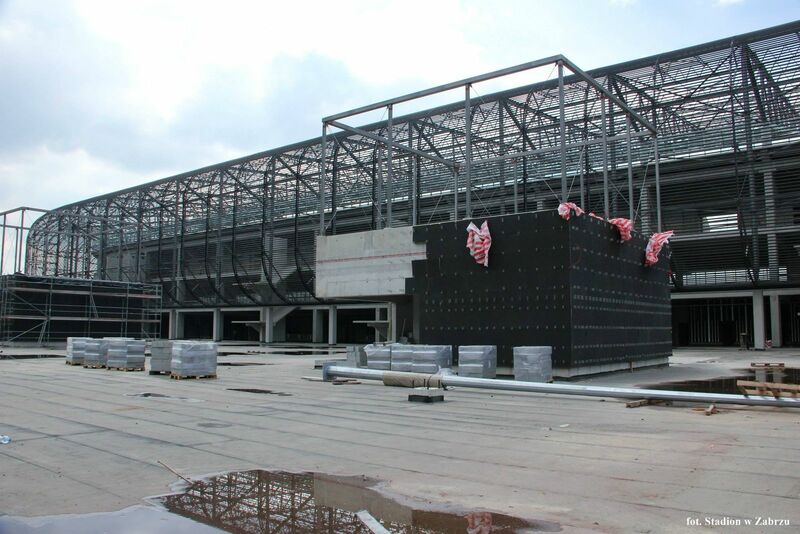 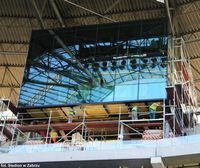 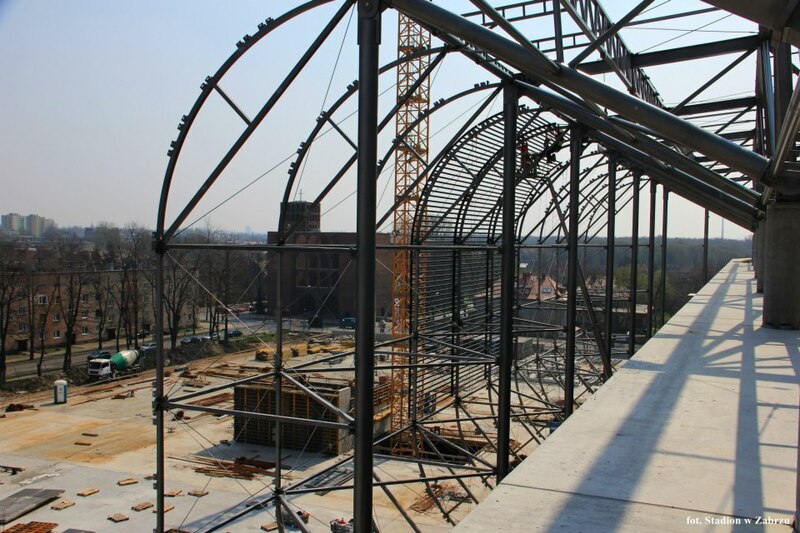 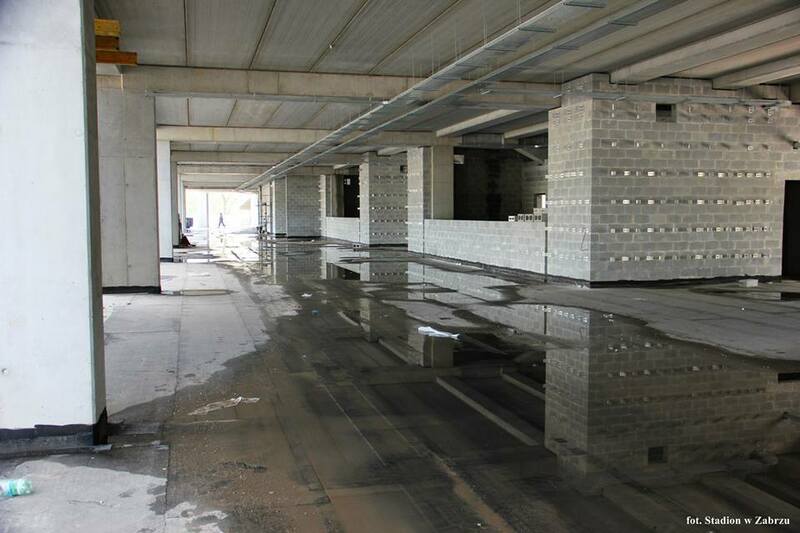 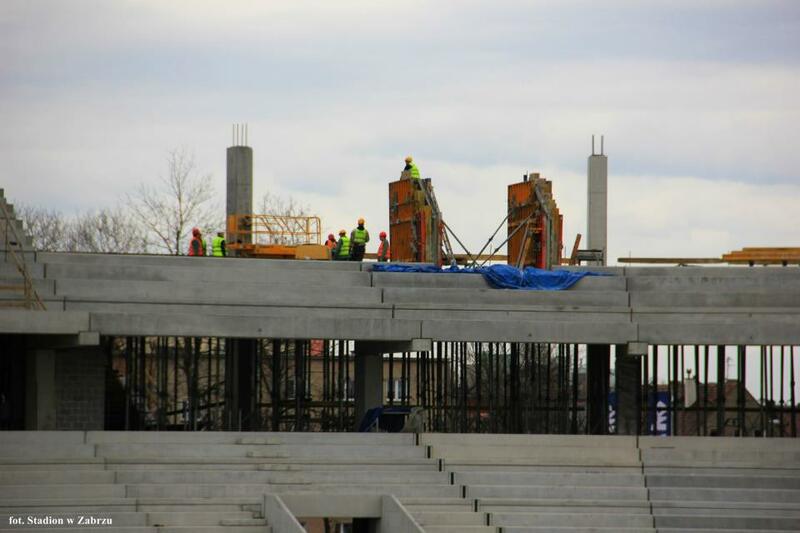 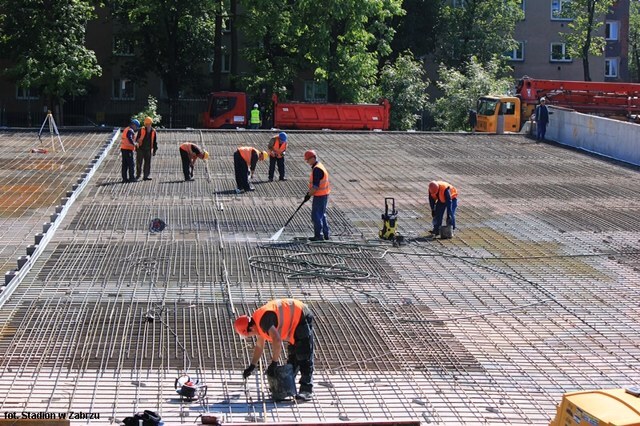 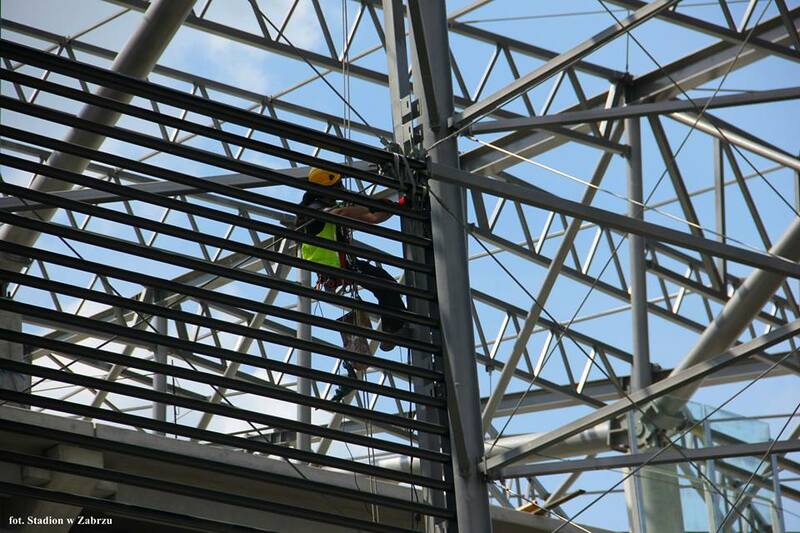 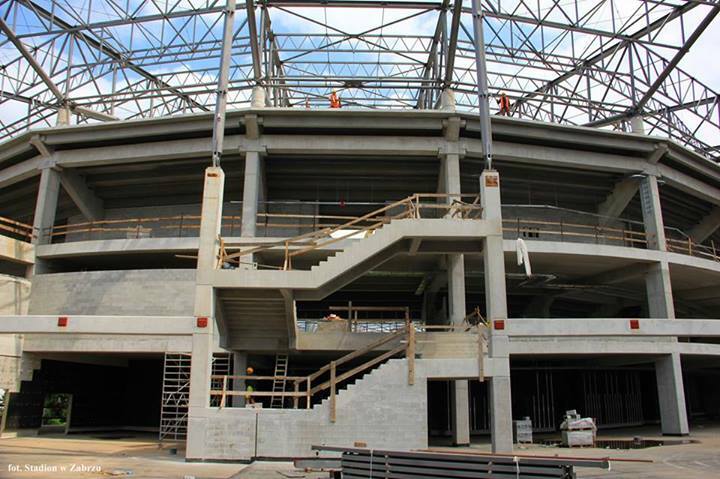 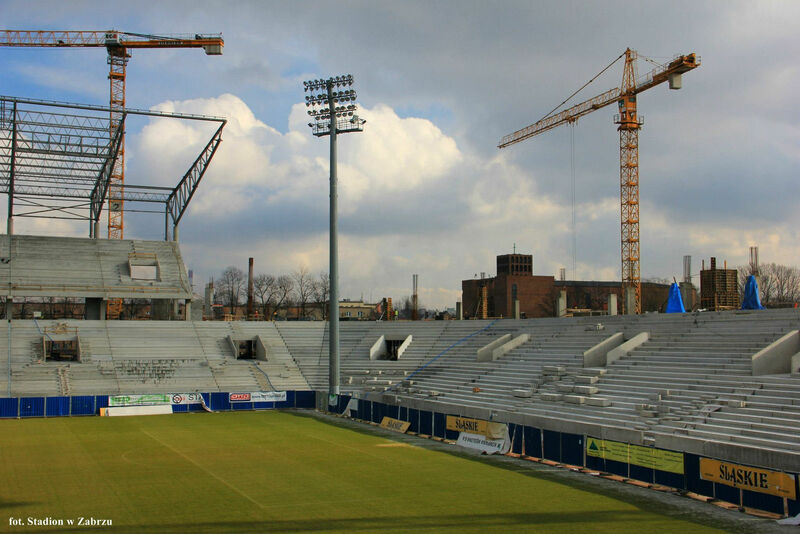 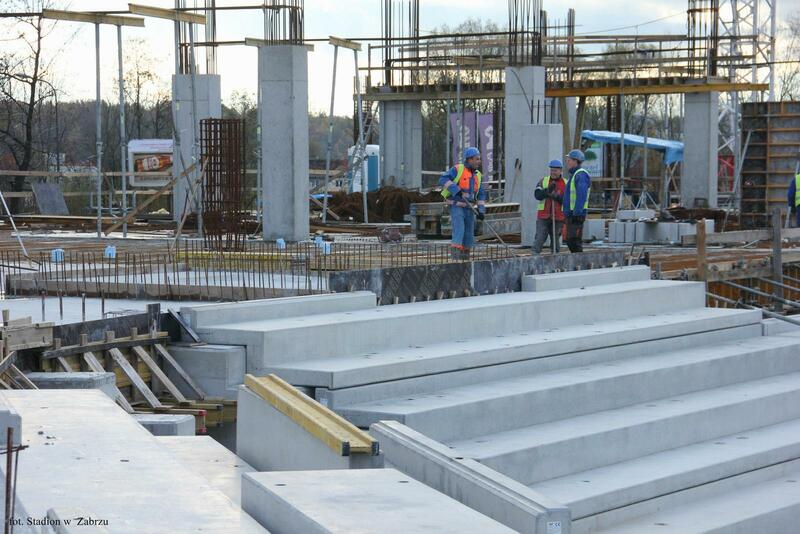 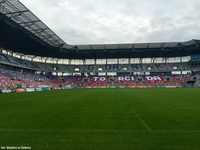 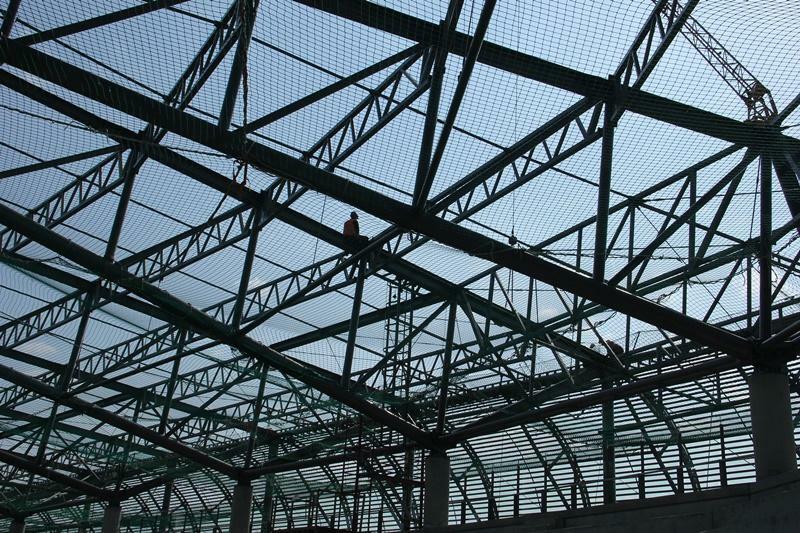 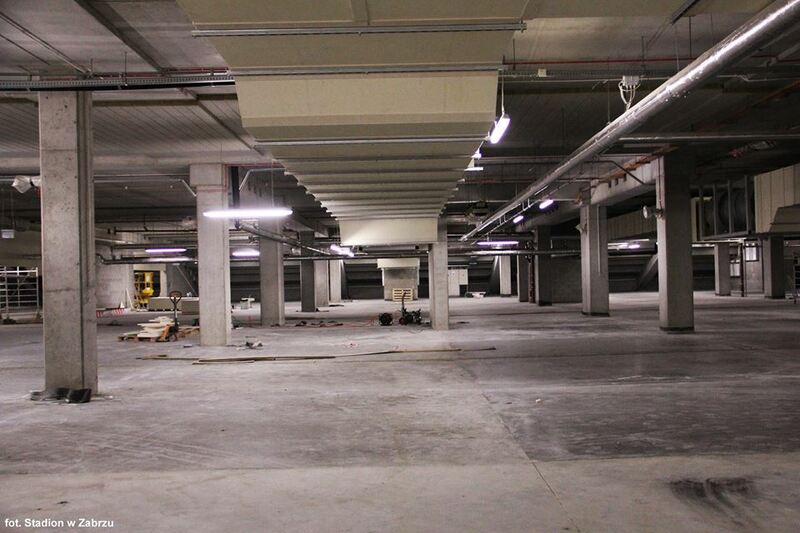 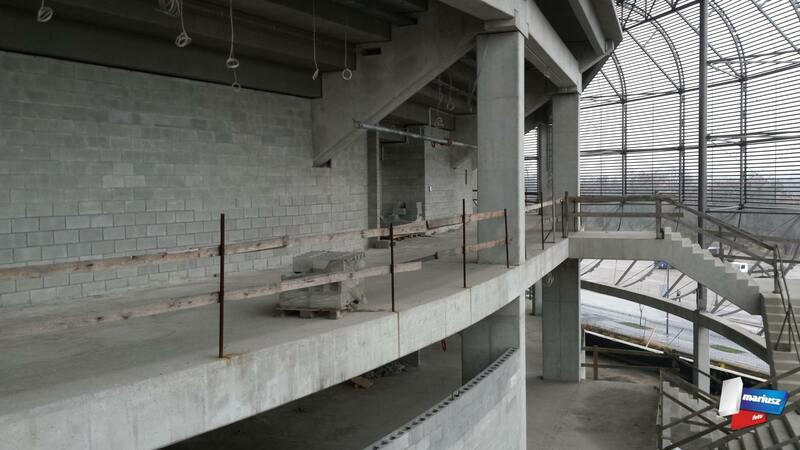 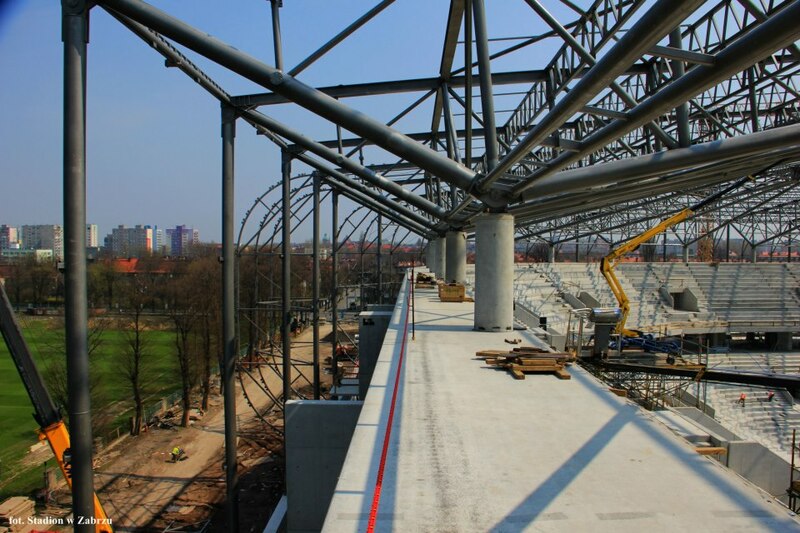 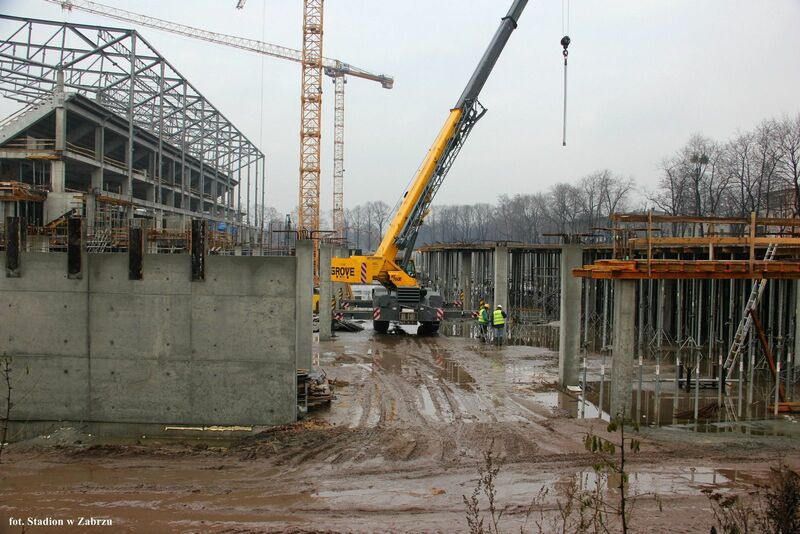 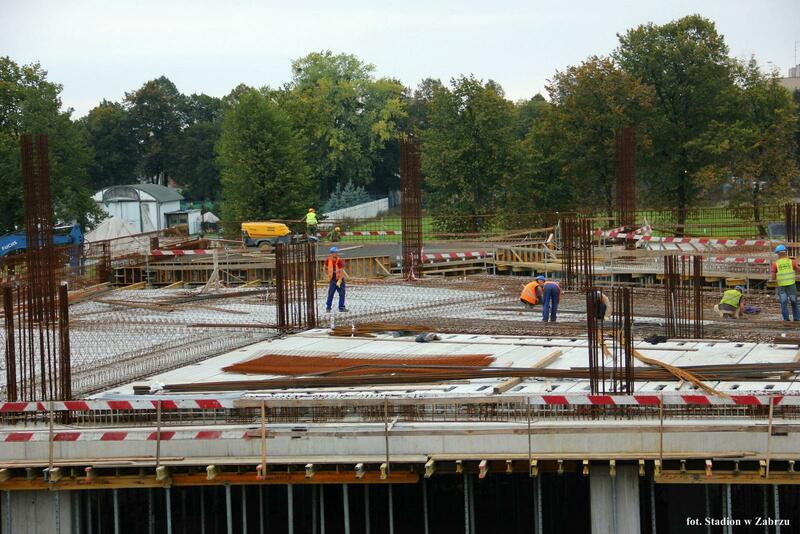 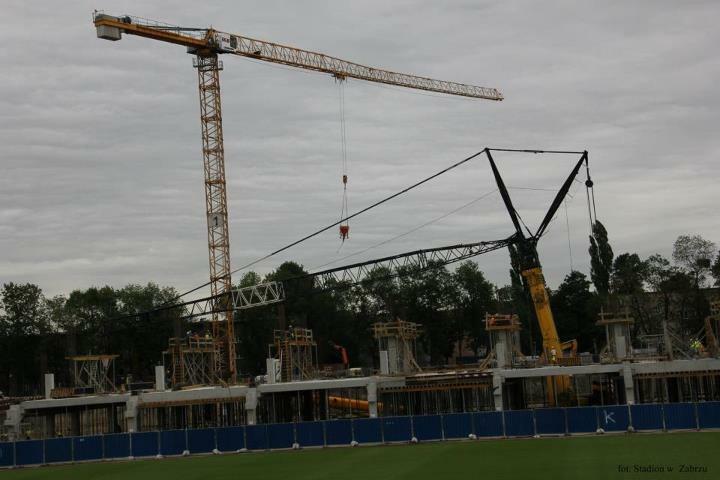 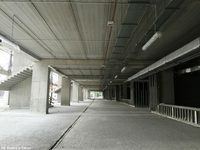 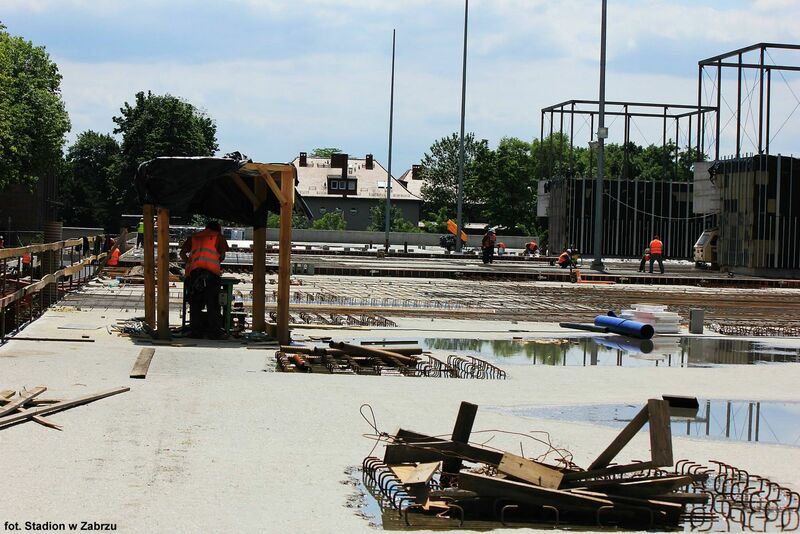 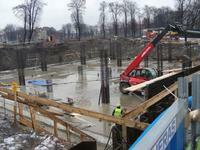 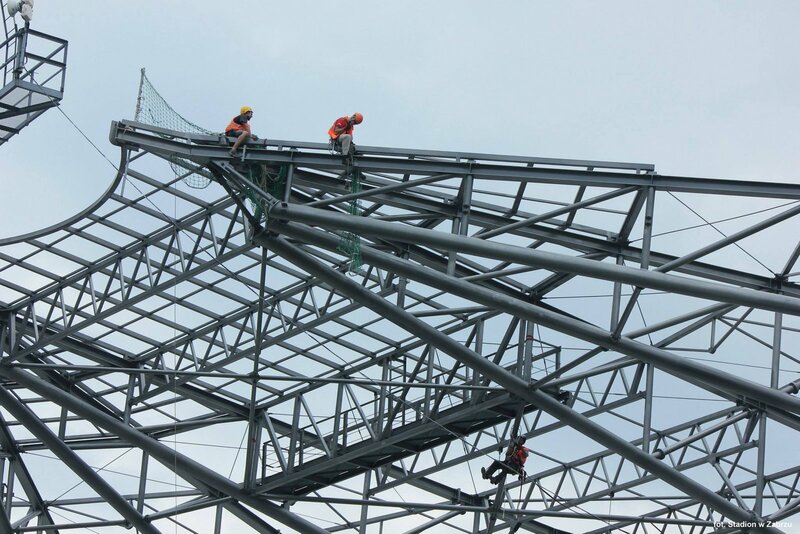 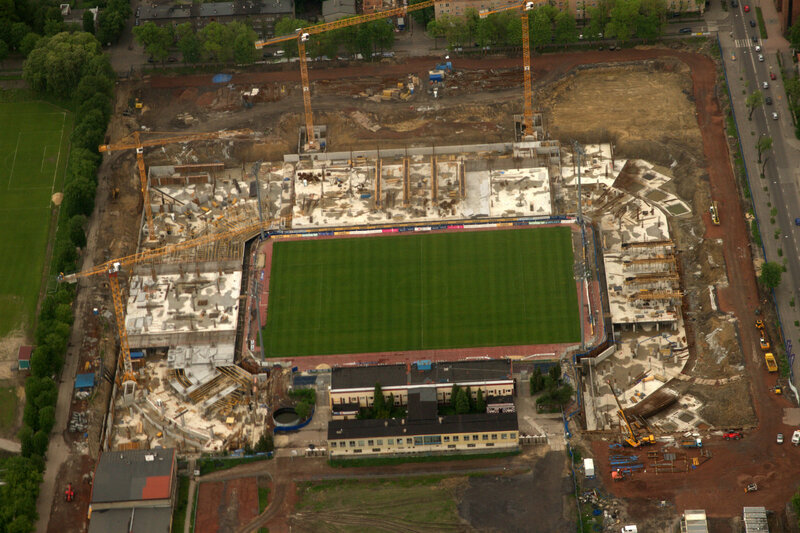 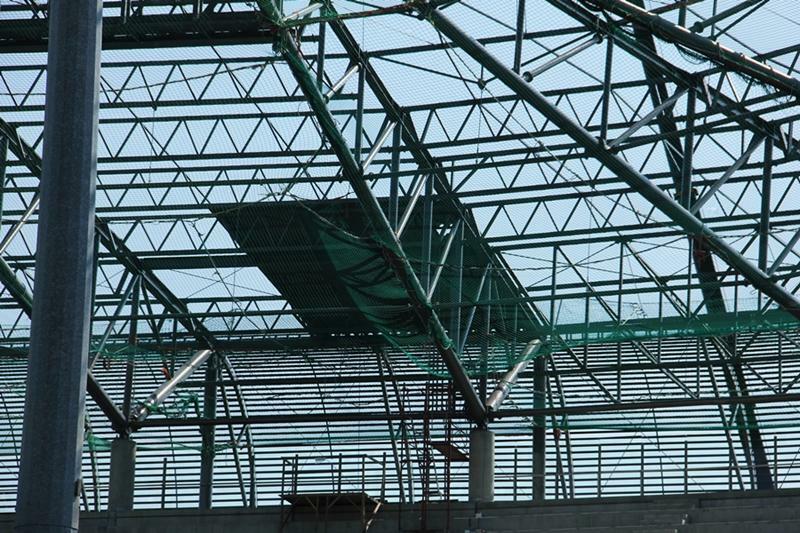 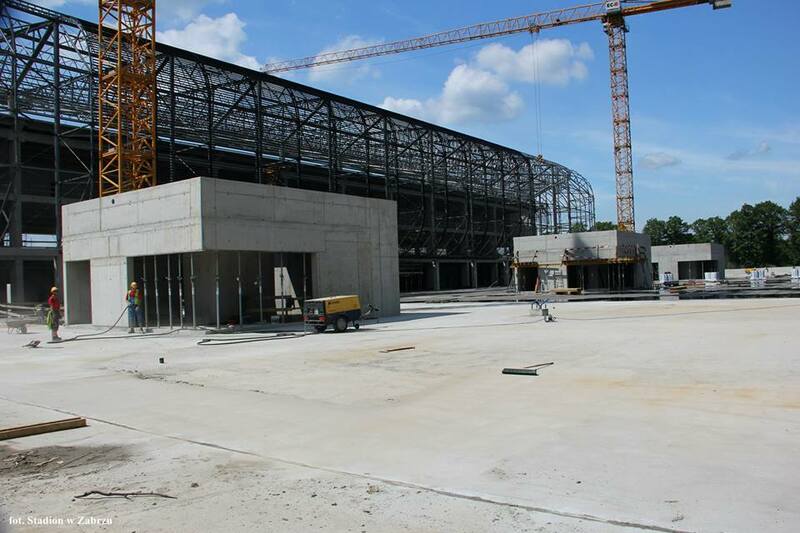 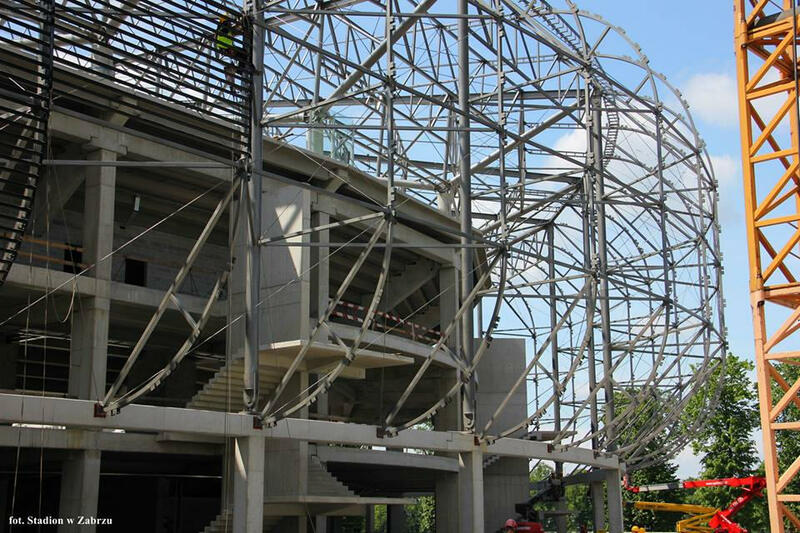 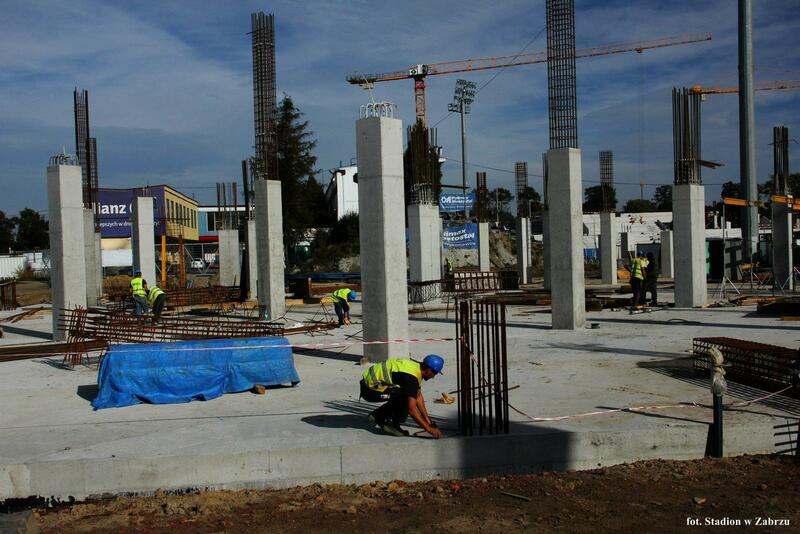 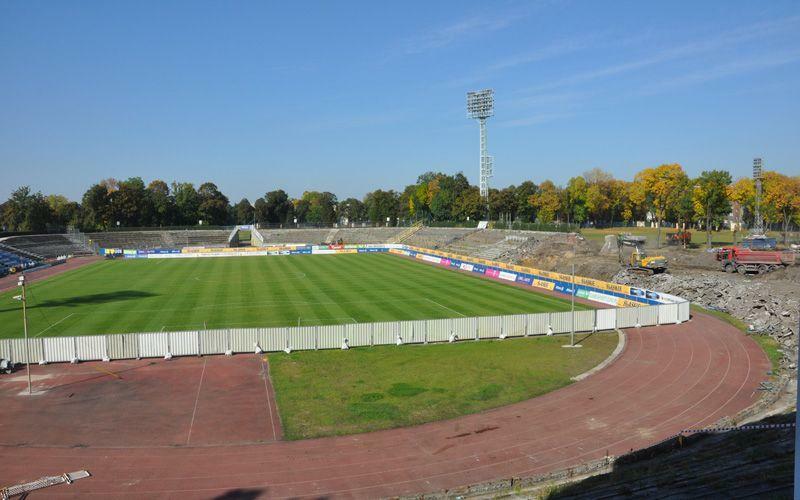 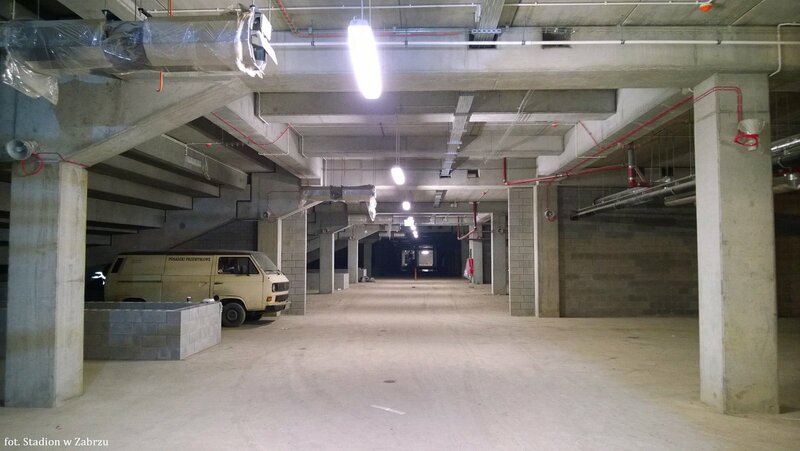 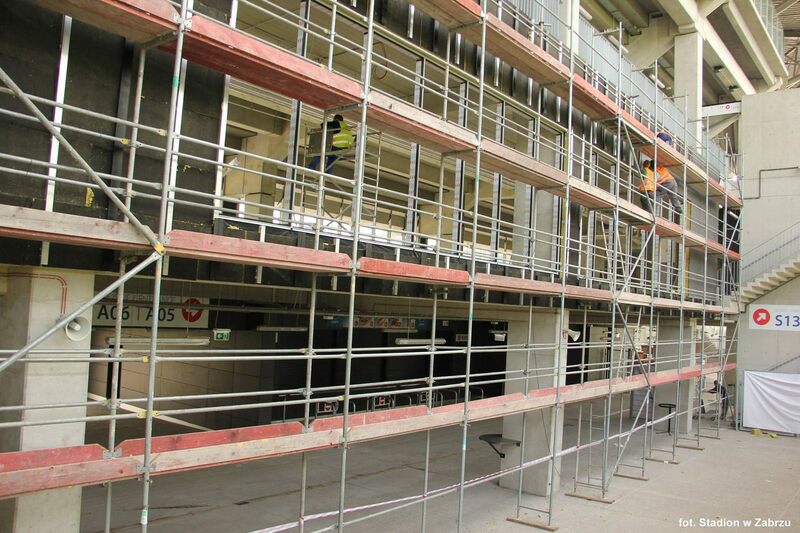 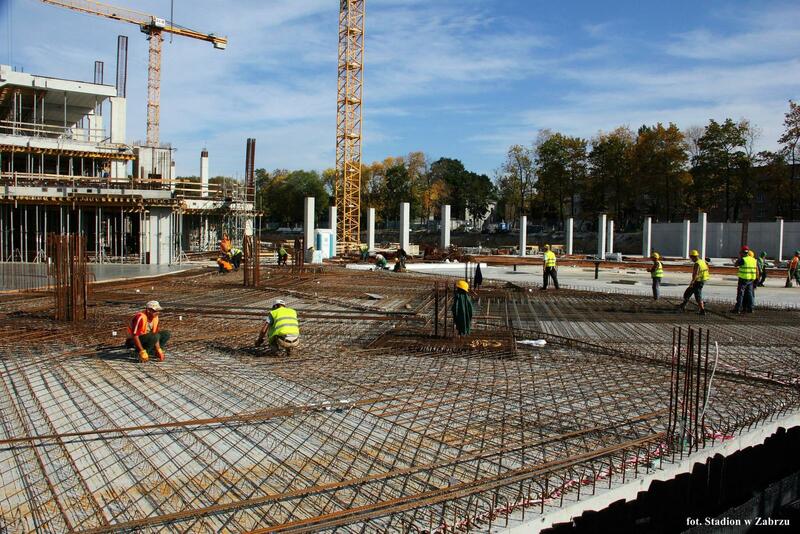 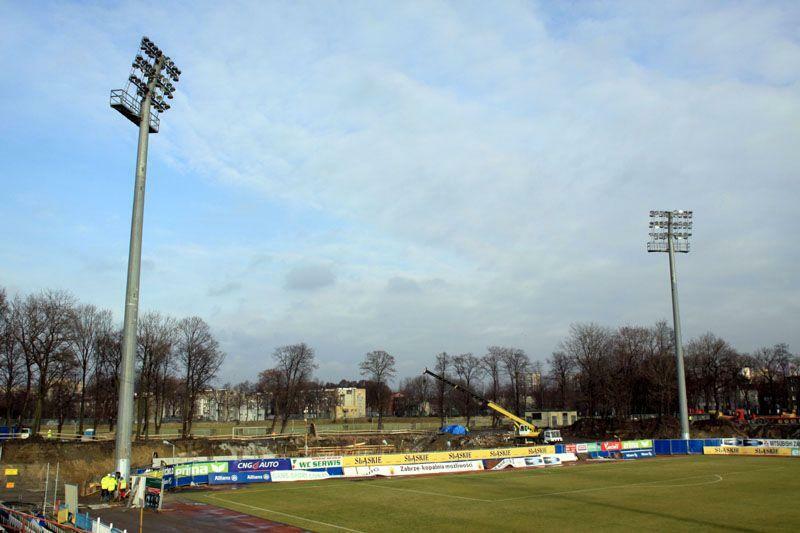 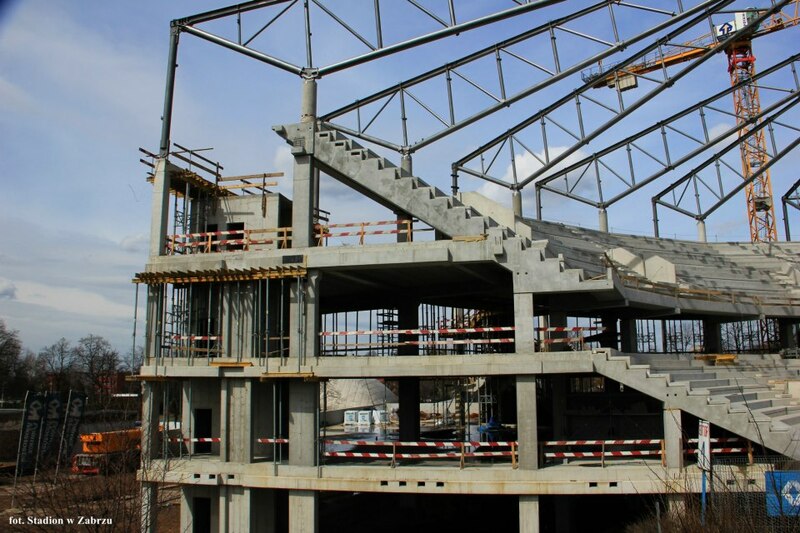 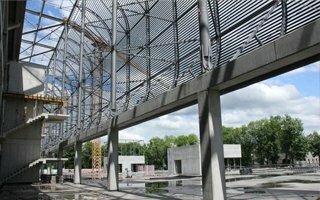 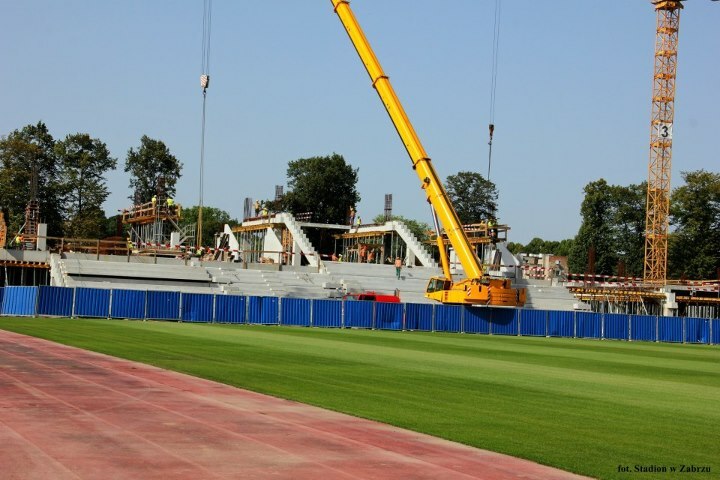 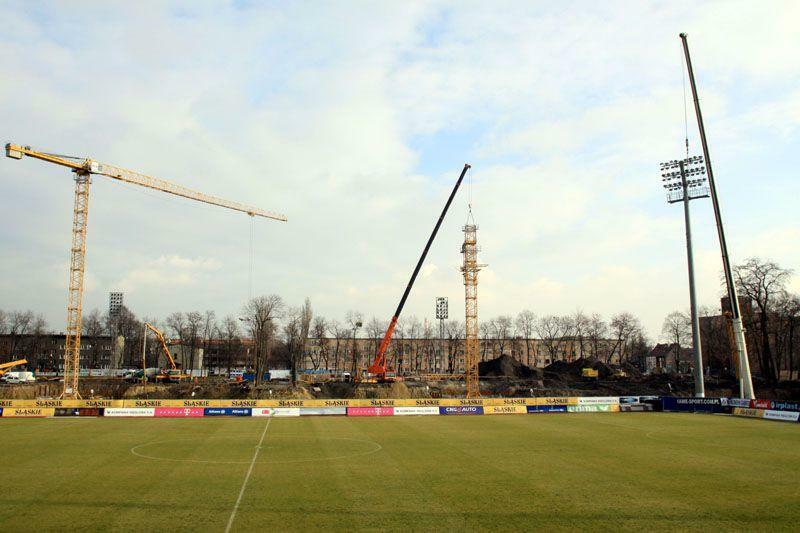 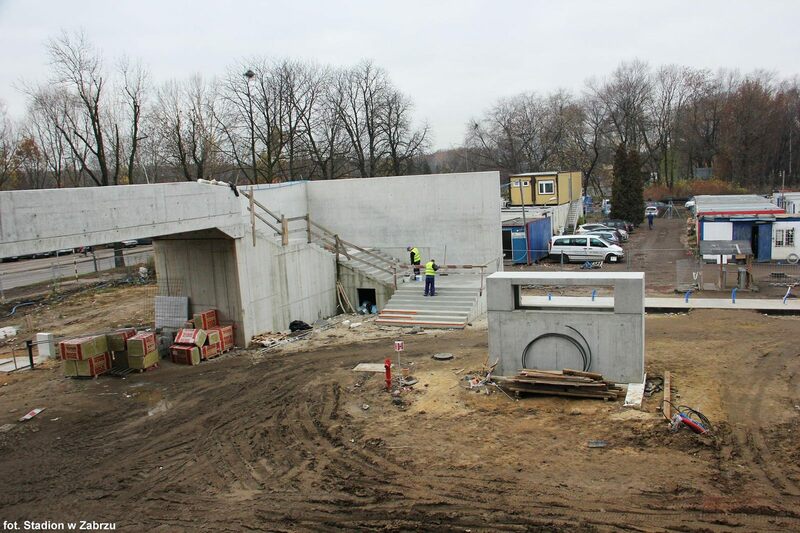 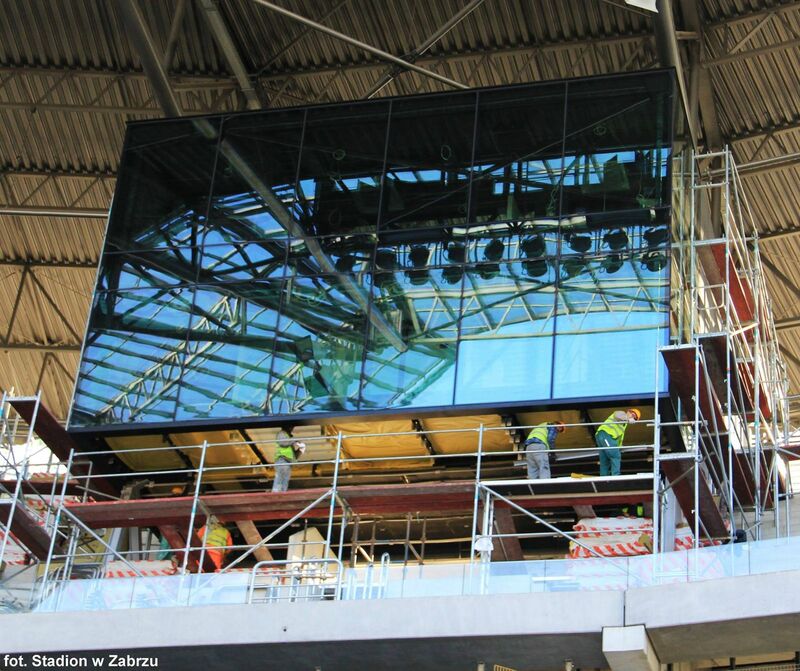 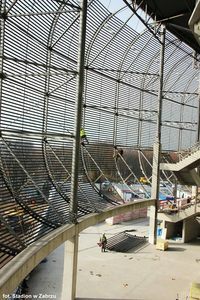 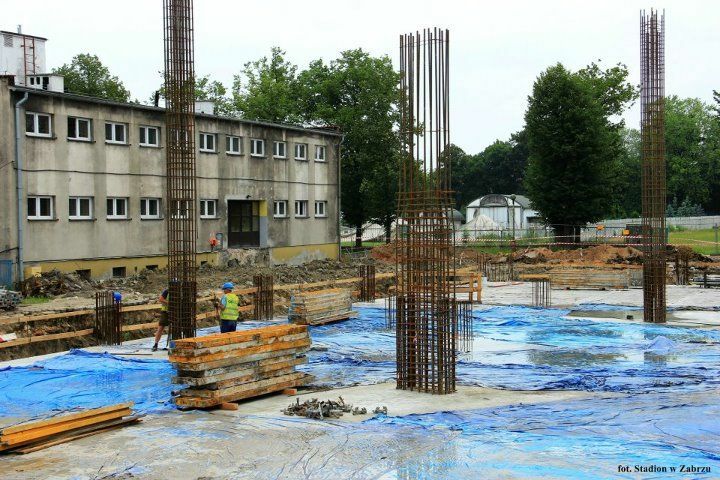 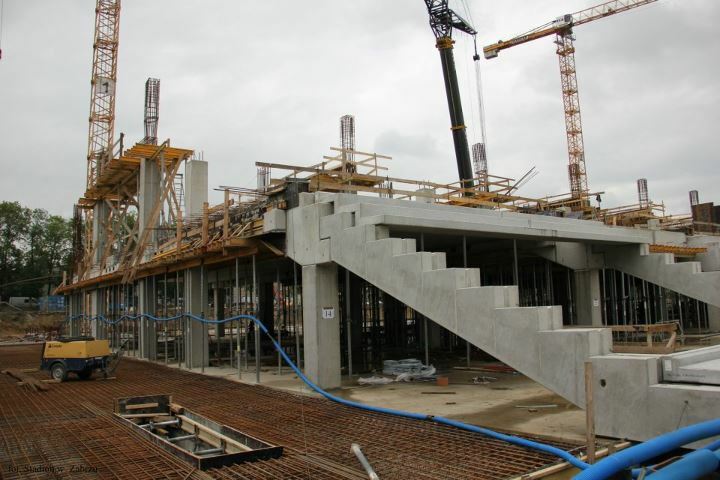 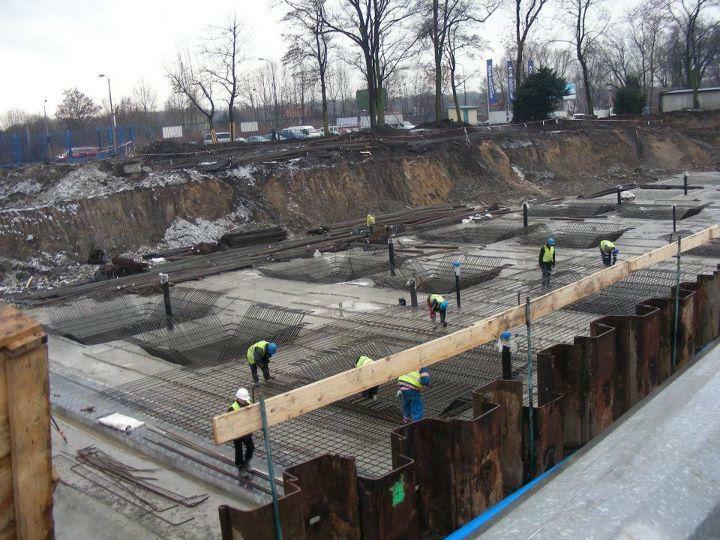 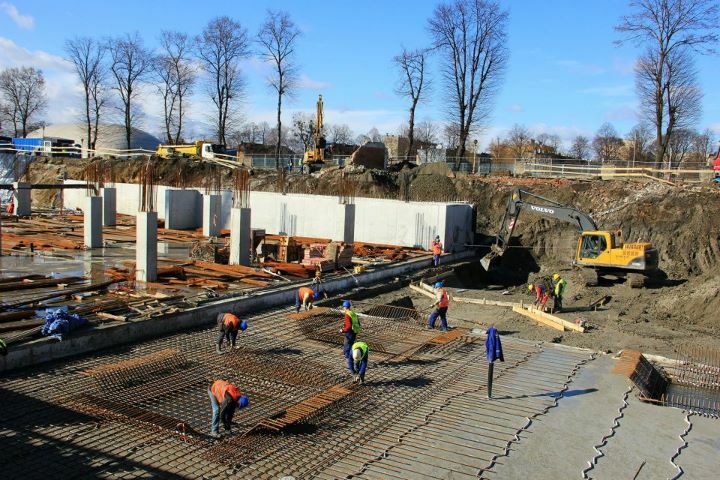 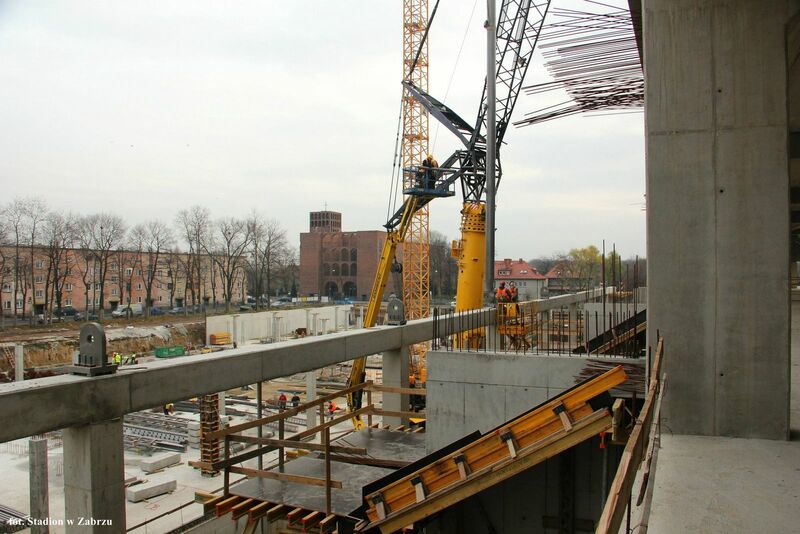 Throughout the construction process venue is to be used by Gornik Zabrze. 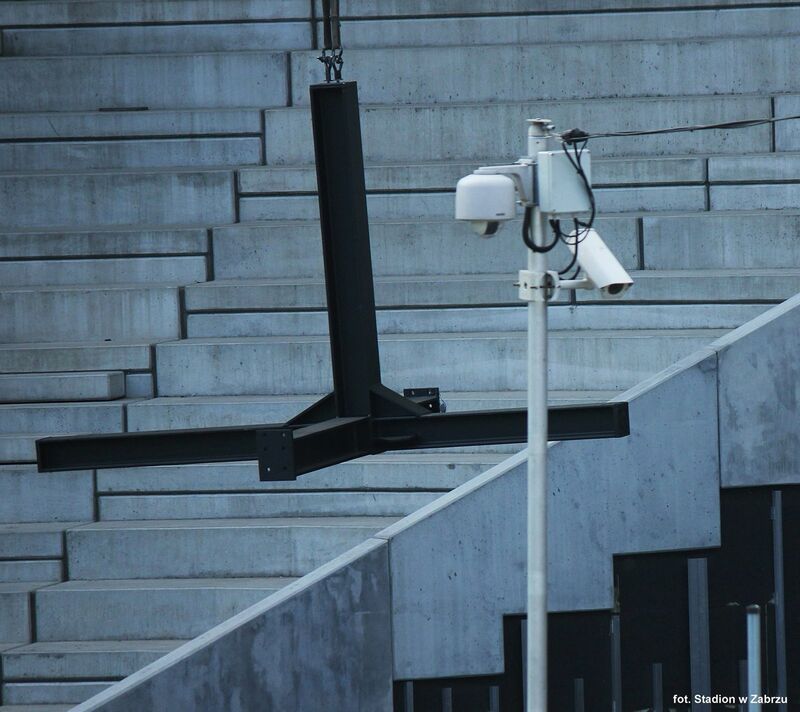 Three modern sides and one that used to commemorate Hitler. 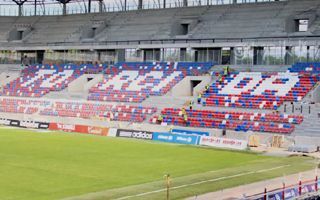 Time to change it, say fans of Górnik Zabrze, who are the only ones in Poland buying 100% of available tickets this season. 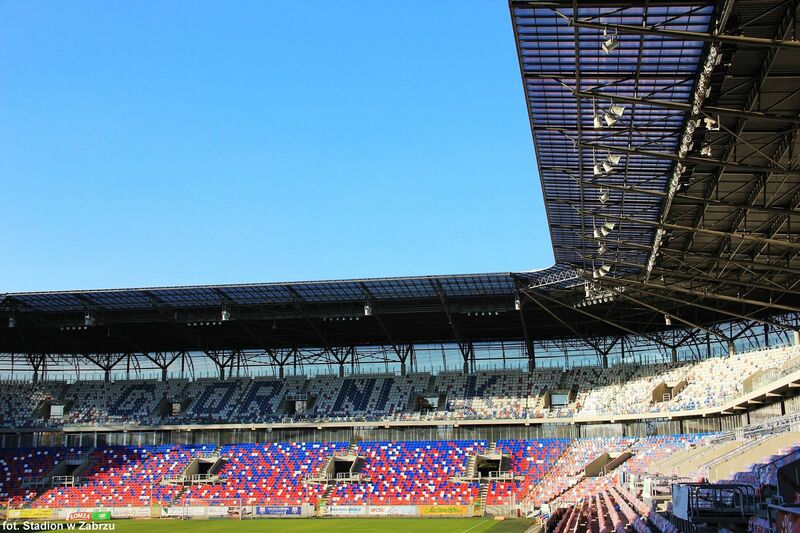 Nazi references work well in politics, so why not at StadiumDB? 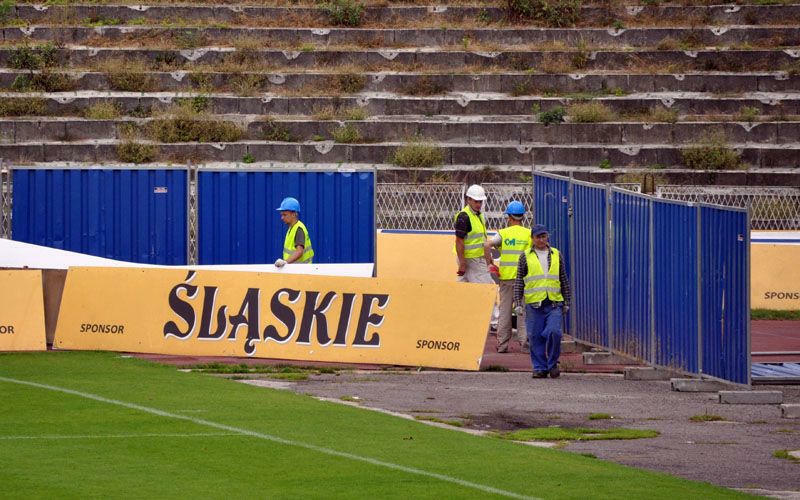 Especially when they’re so well deserved. 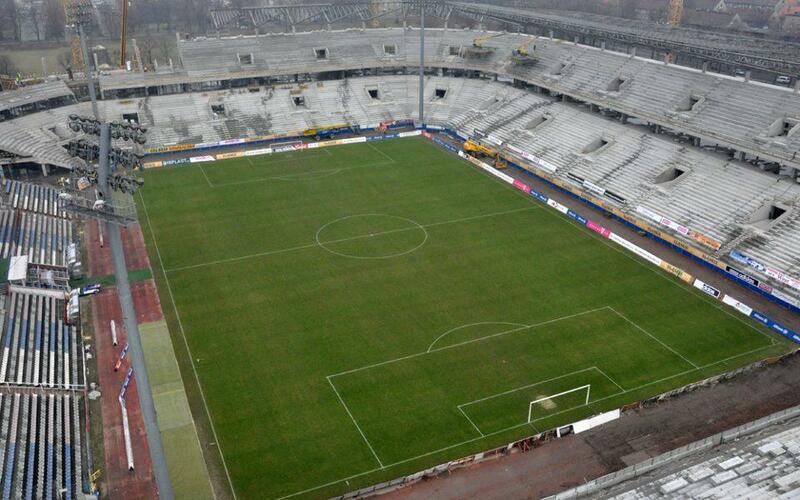 After all, Adolf Hitler was this stadium’s first name-holder! 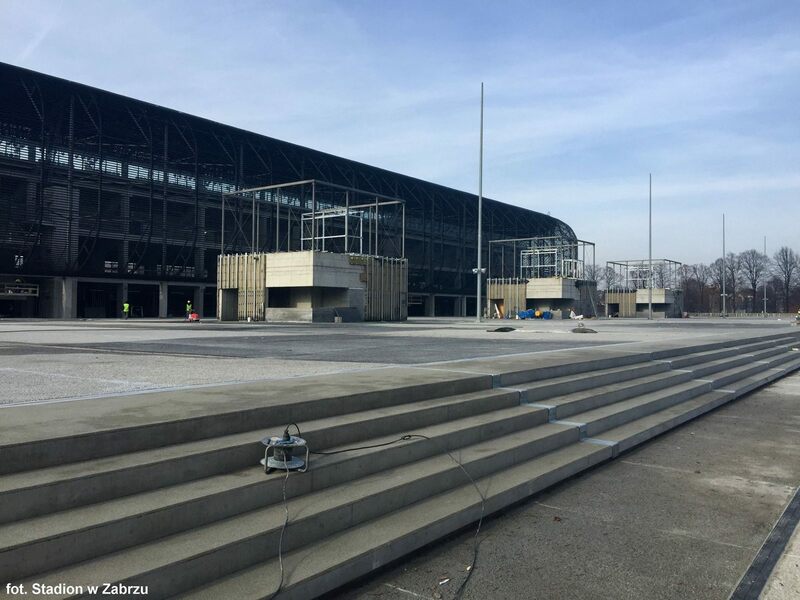 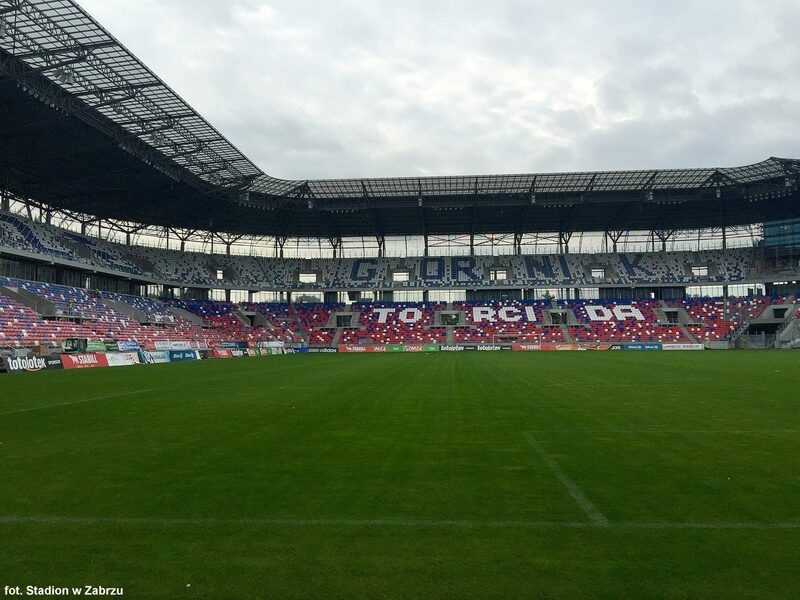 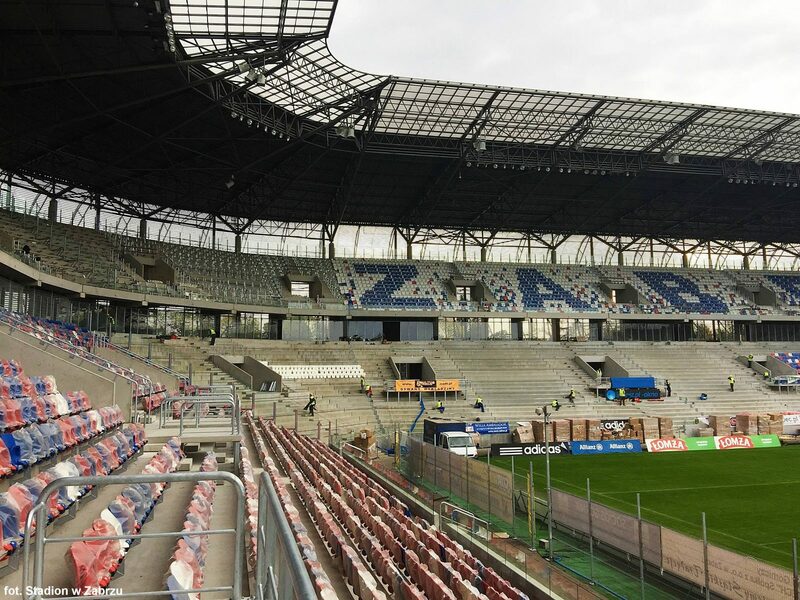 Countdown begins, but opening of the newly-renamed Arena Zabrze isn’t certain just yet. 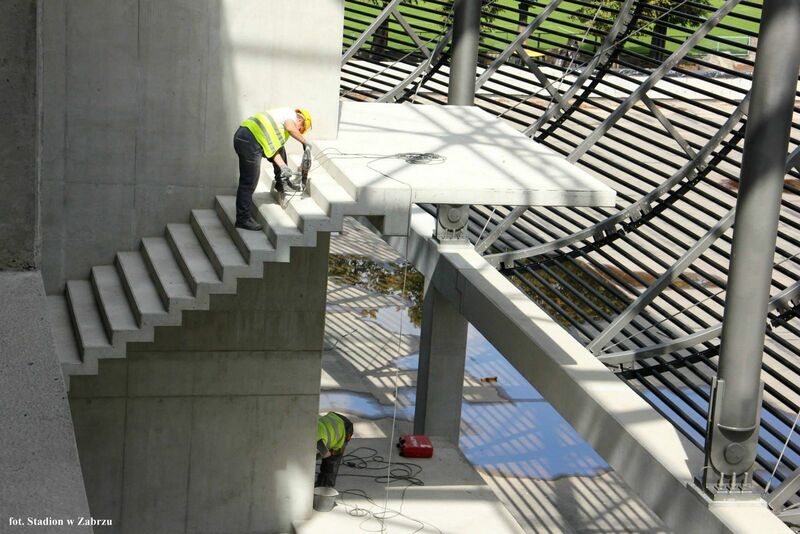 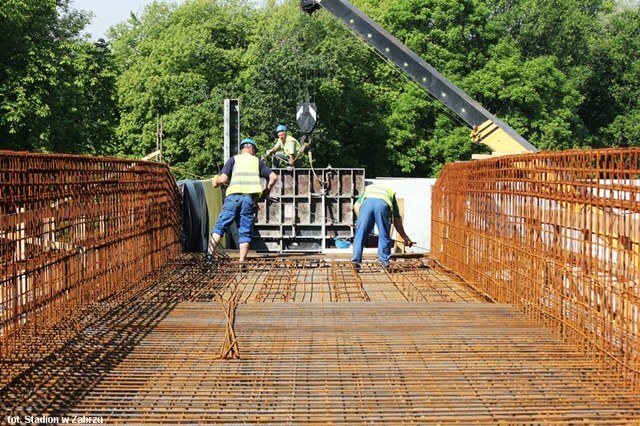 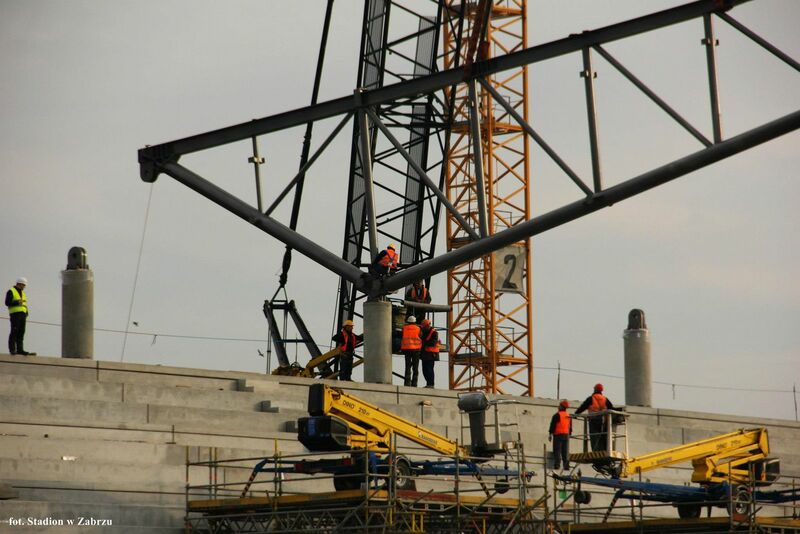 400 workers are on site daily to make sure Poland’s most honoured derby takes place! 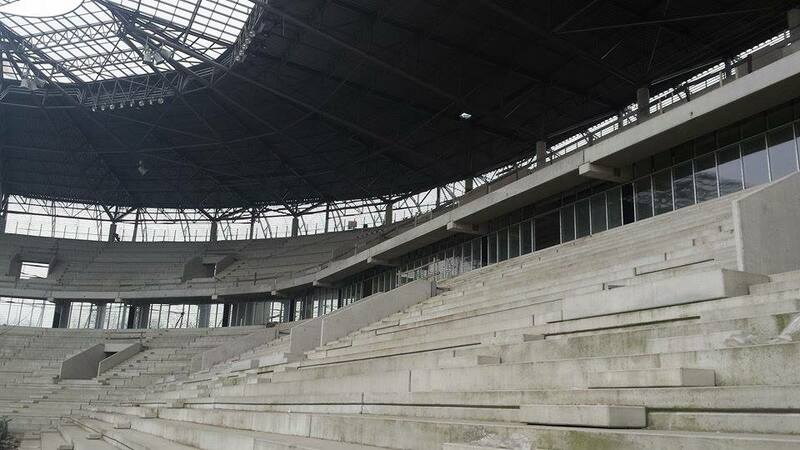 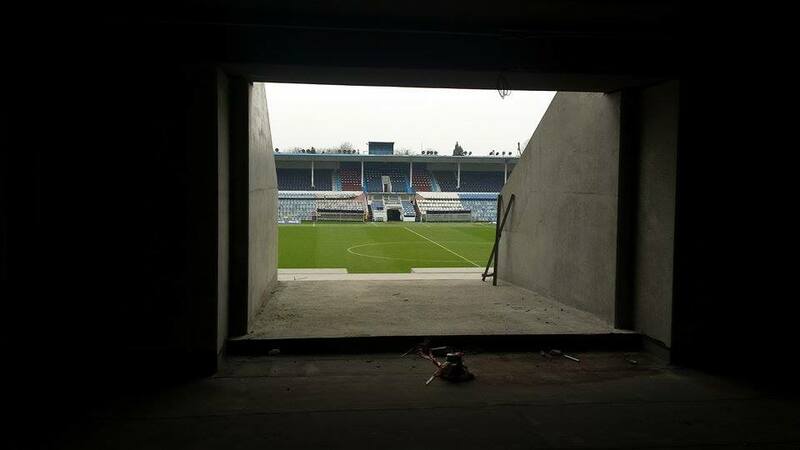 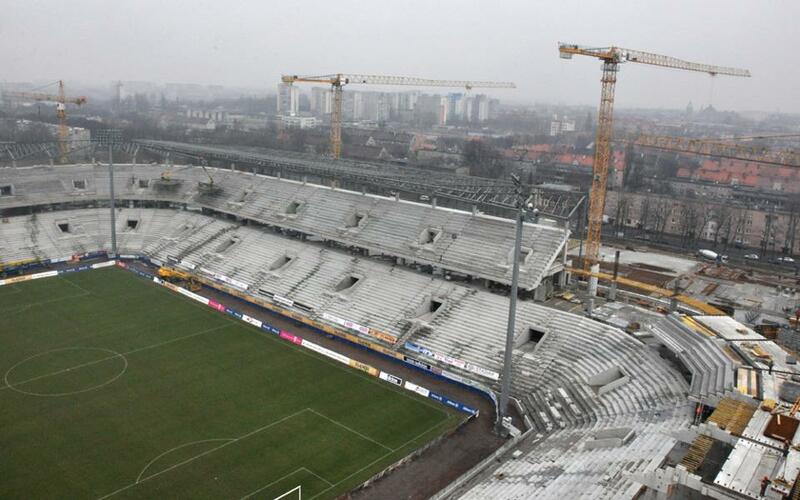 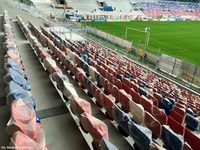 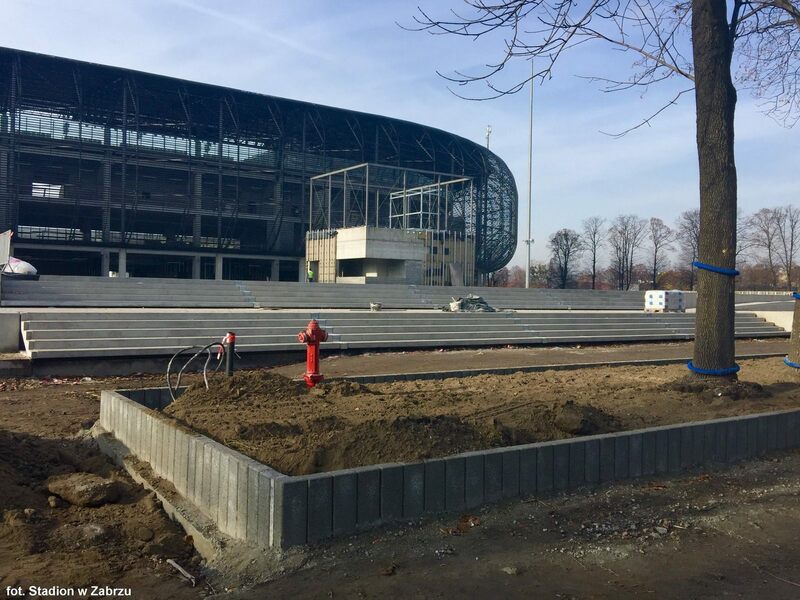 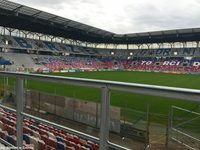 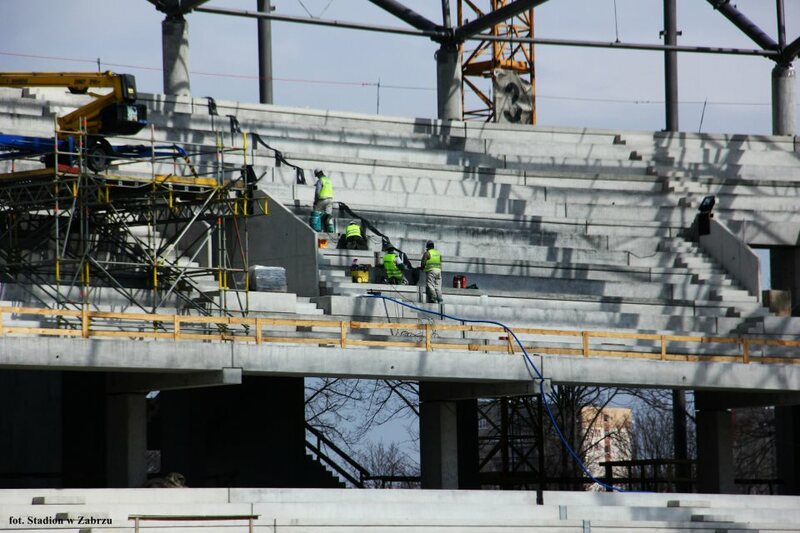 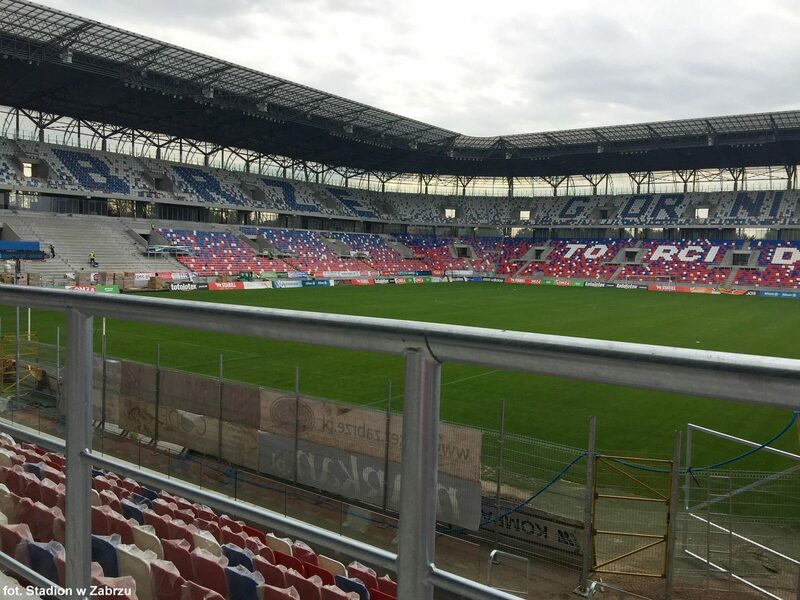 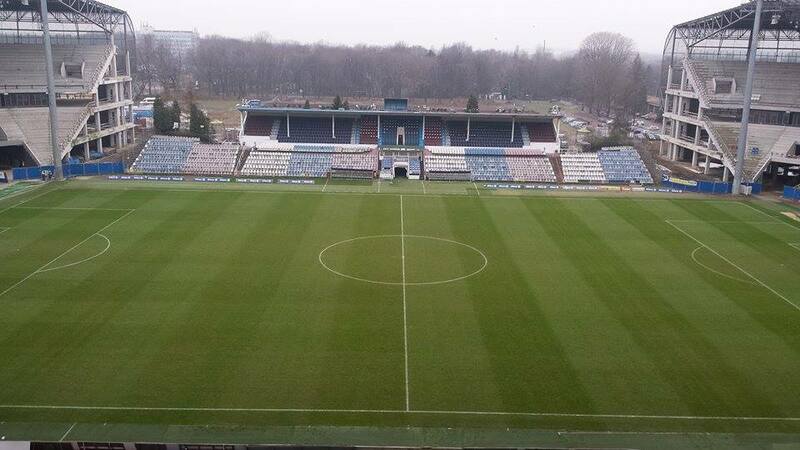 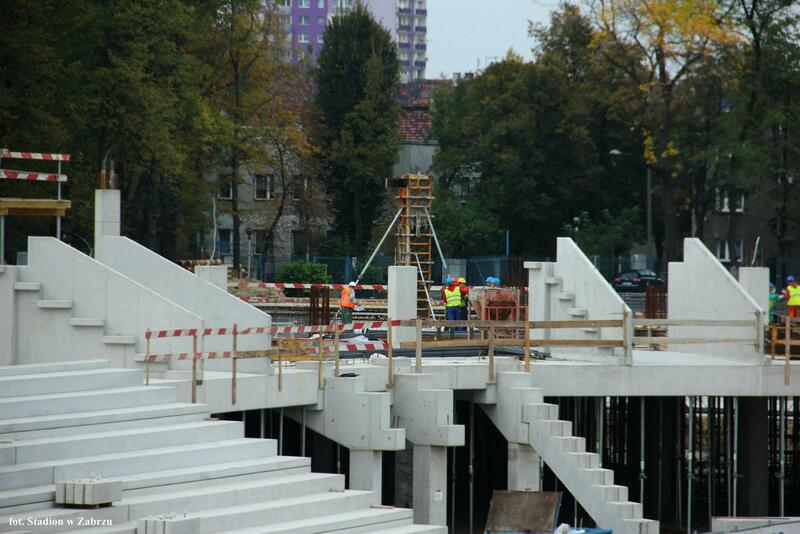 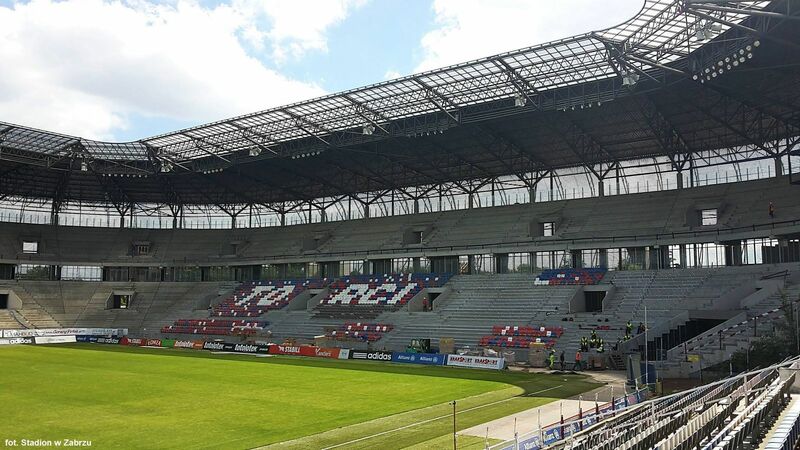 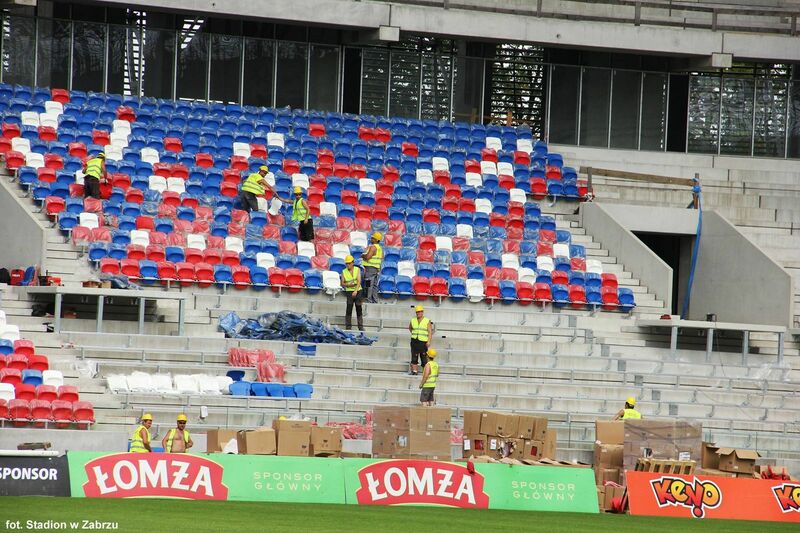 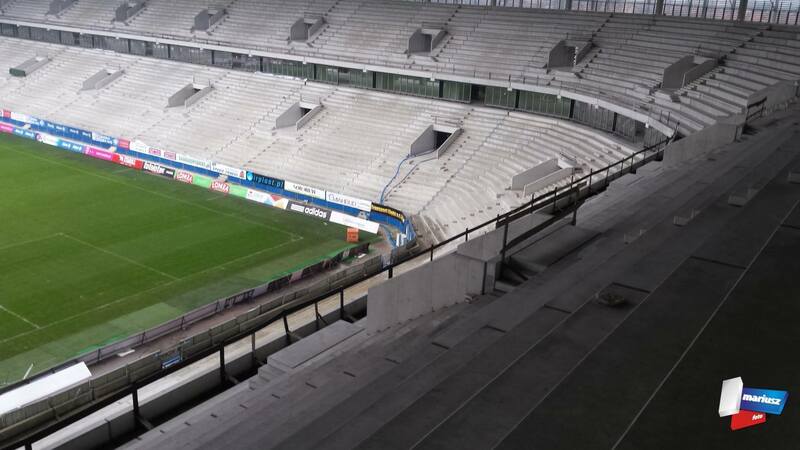 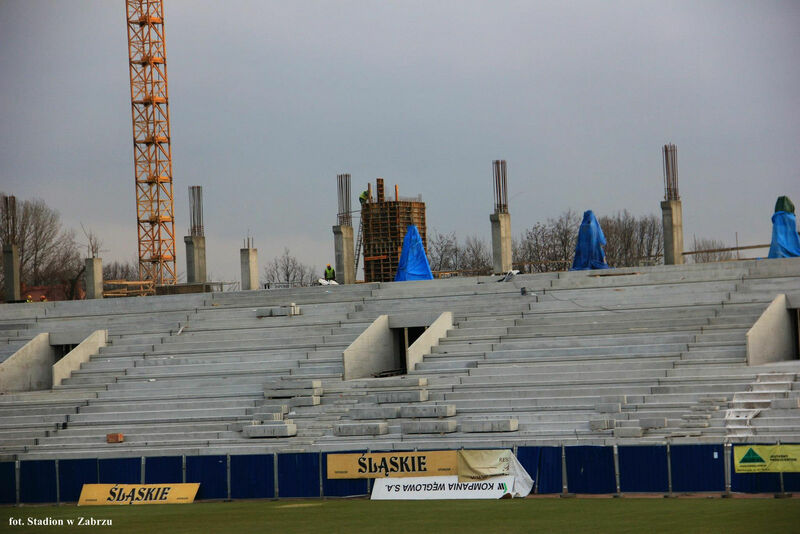 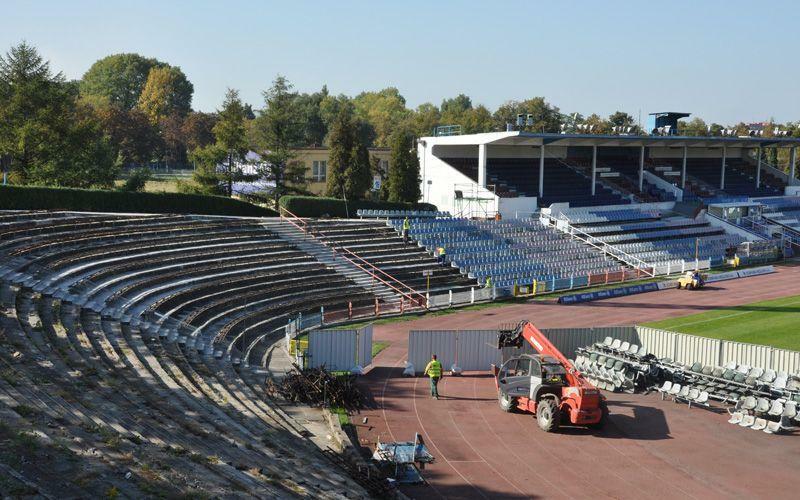 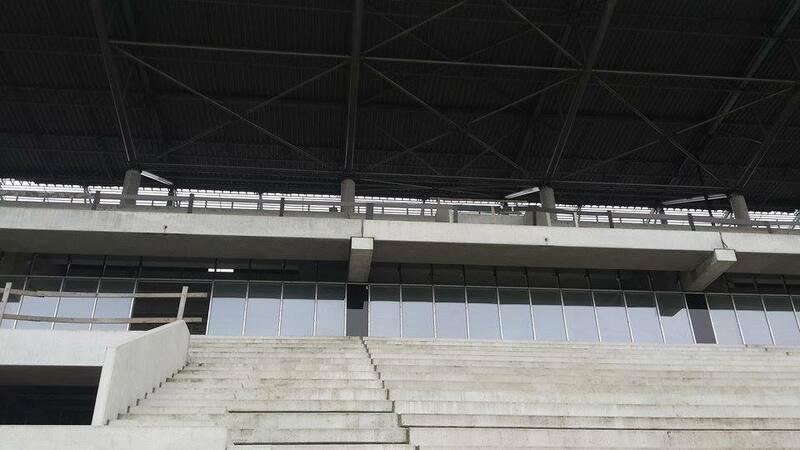 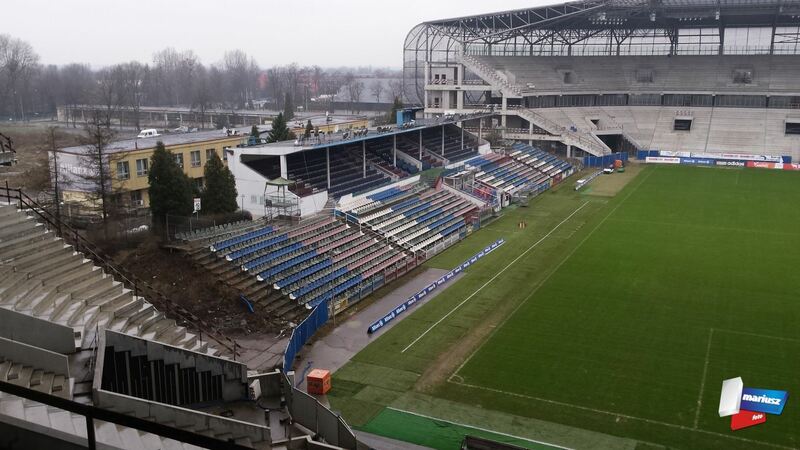 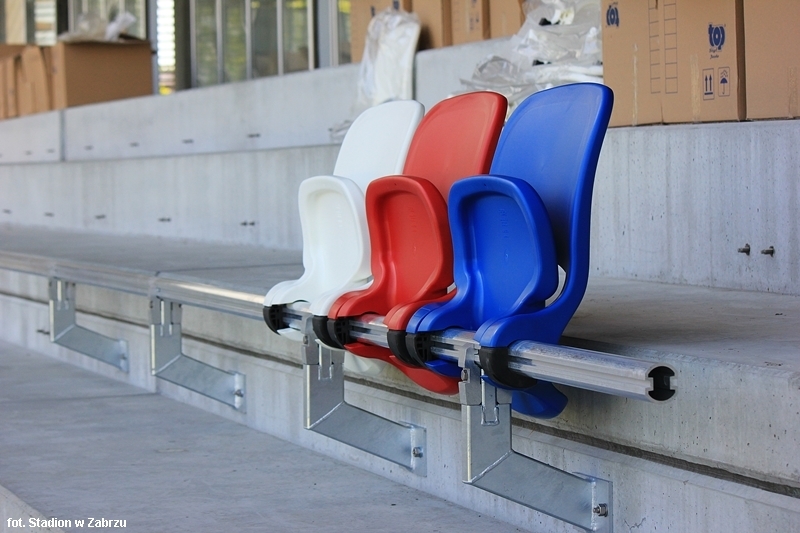 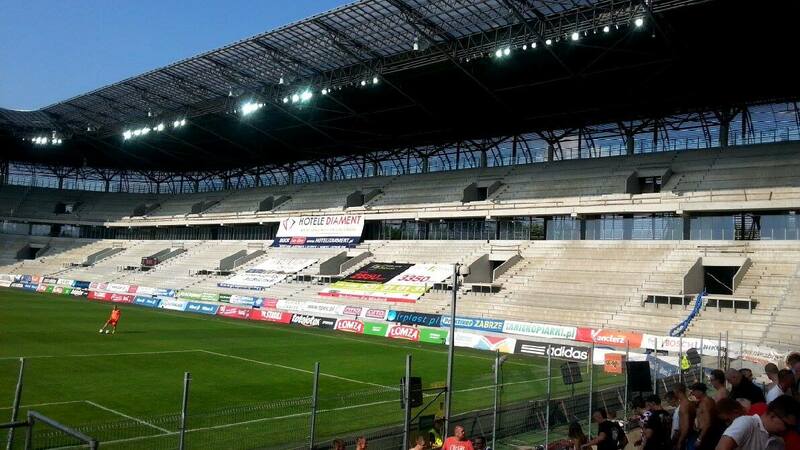 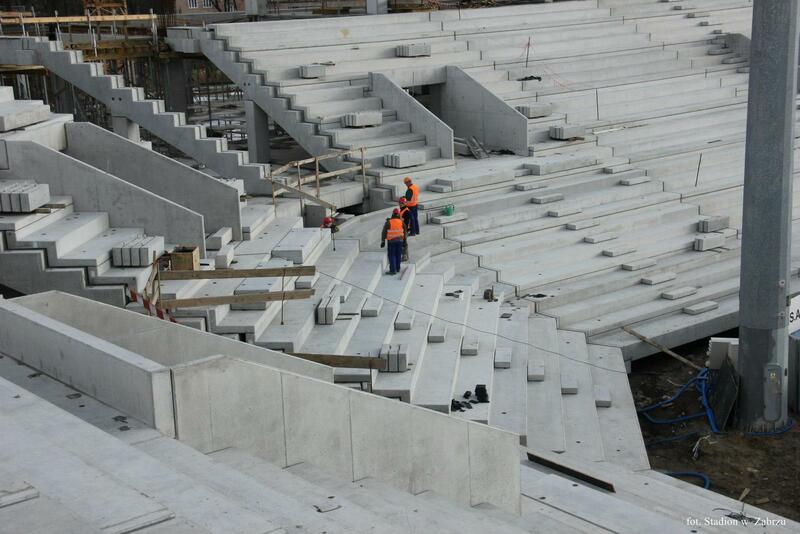 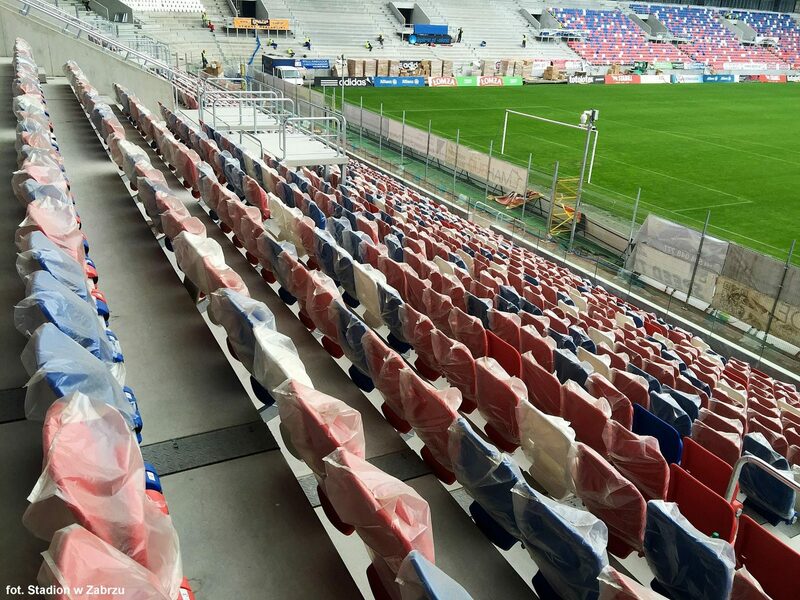 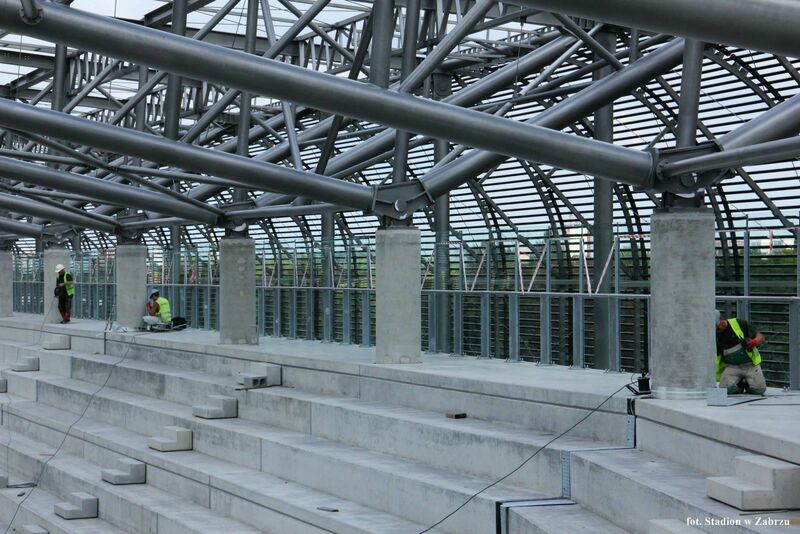 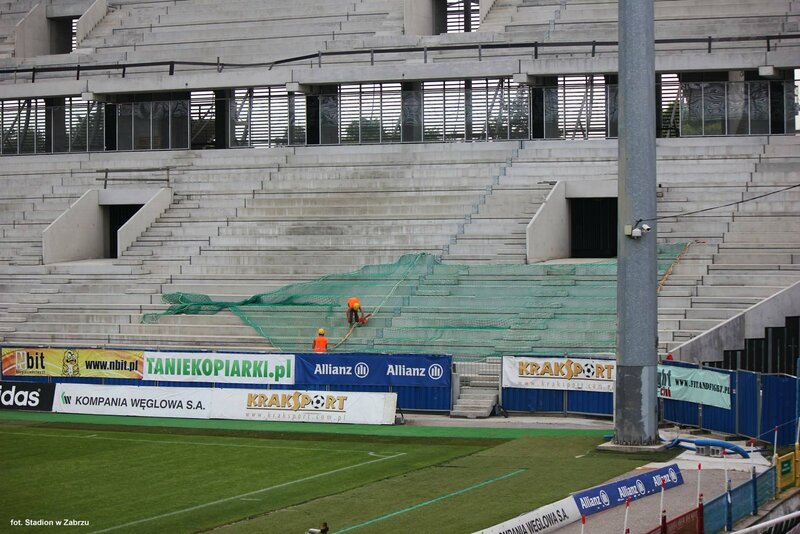 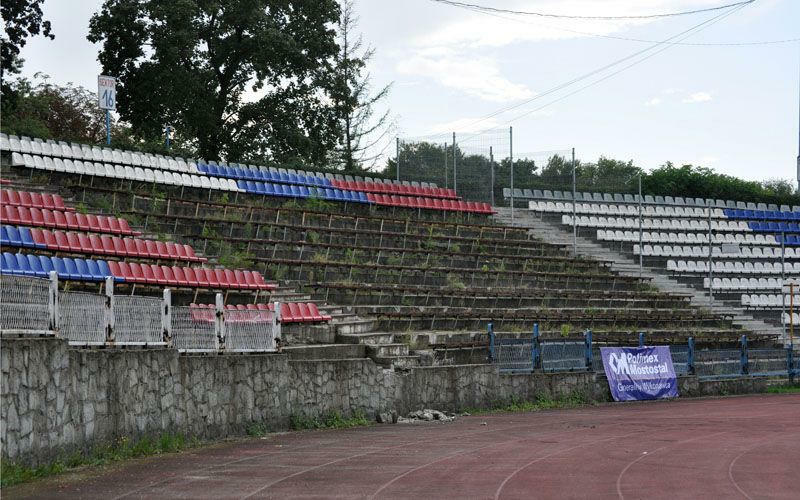 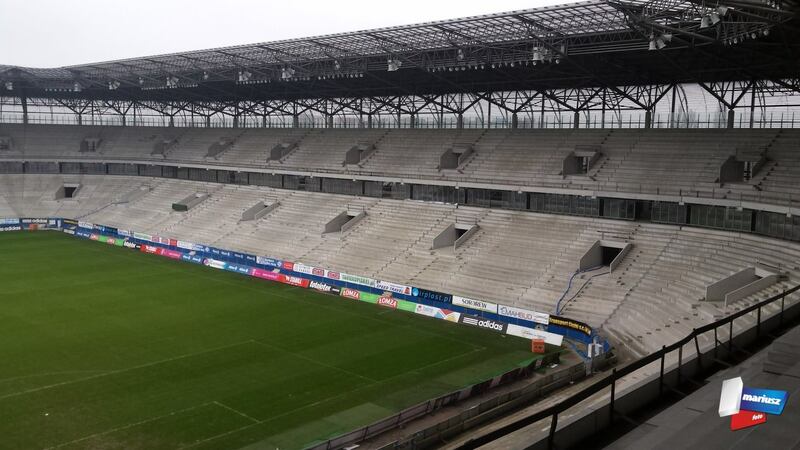 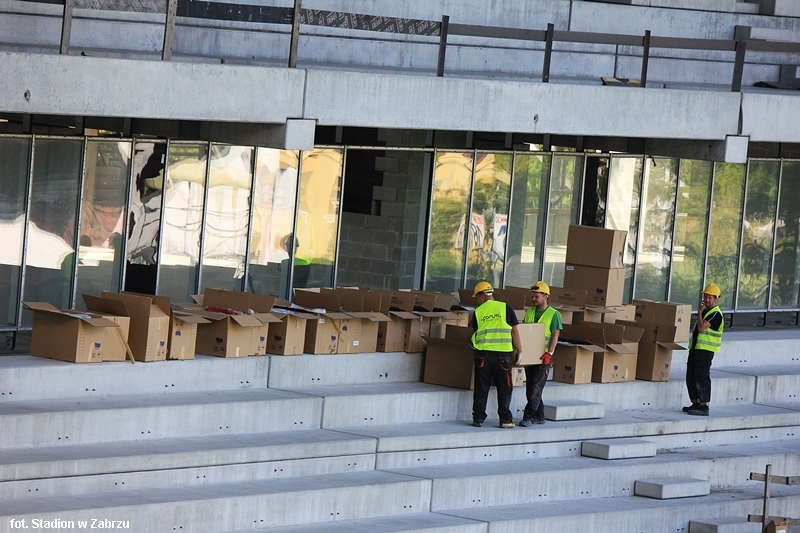 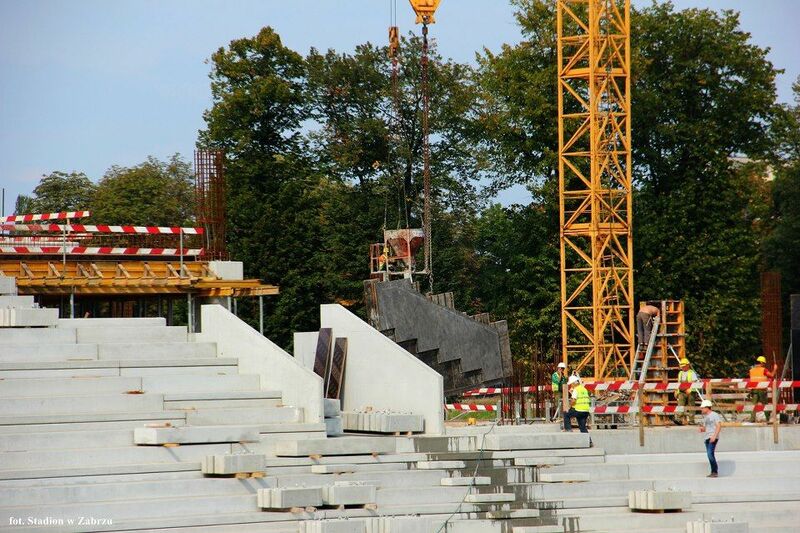 After over two years of waiting fanatic supporters of Górnik Zabrze can now see their stadium flourish… with seats. 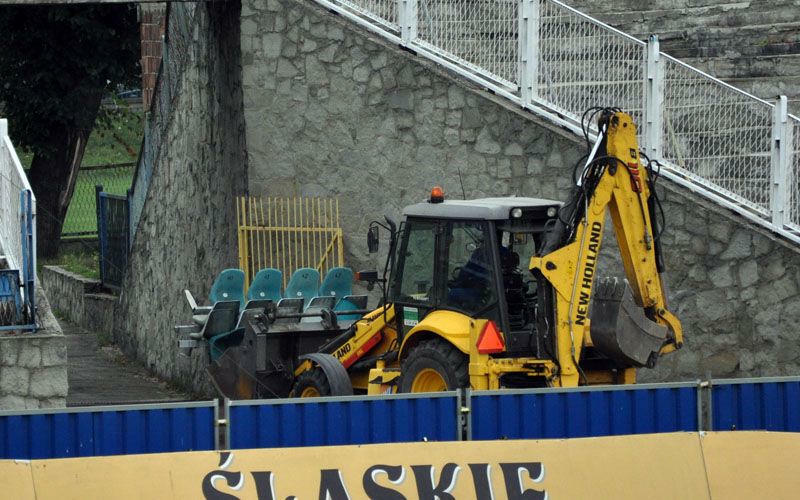 All in the hope of saving Górnik’s license for upcoming season. 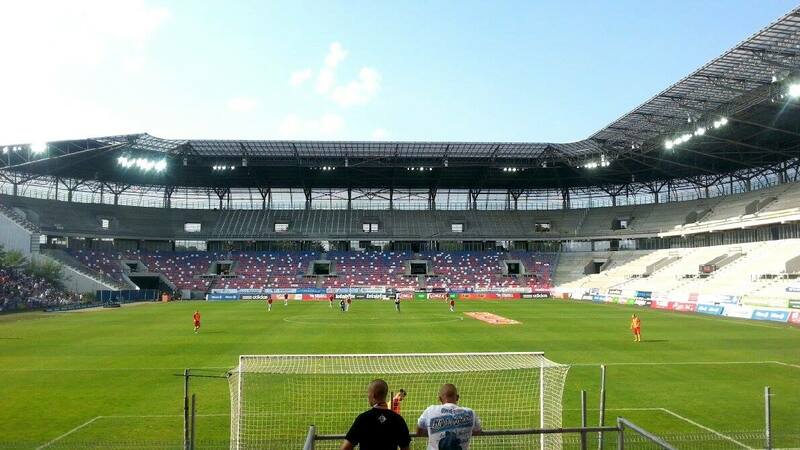 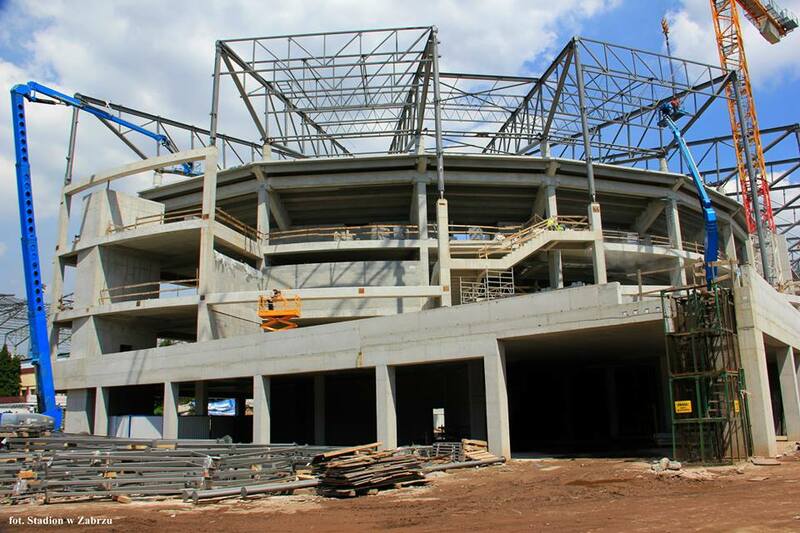 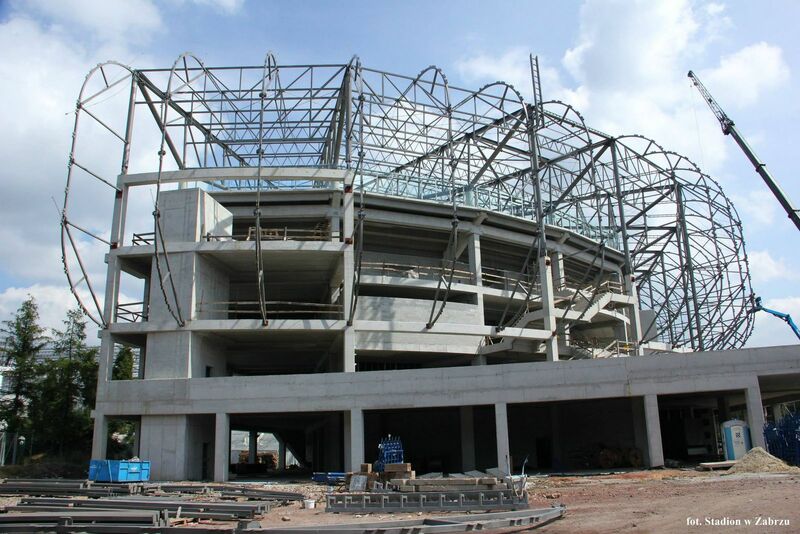 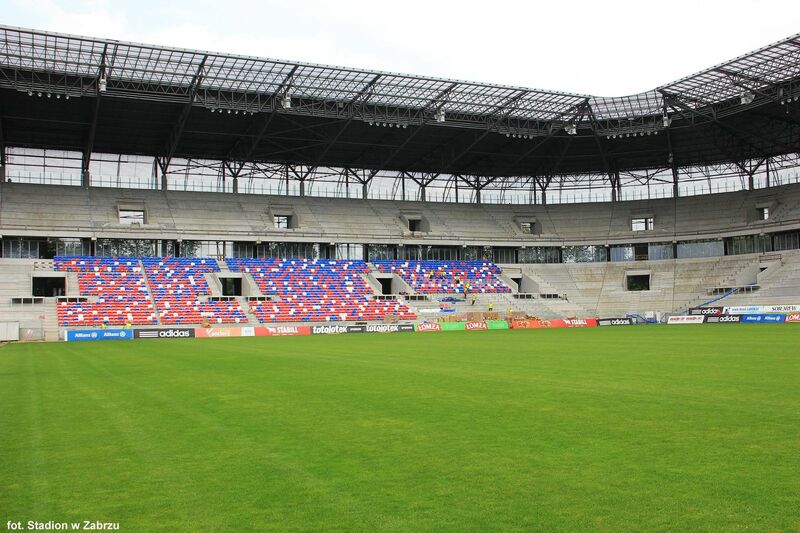 Last spring it was hoped the new stadium of 14-time champions Górnik Zabrze will be opened by early 2015. 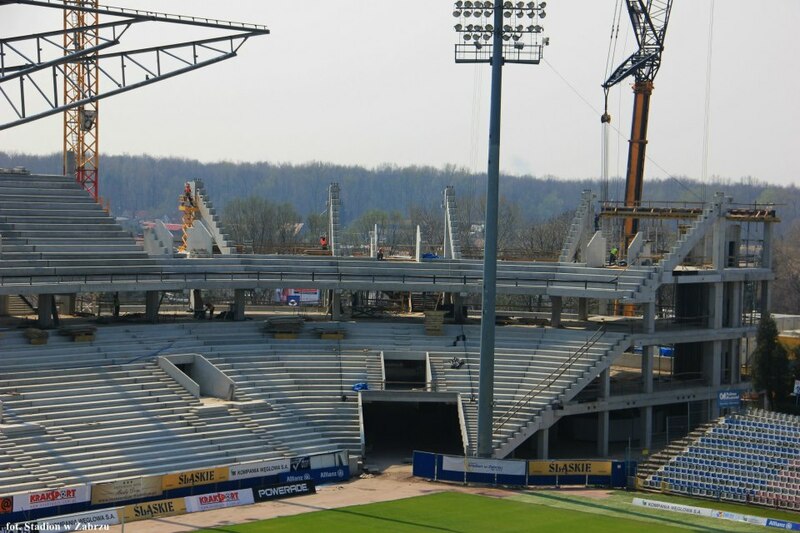 Now in 2015, it will be good if one stand gets opened before year ends…. 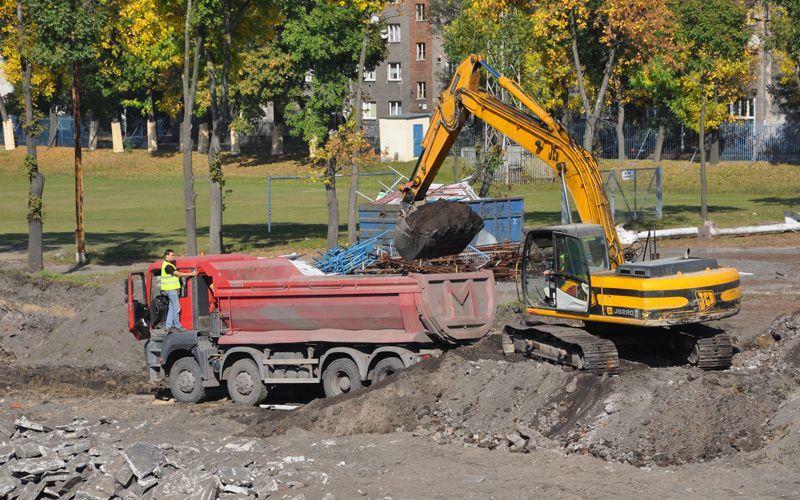 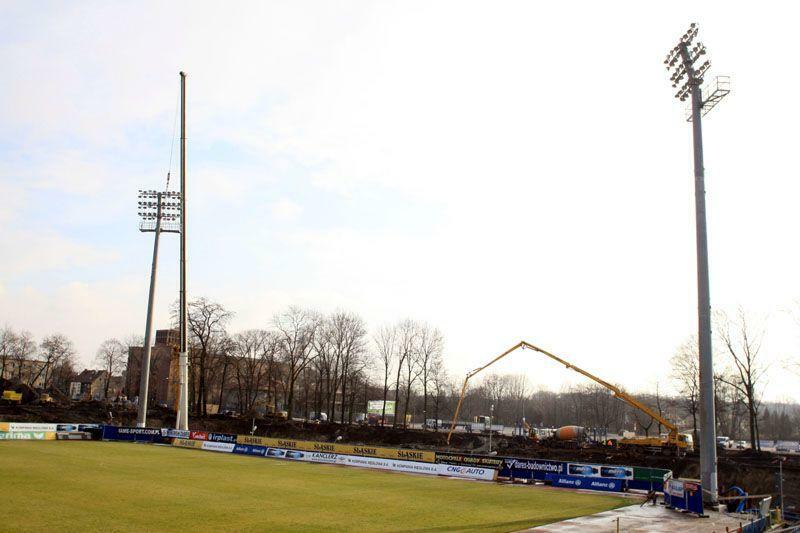 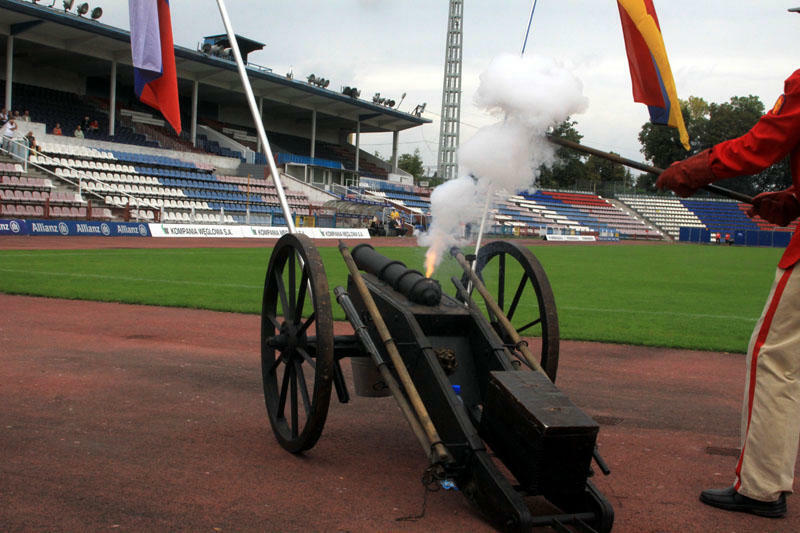 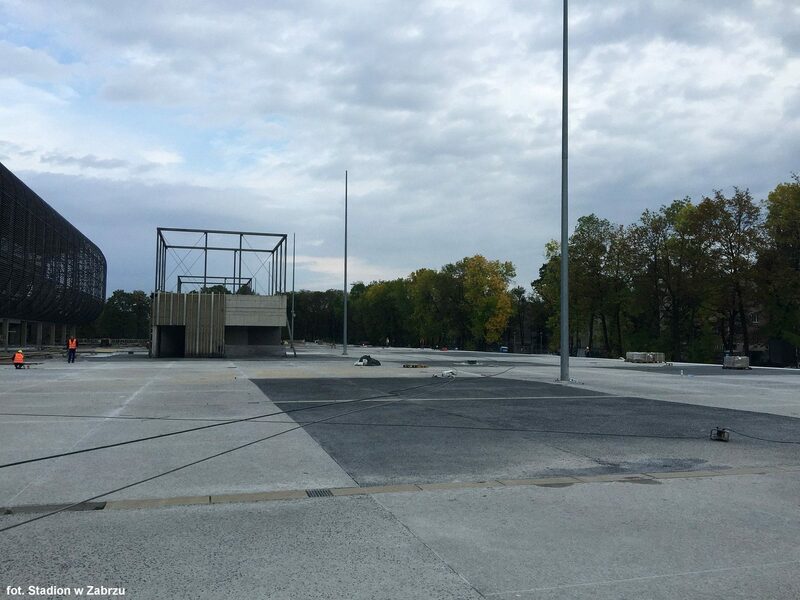 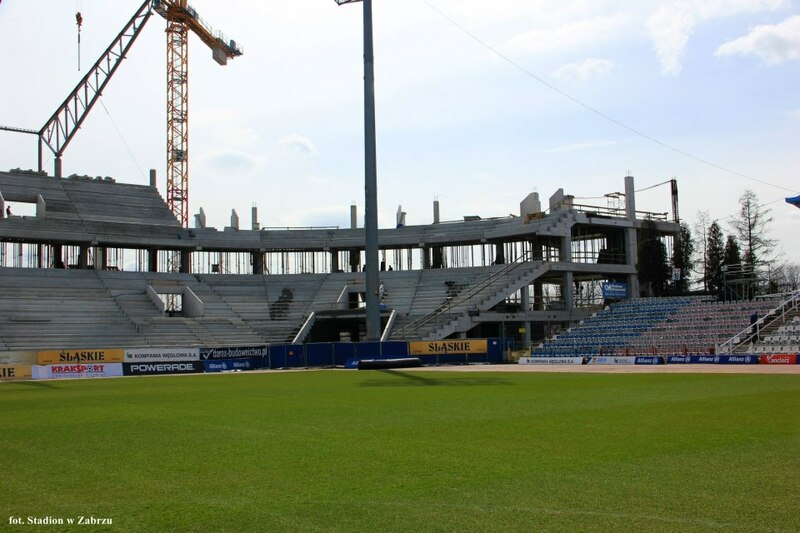 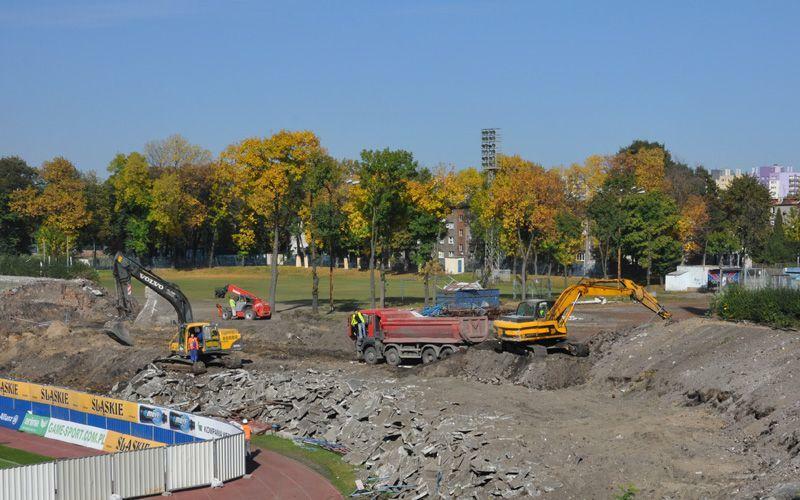 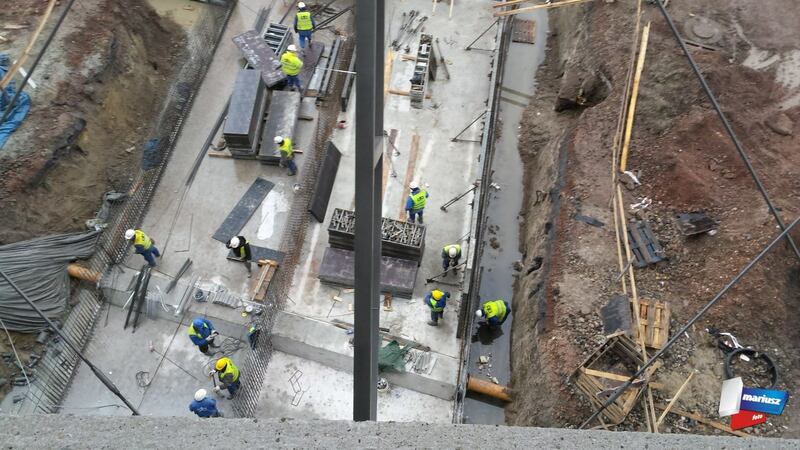 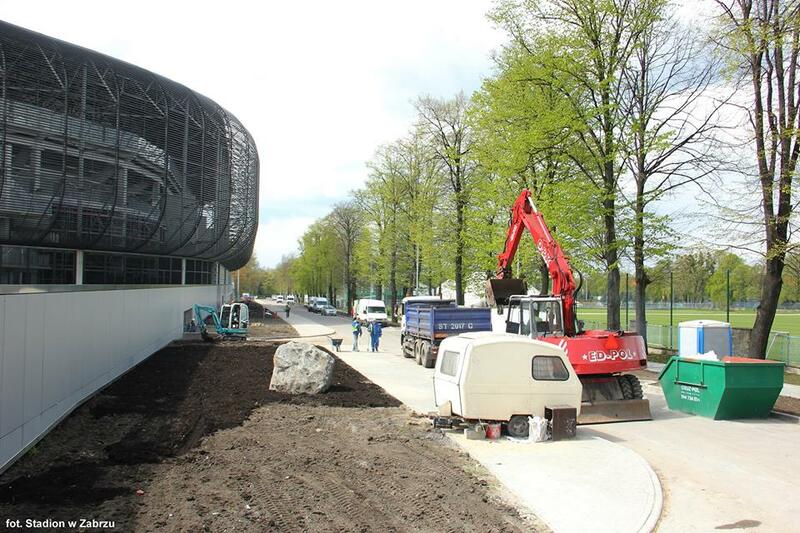 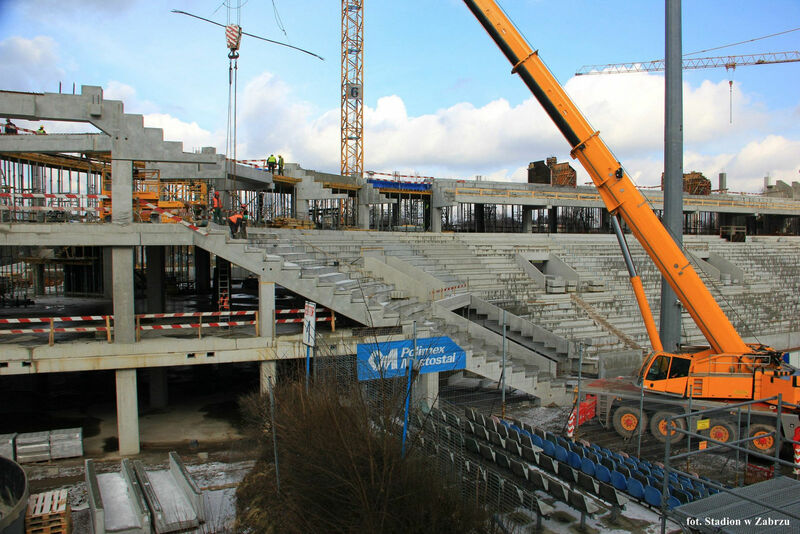 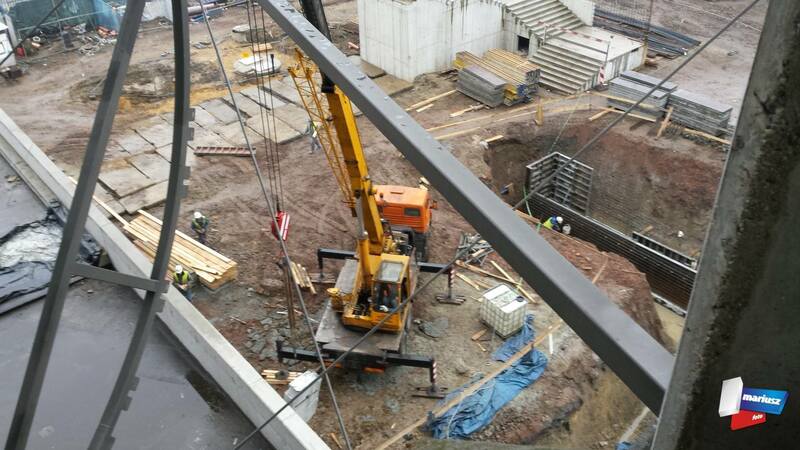 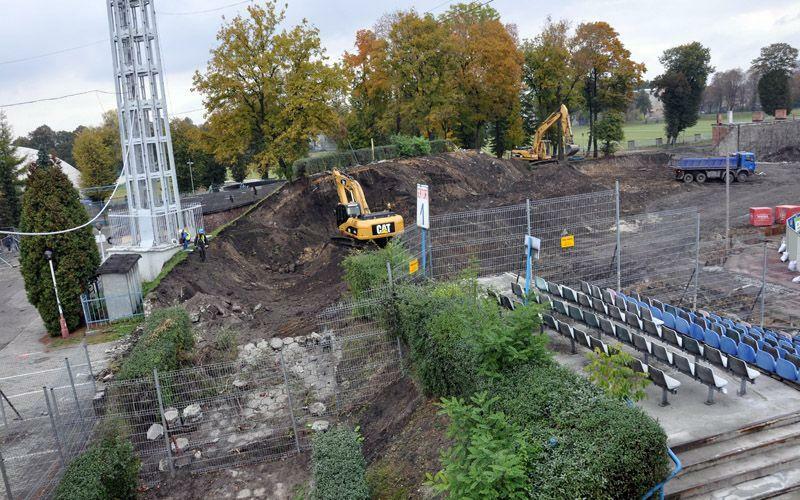 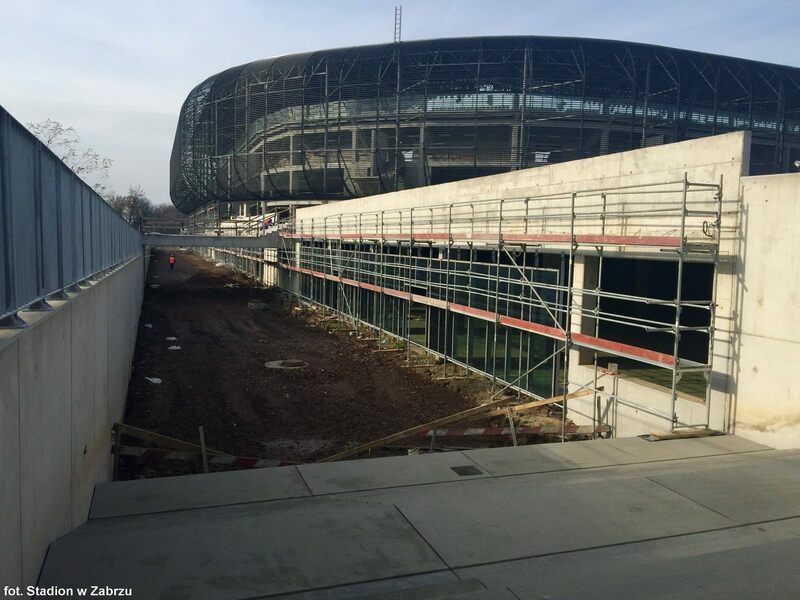 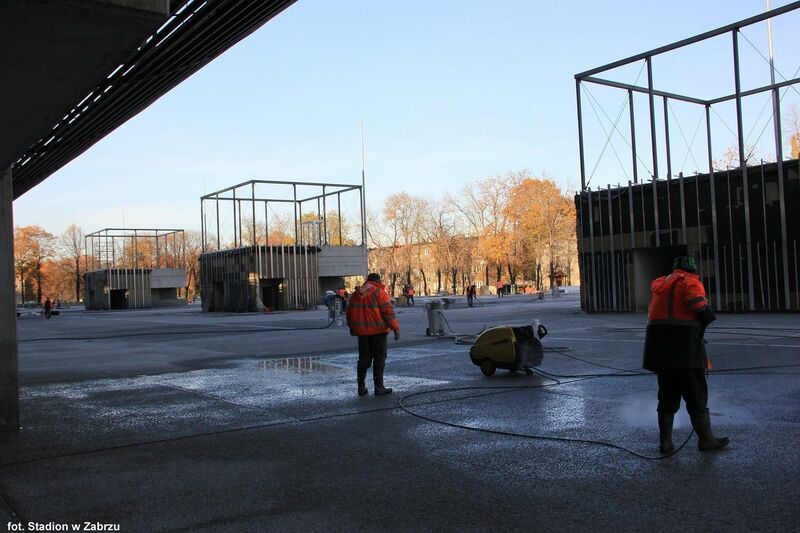 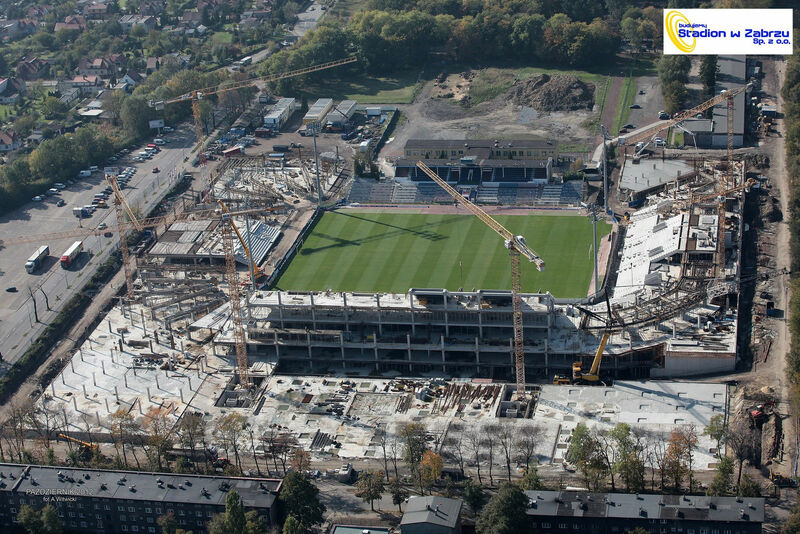 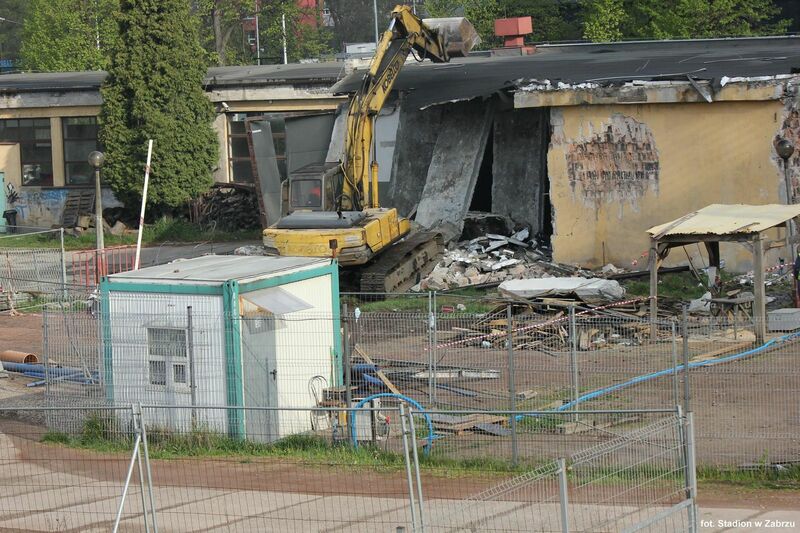 The city today handed over Stadion Ernesta Pohla’s construction site to new contractors. 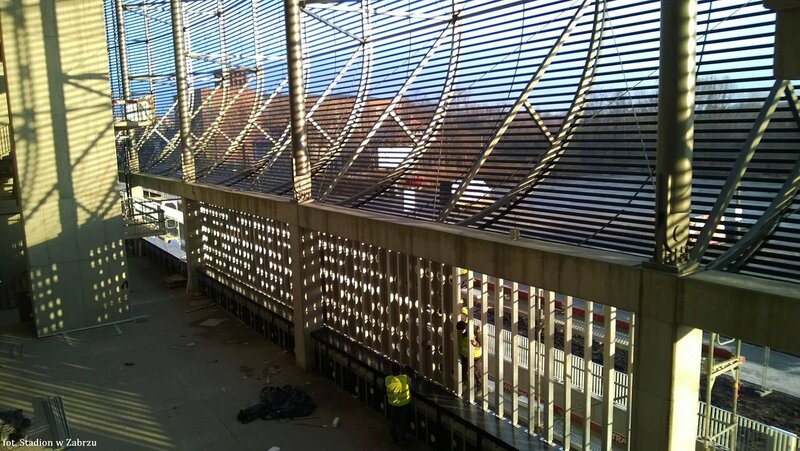 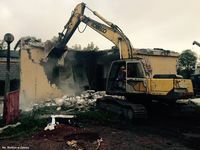 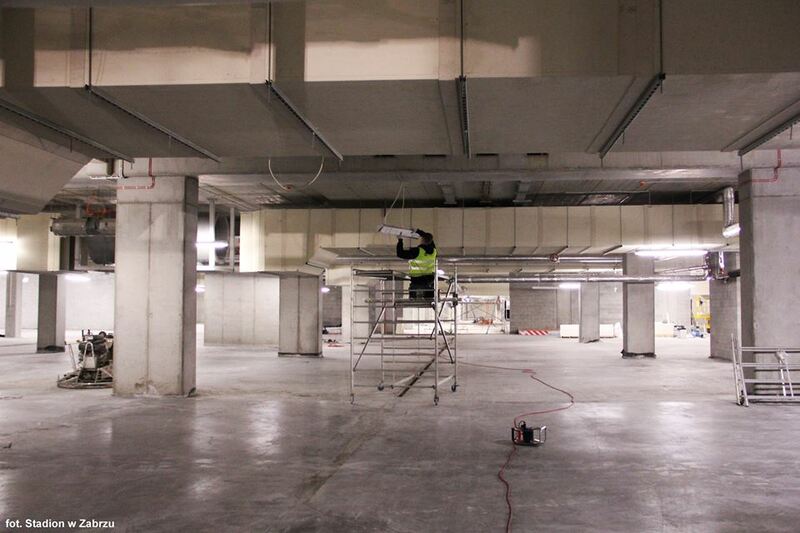 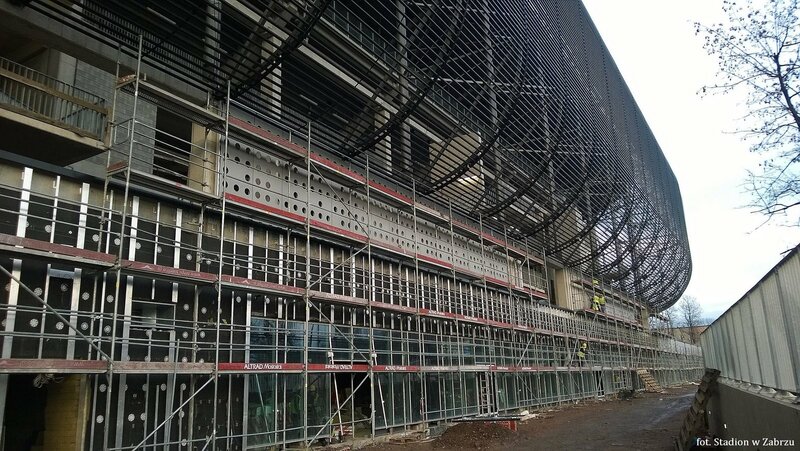 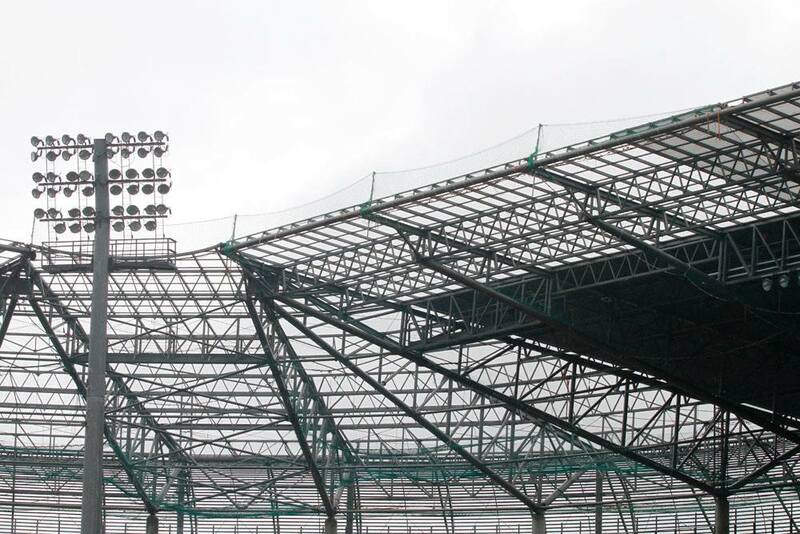 Work already got under way to deliver the roof within 3 months. 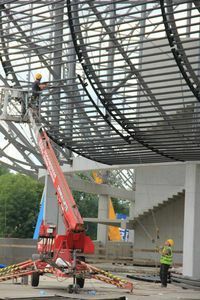 More progress is expected soon. 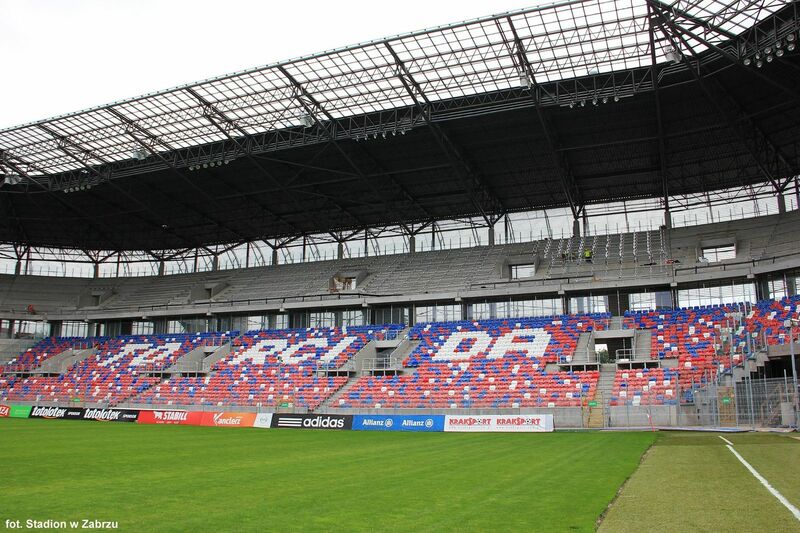 Three stands for over 24,000 people were supposed to open for fans of Poland’s most successful team in April… last year. 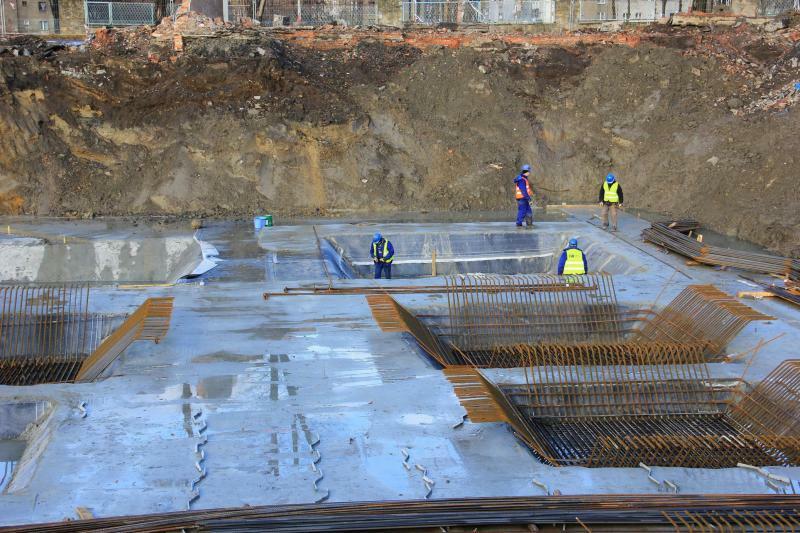 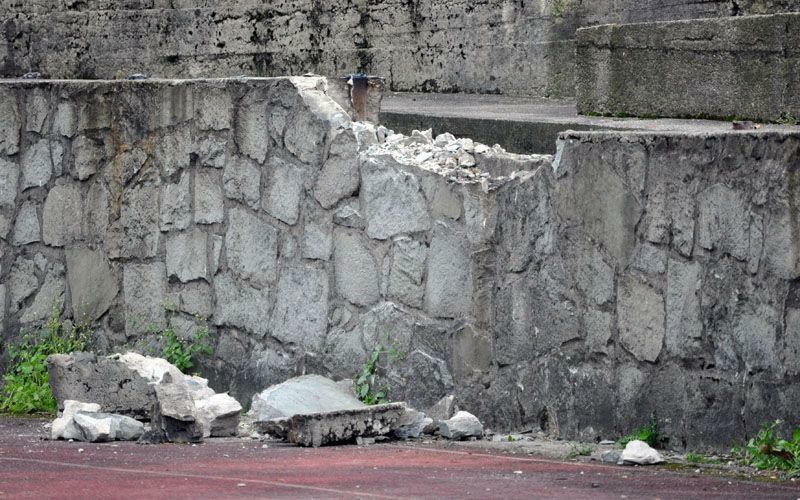 But they’re still not ready and the municipality just admitted they have no money to finish works. 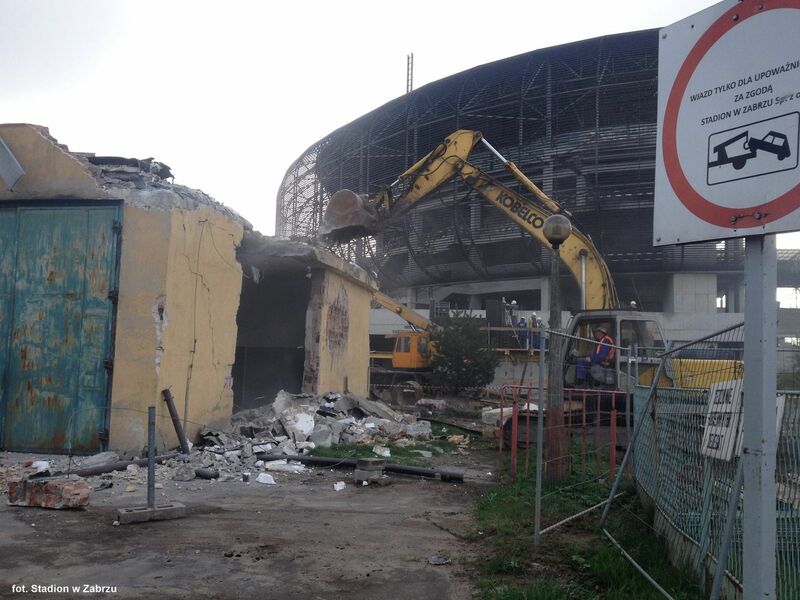 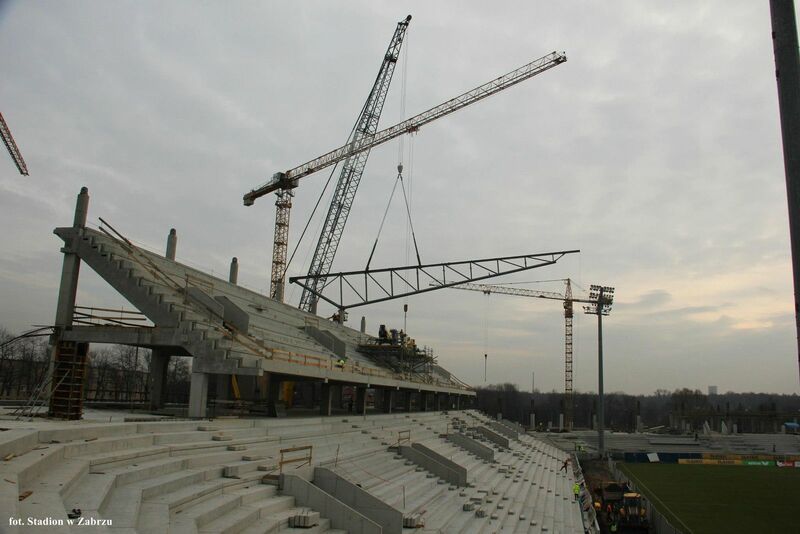 Situation is heating up at the largest ongoing stadium construction in Poland. 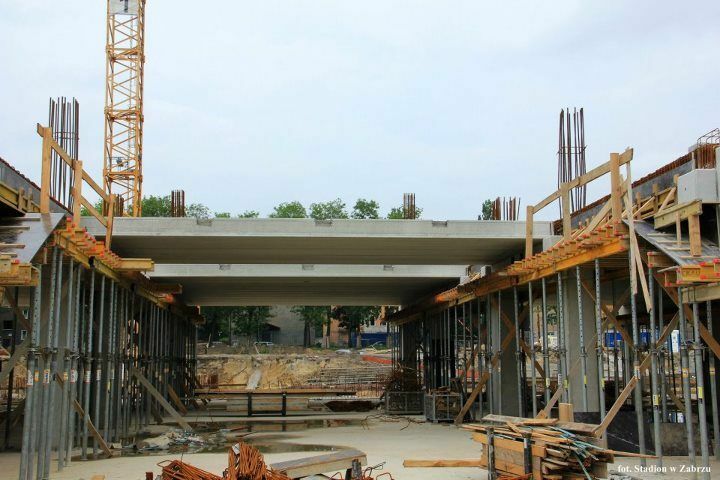 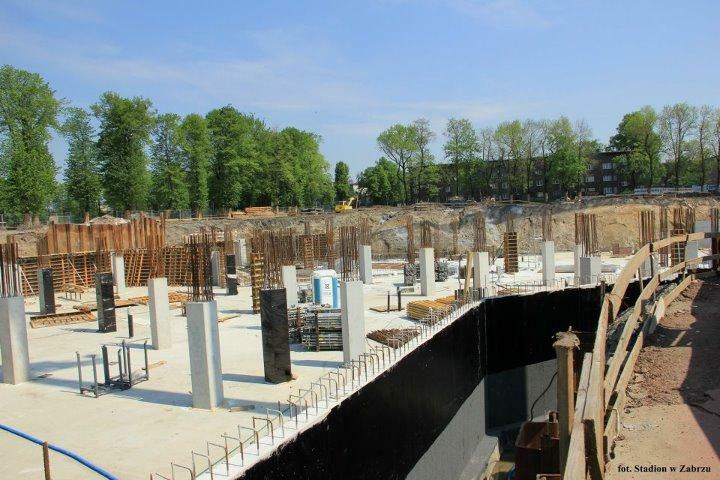 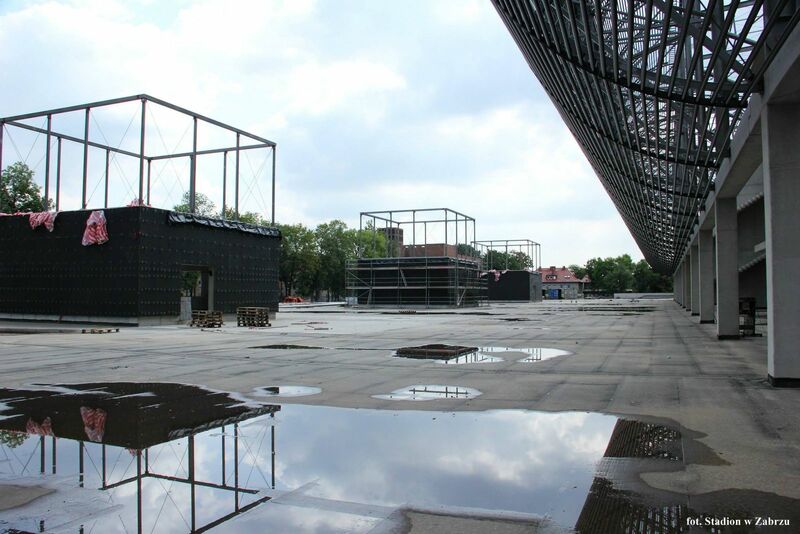 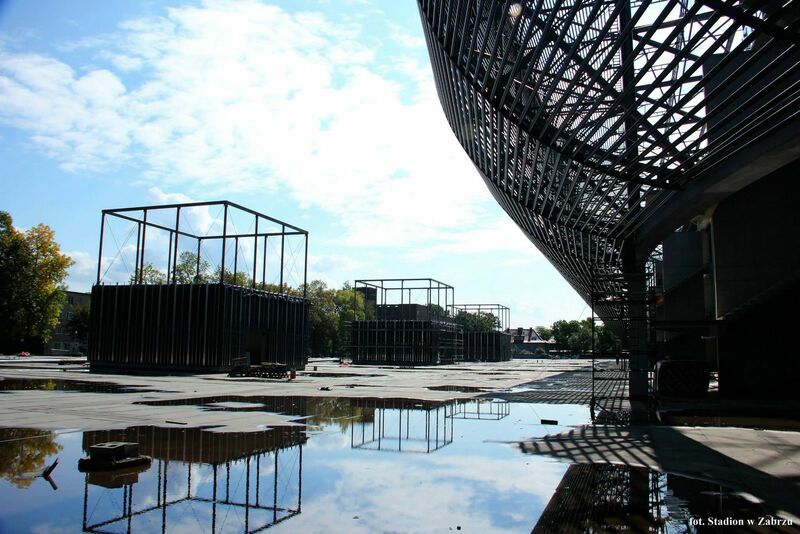 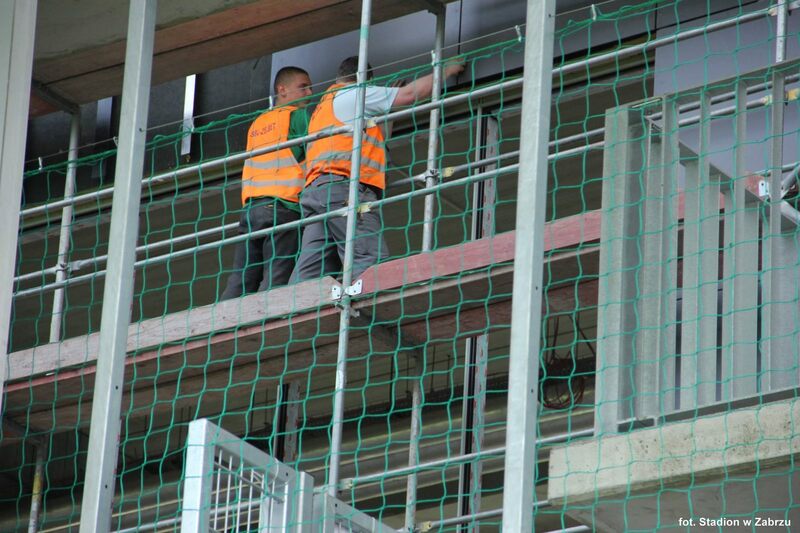 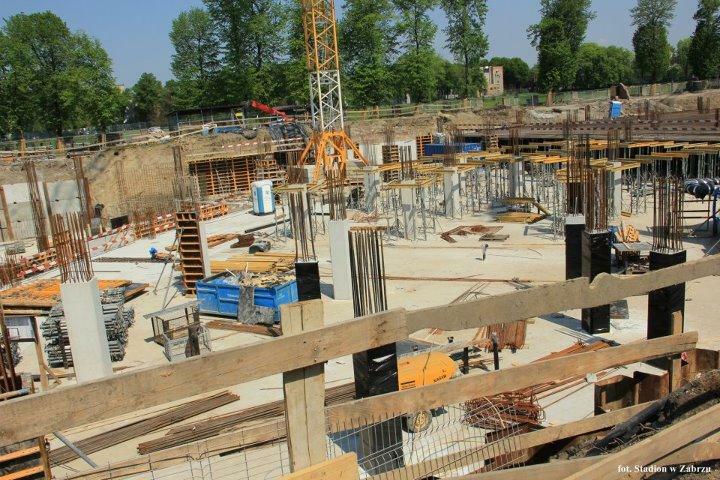 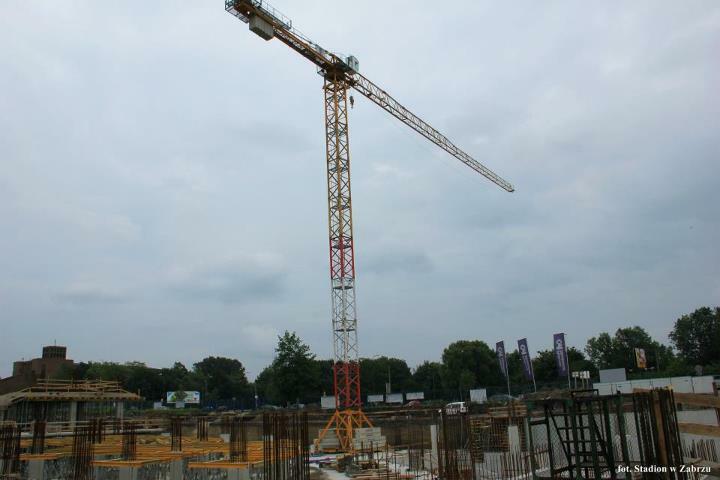 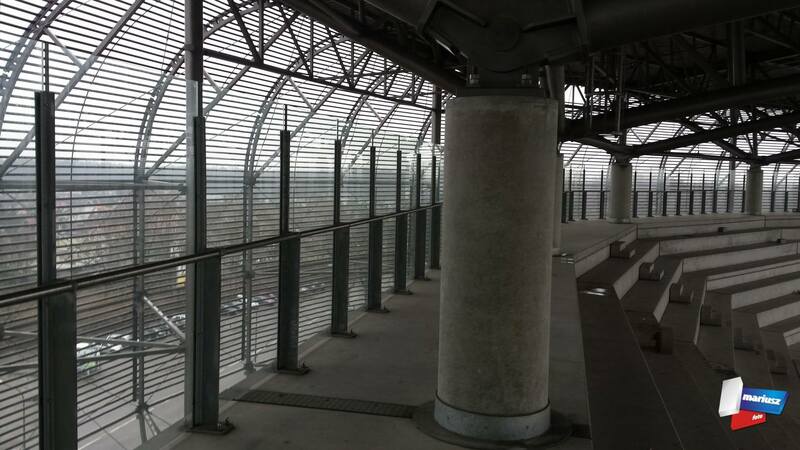 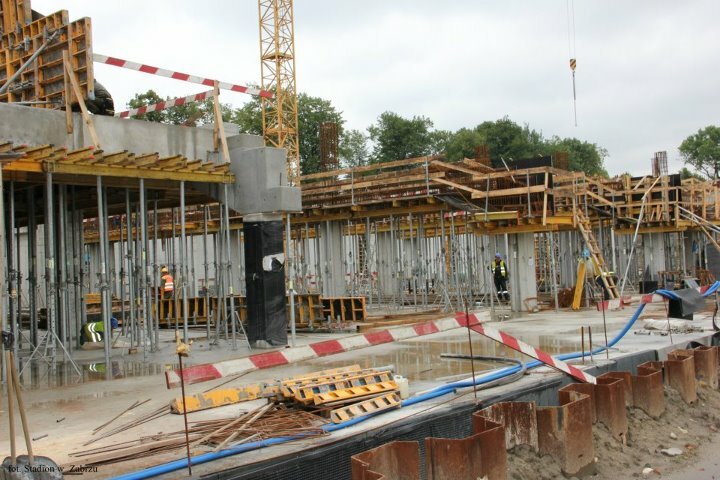 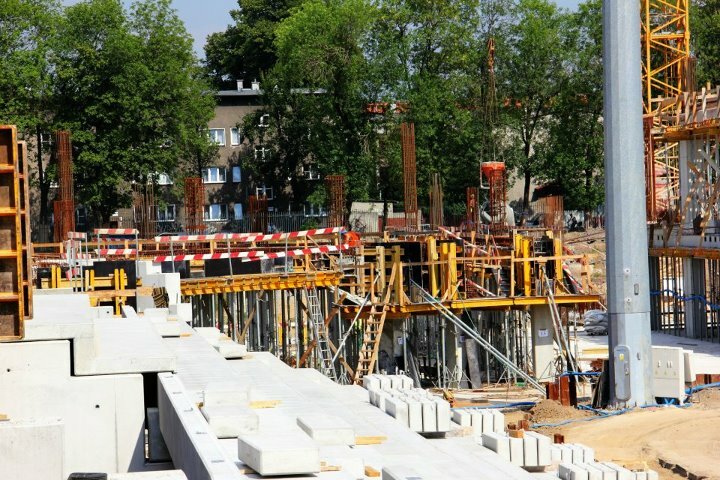 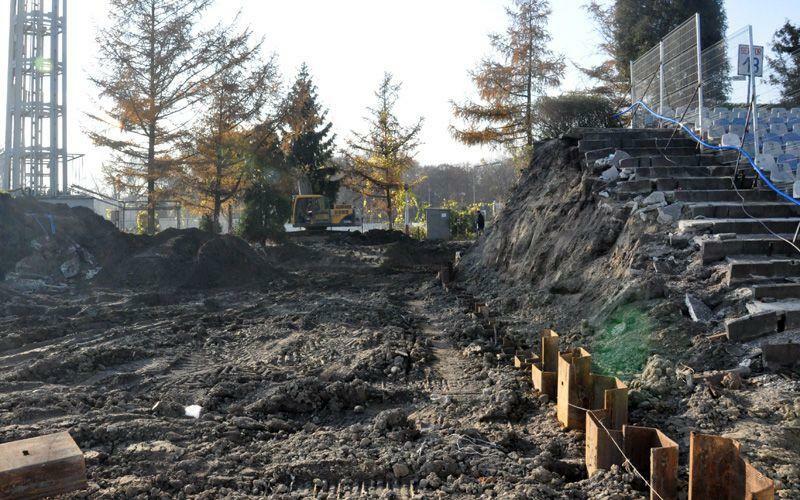 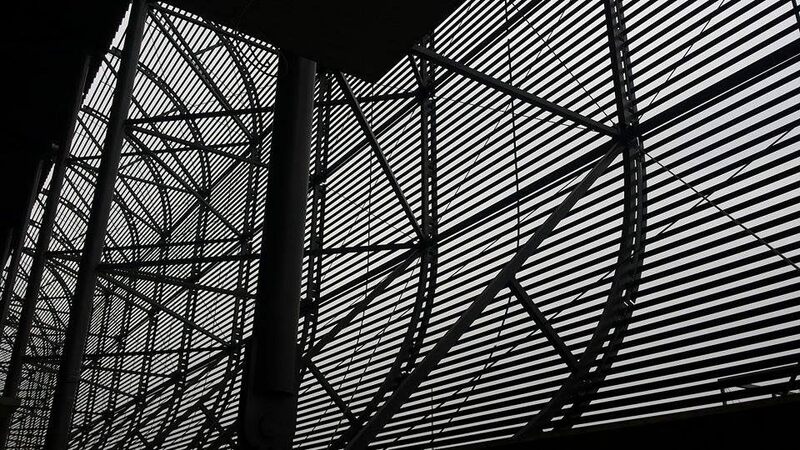 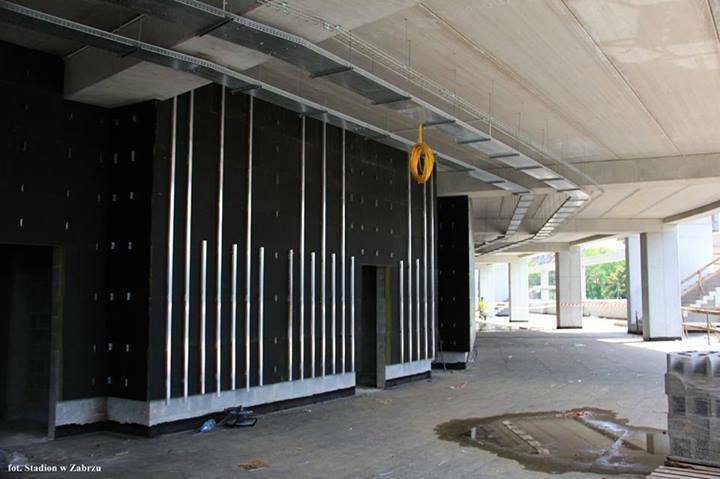 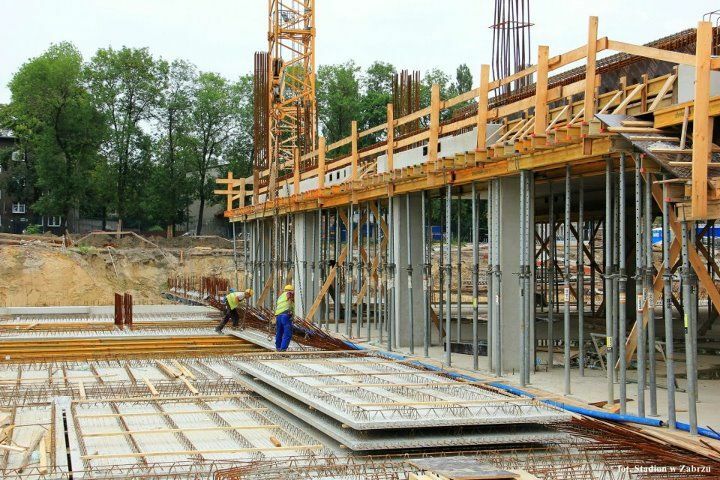 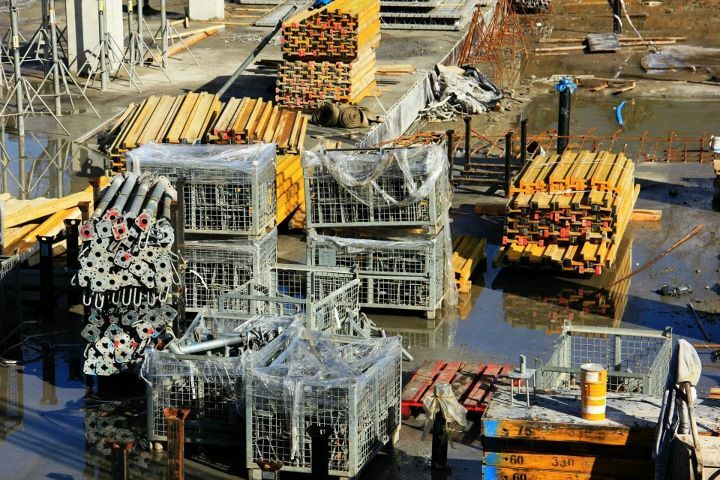 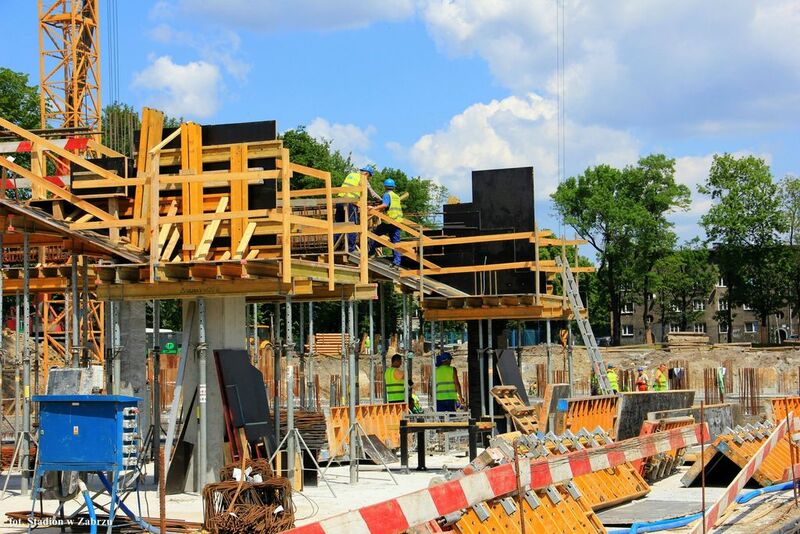 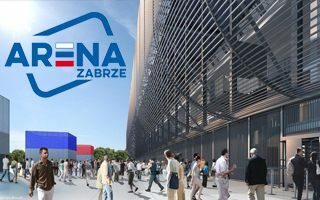 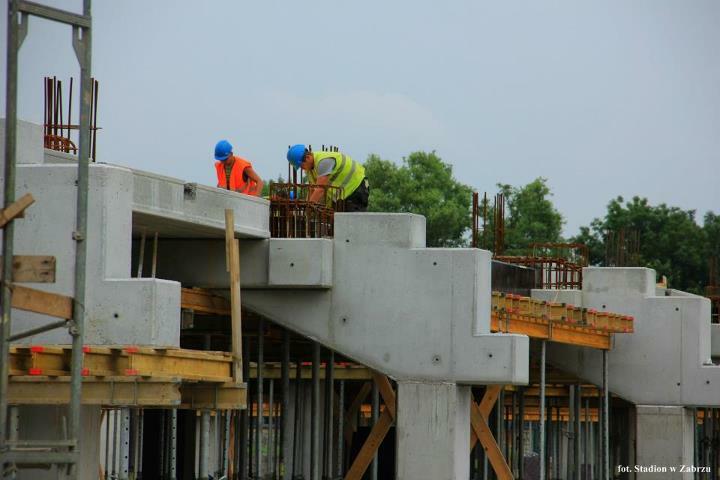 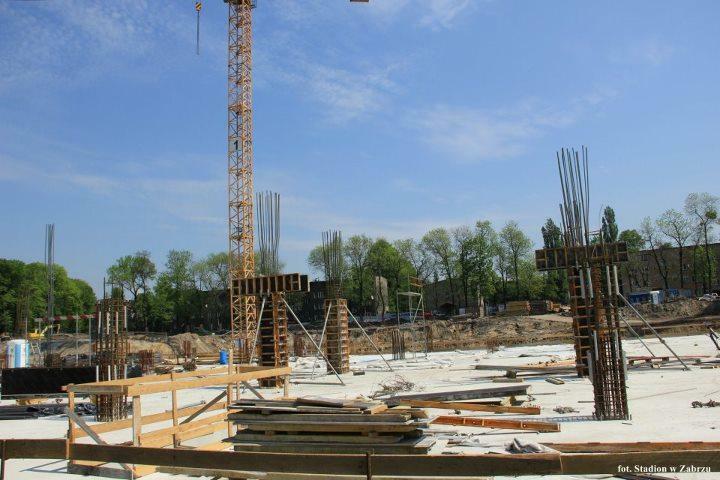 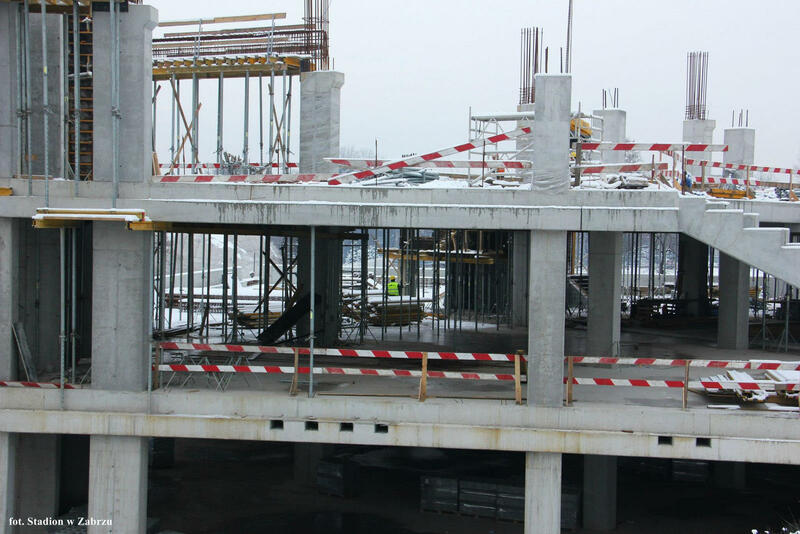 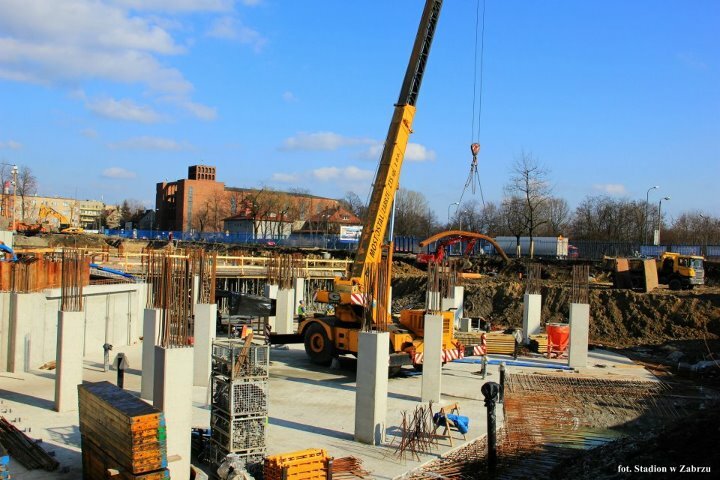 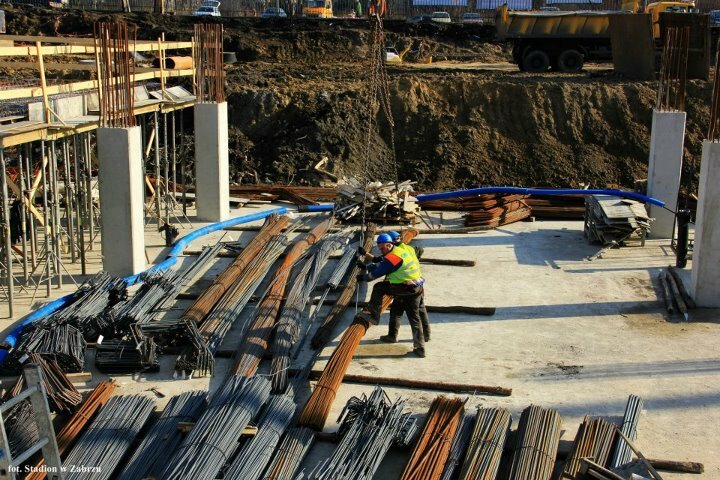 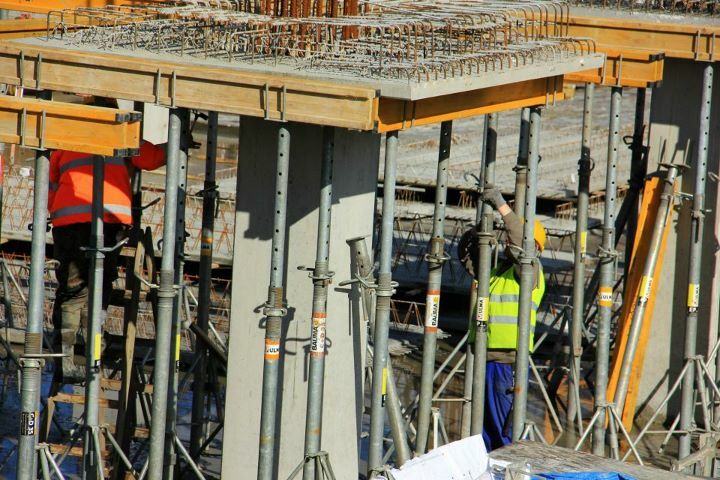 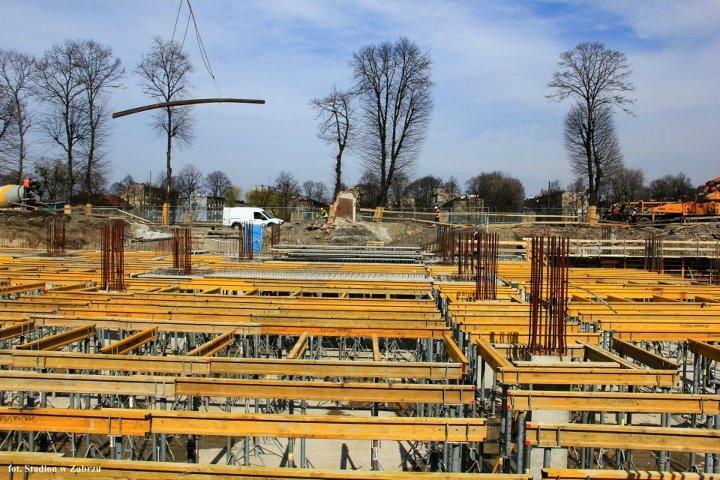 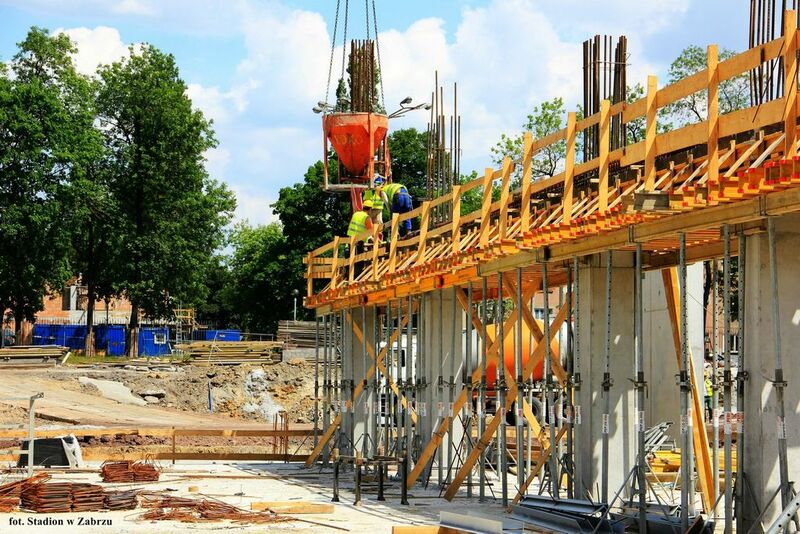 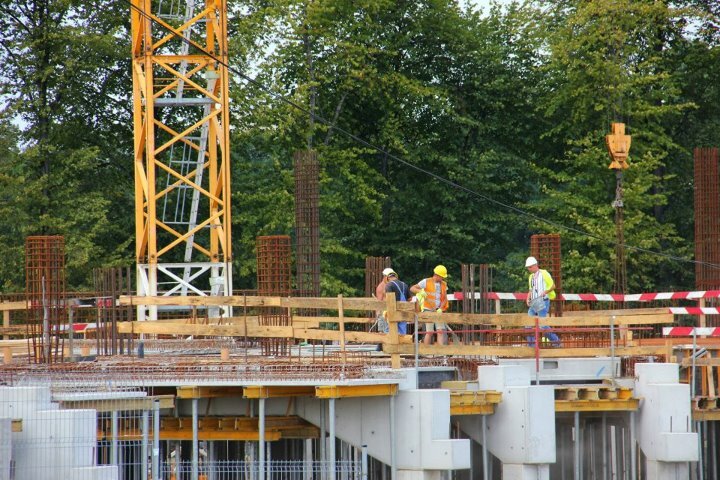 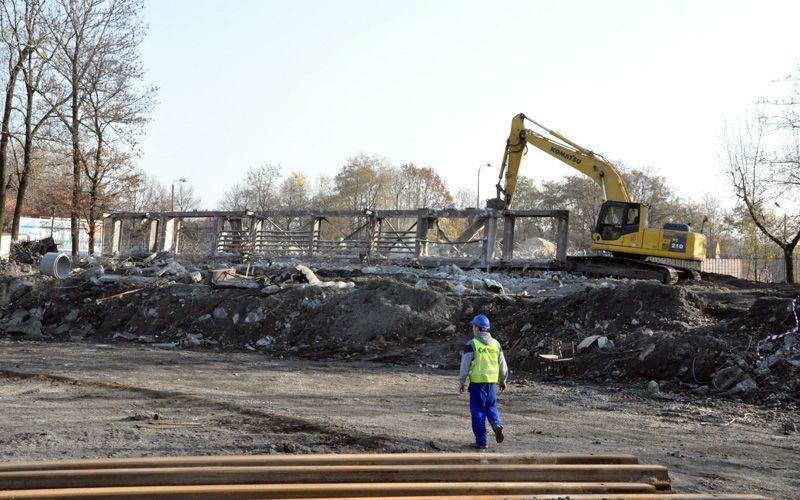 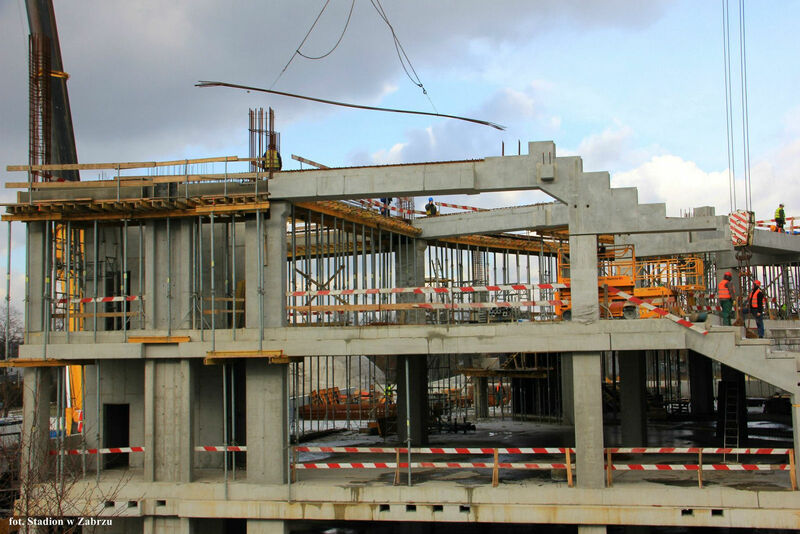 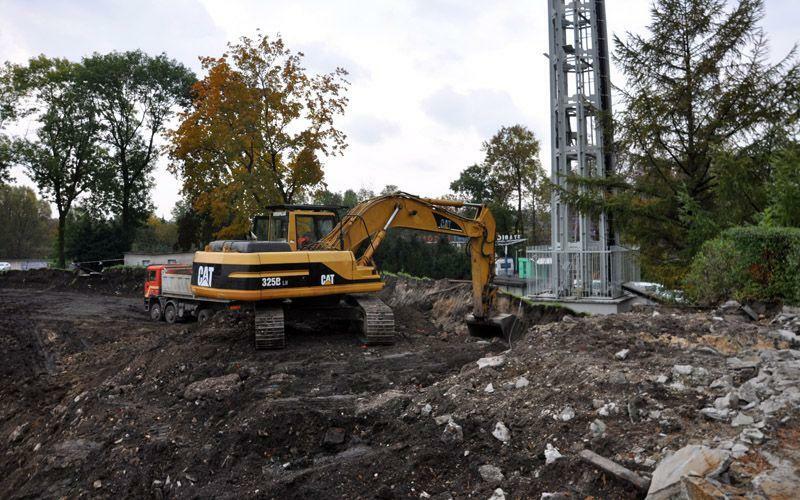 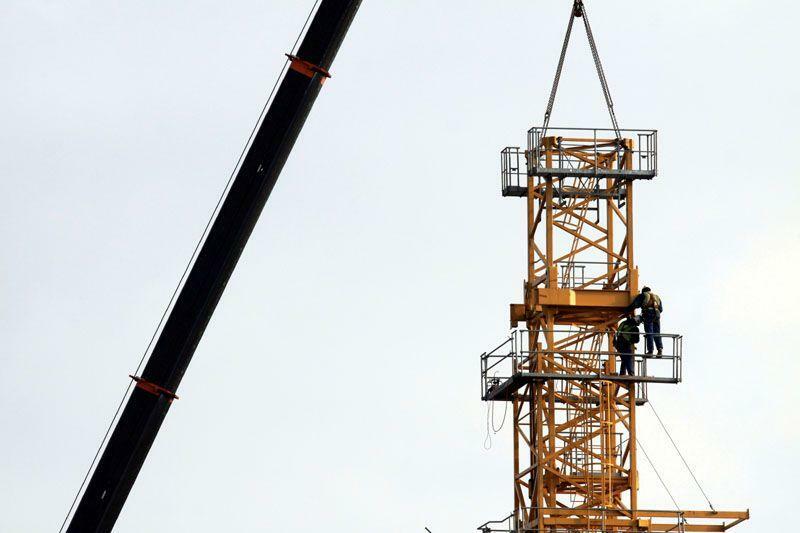 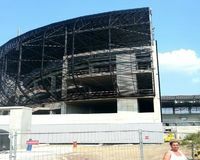 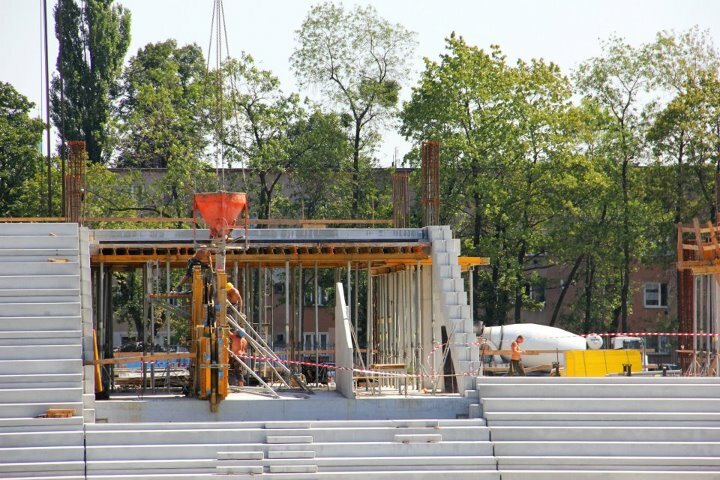 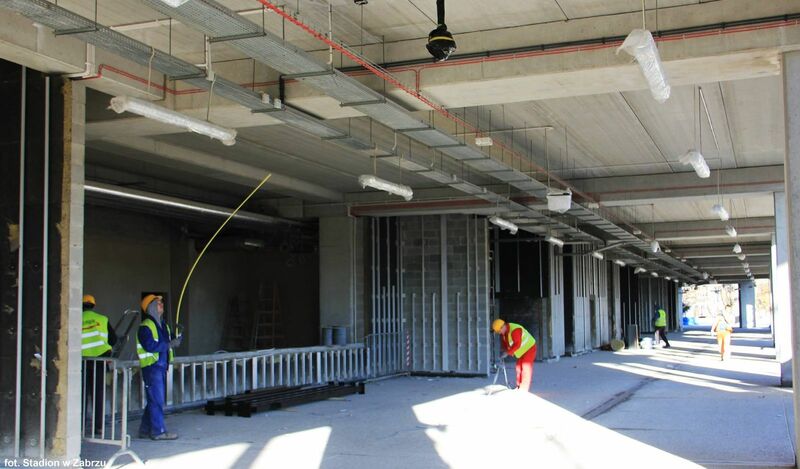 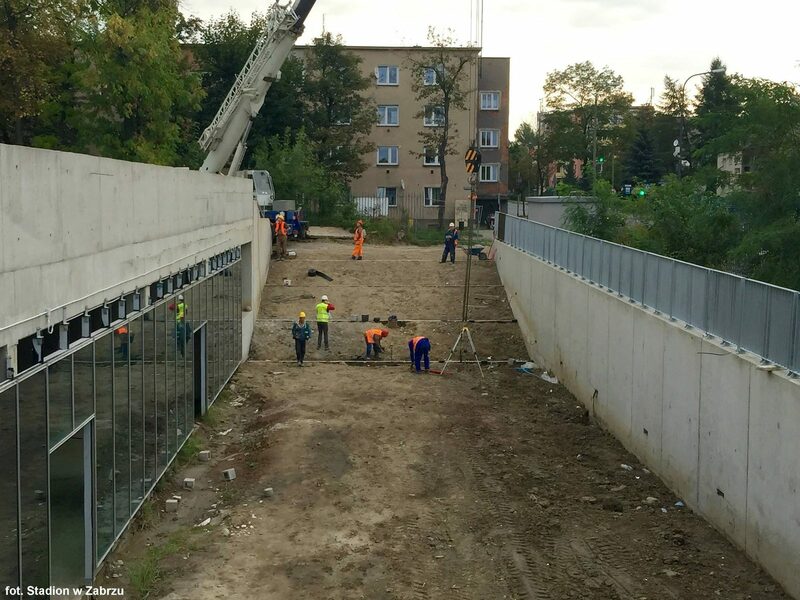 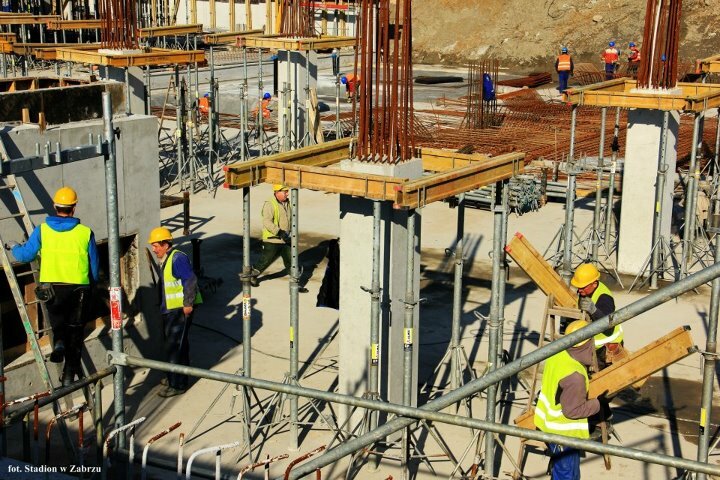 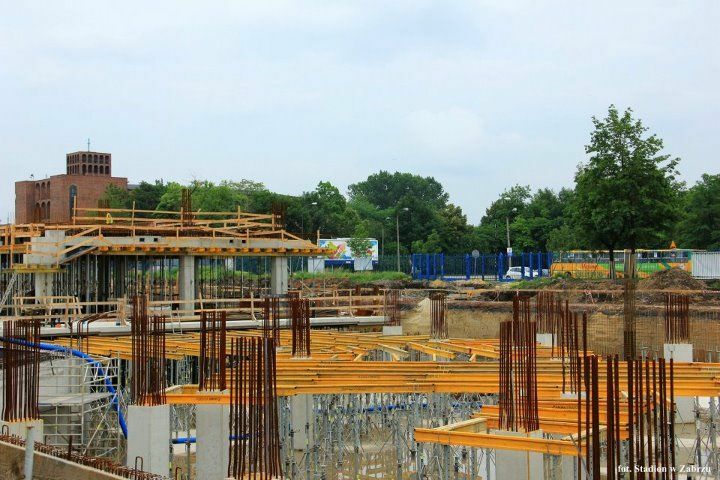 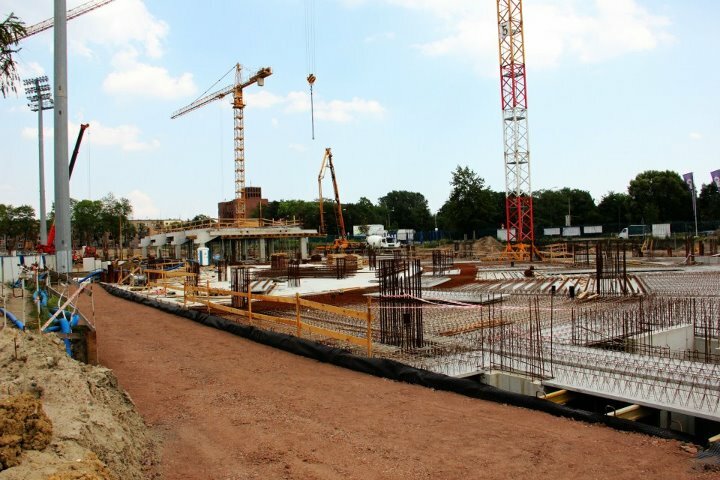 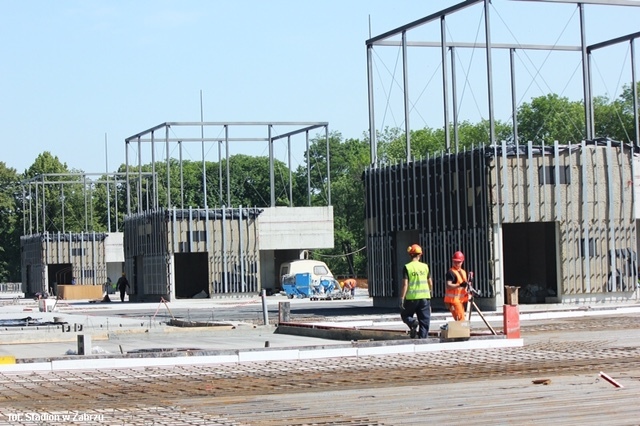 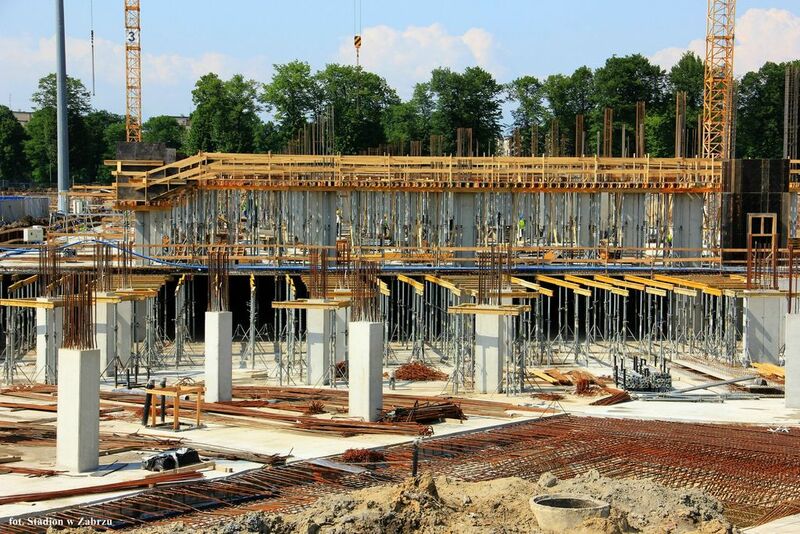 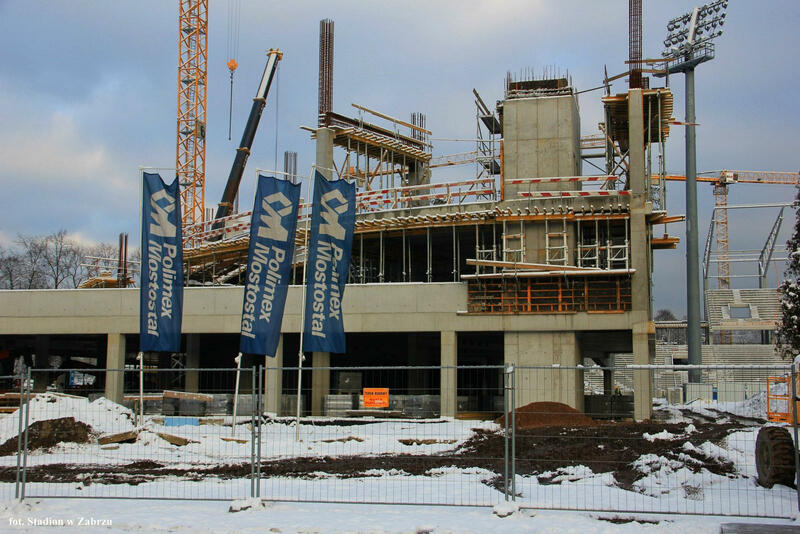 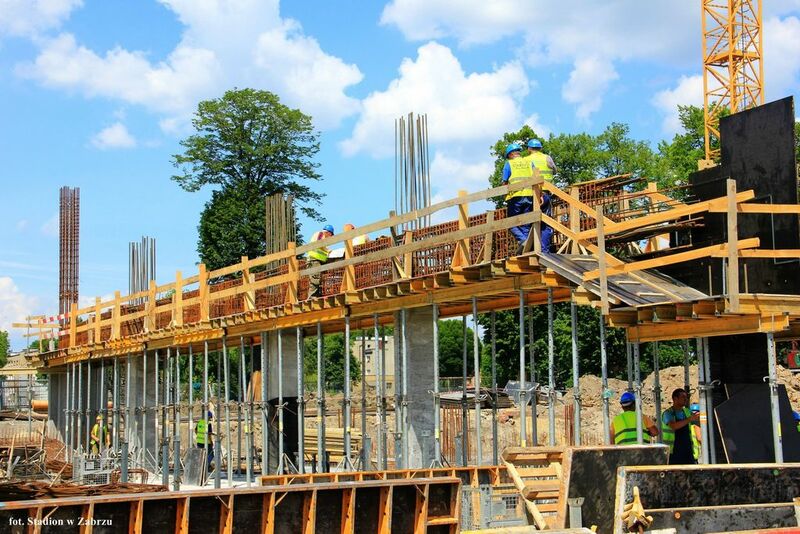 Three stands to hold over 24,000 people in Zabrze may have even one year more to open as the municipality sacked general contractor over insufficient pace. 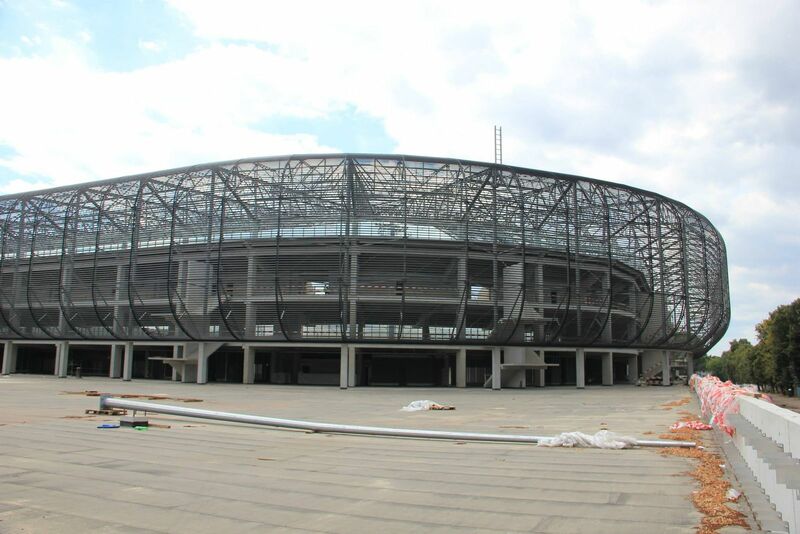 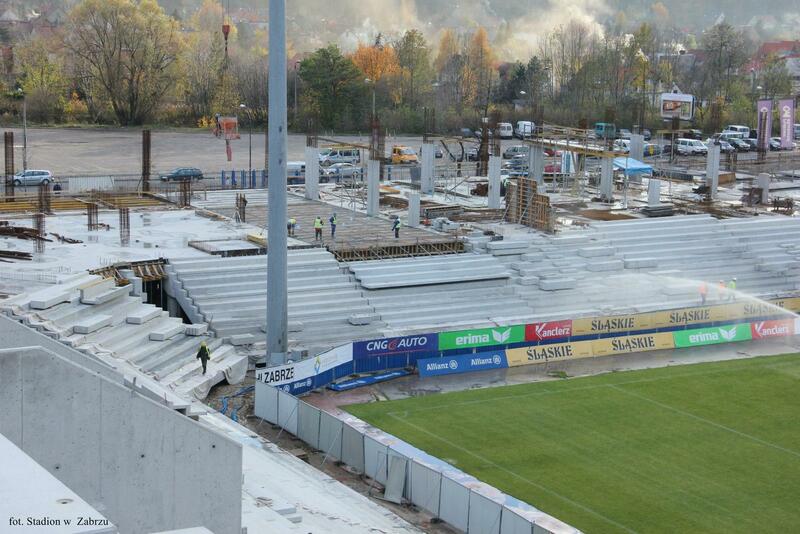 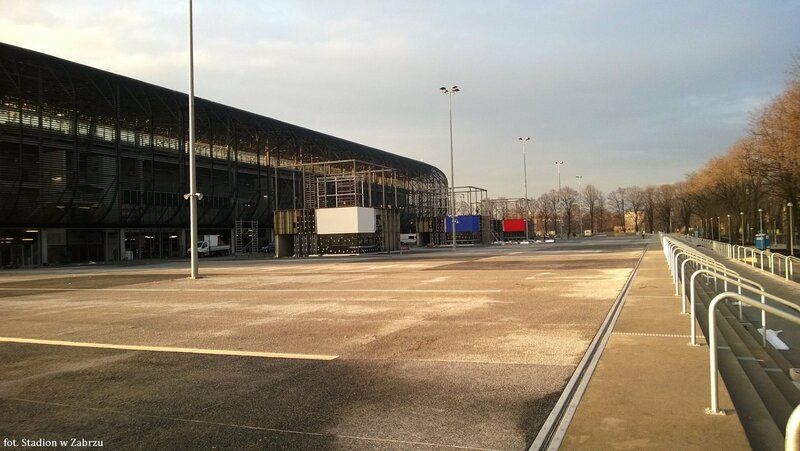 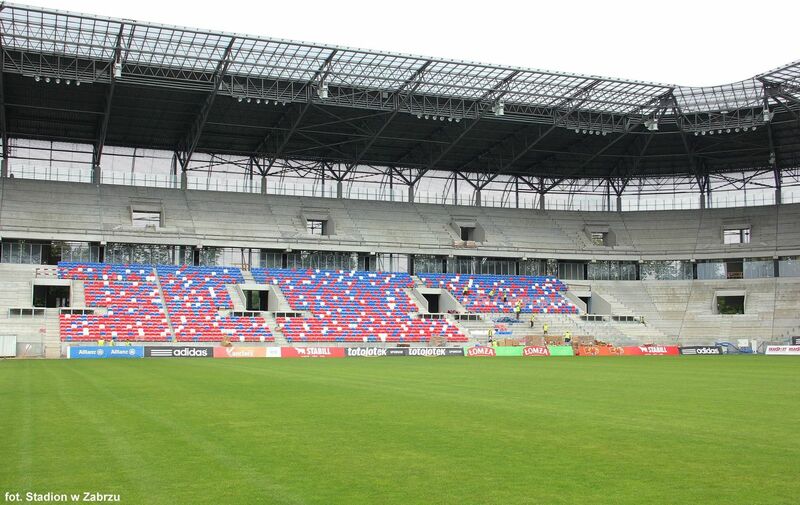 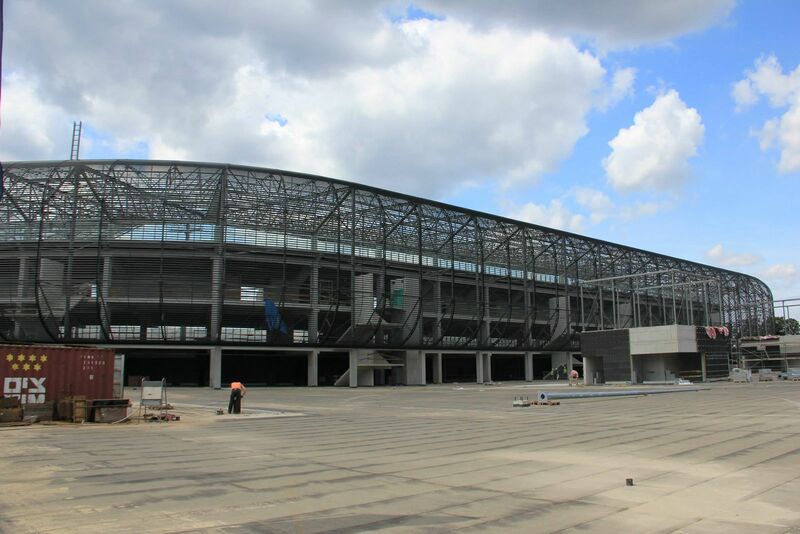 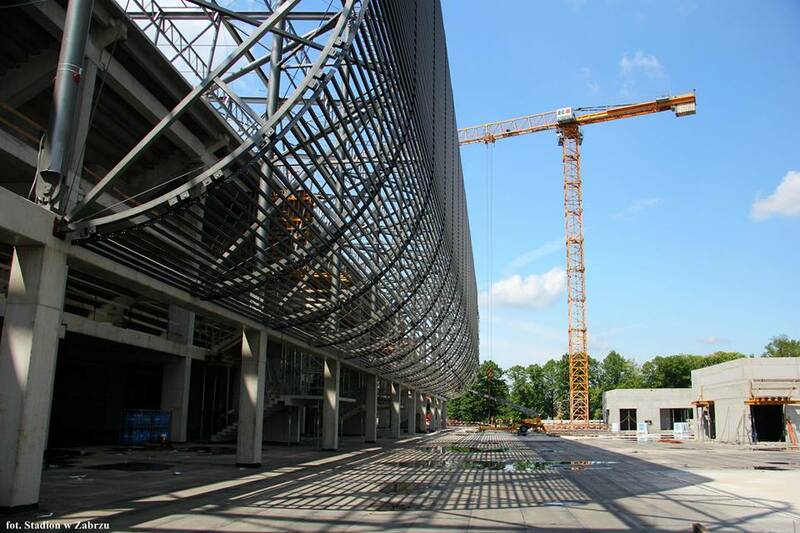 It’s exactly 41 days before deadline for delivery of three new stands in Zabrze, accommodating over 24,000 people. 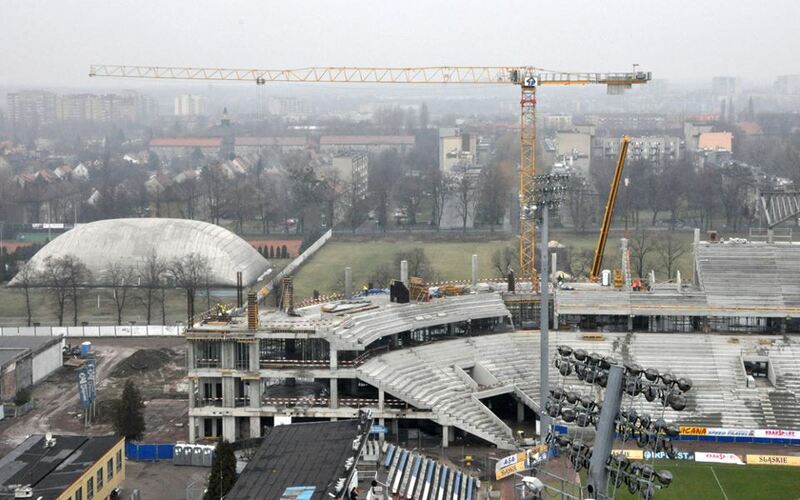 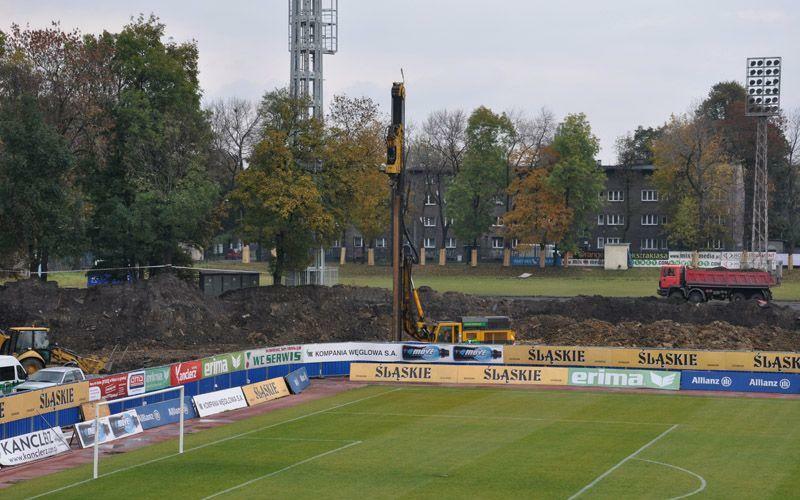 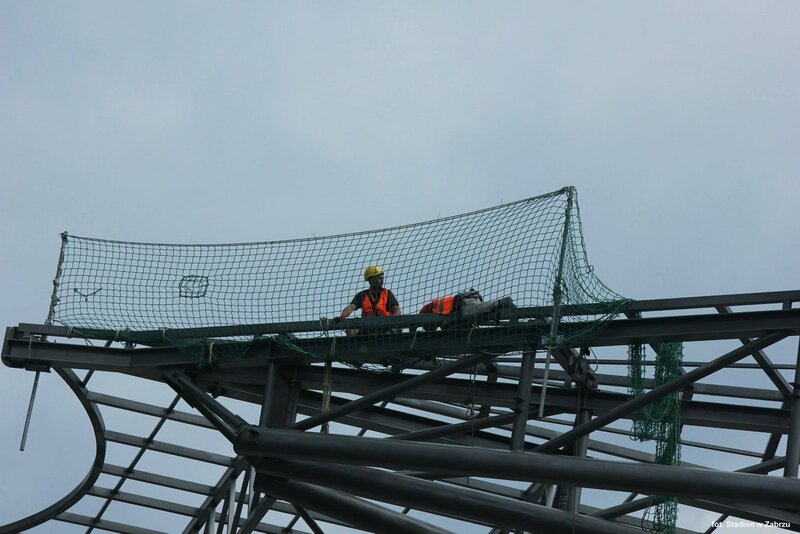 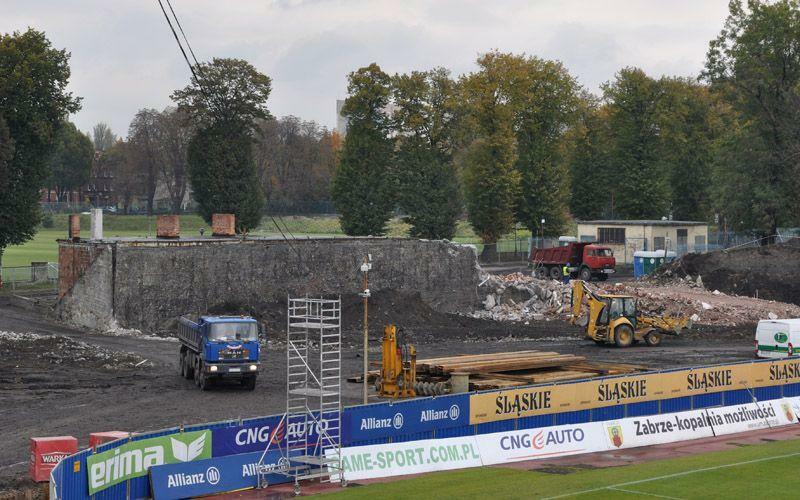 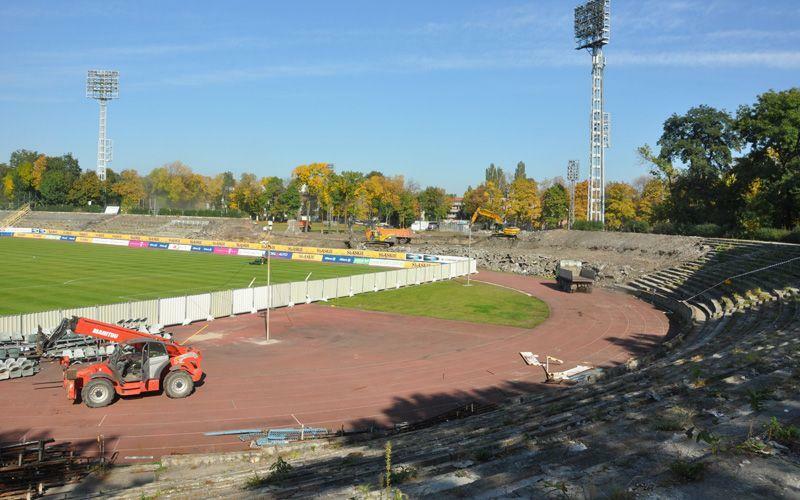 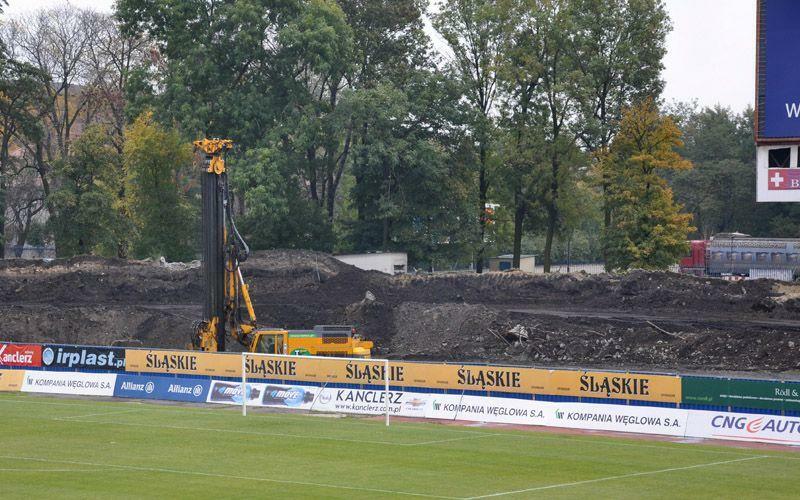 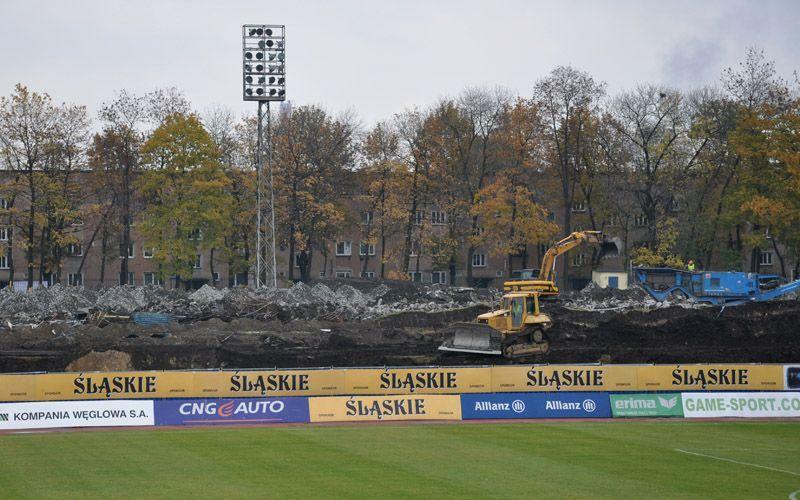 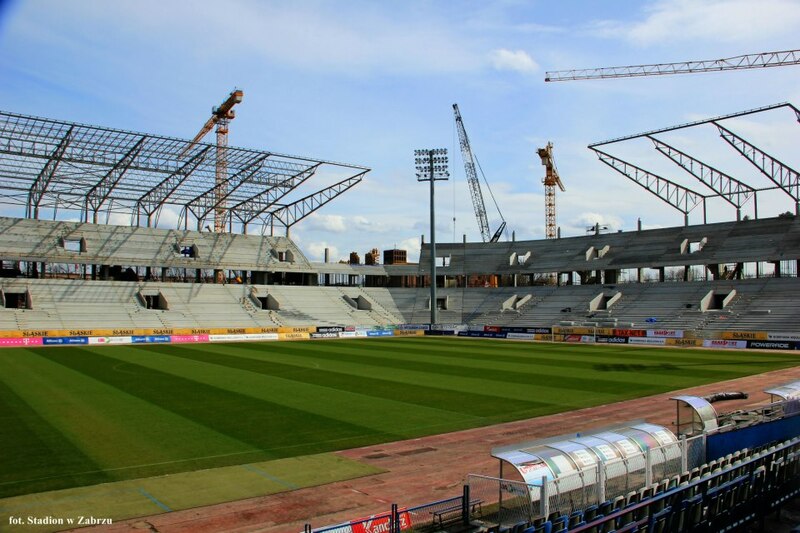 But current Ekstraklasa leader Górnik may have to plan opening for late next year, because general contractor is on the brink of insolvency and works aren’t progressing at all. 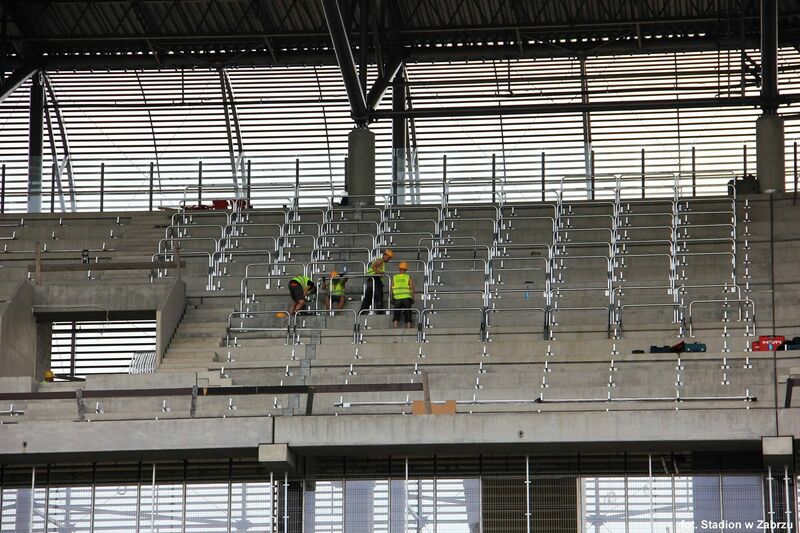 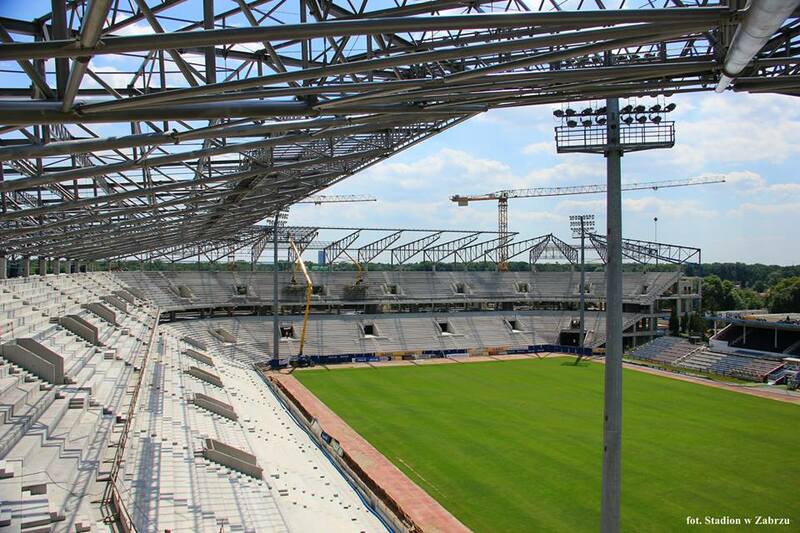 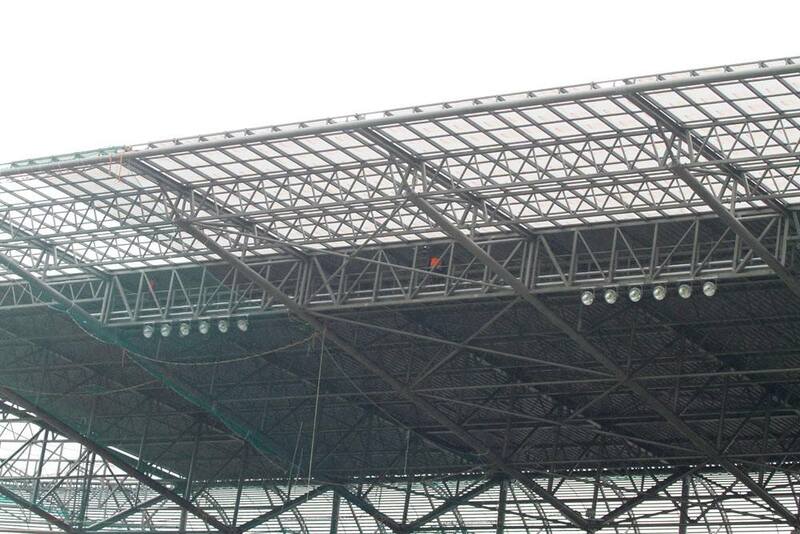 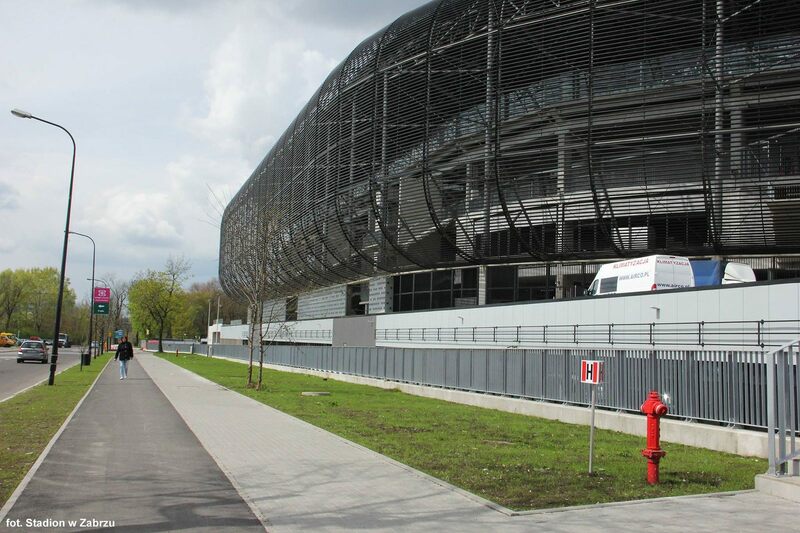 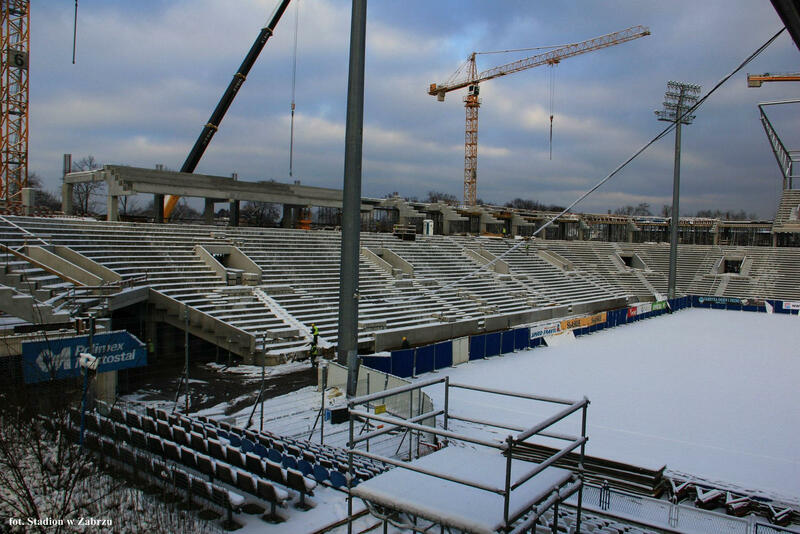 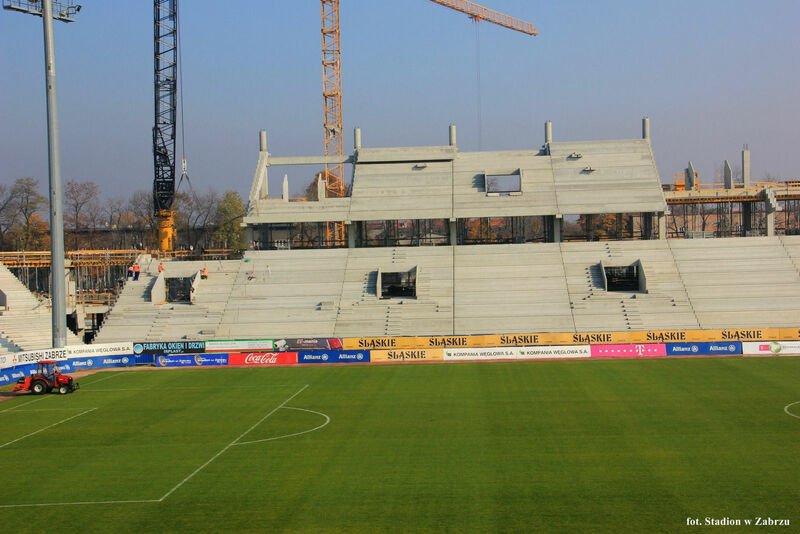 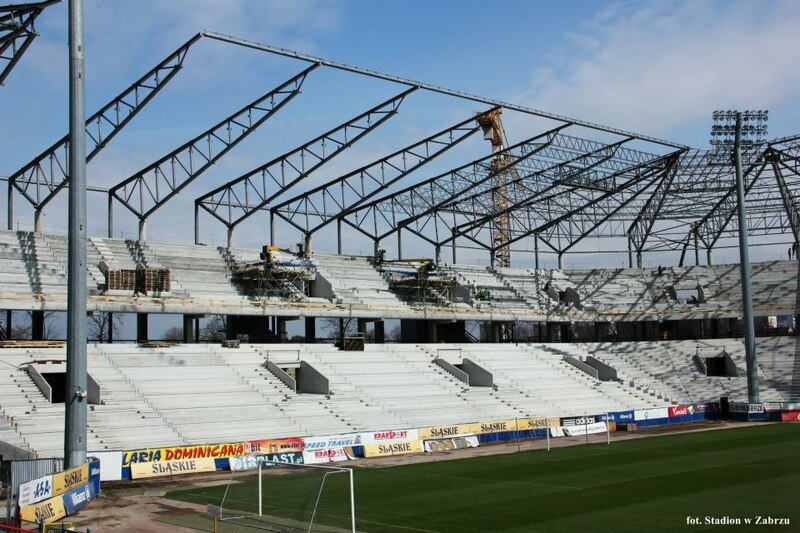 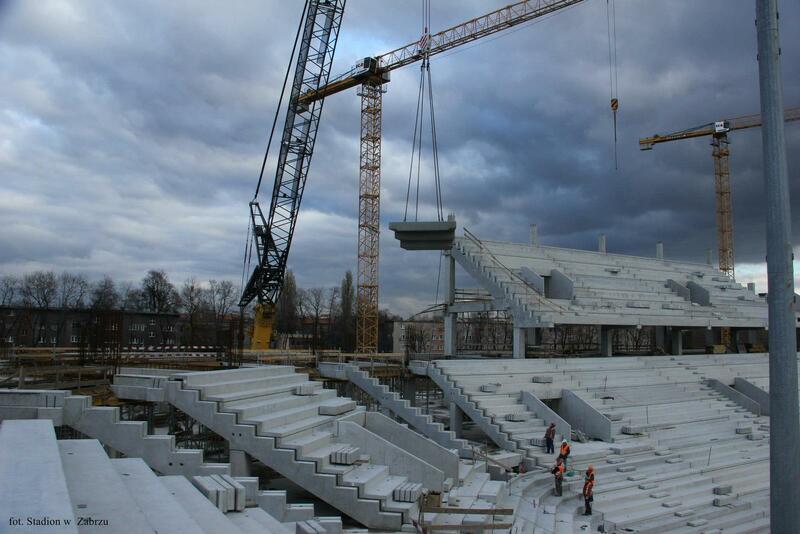 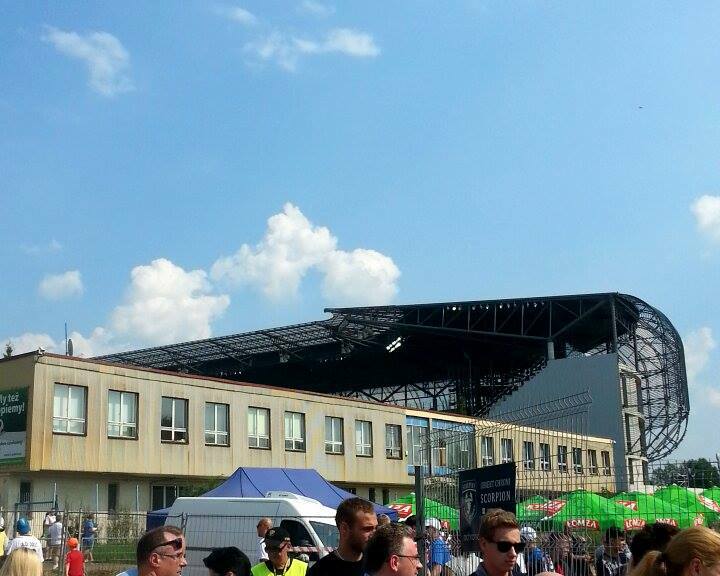 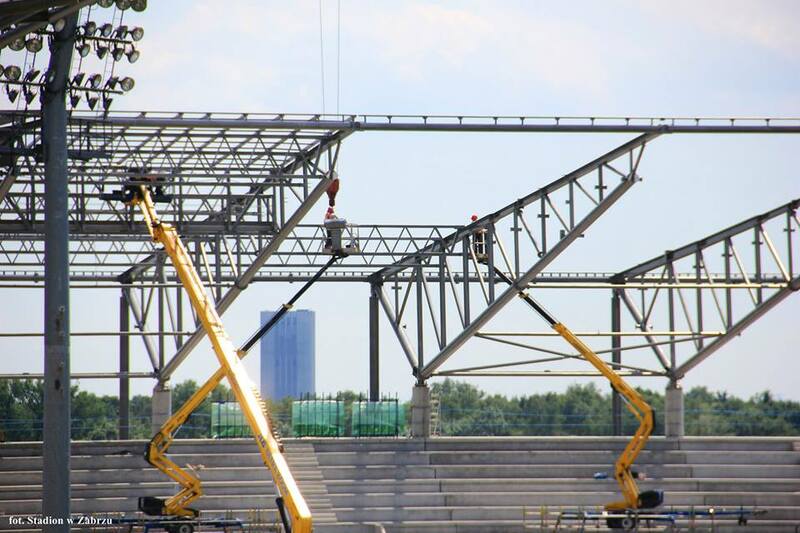 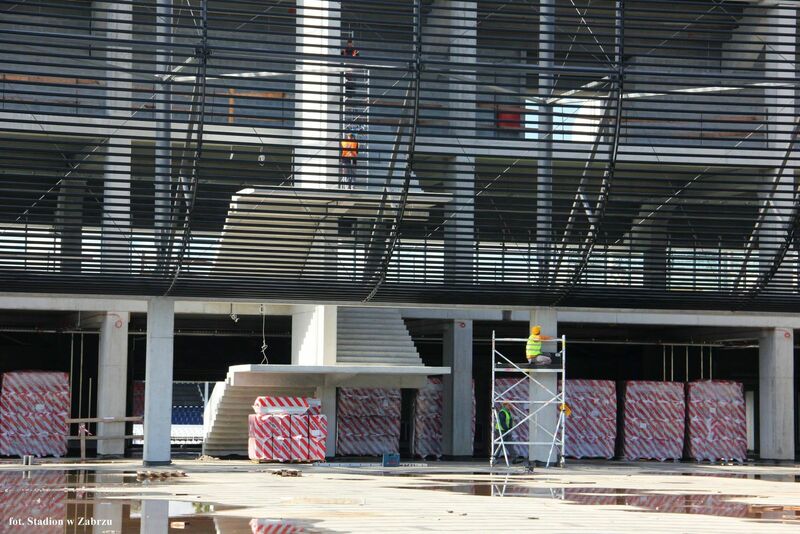 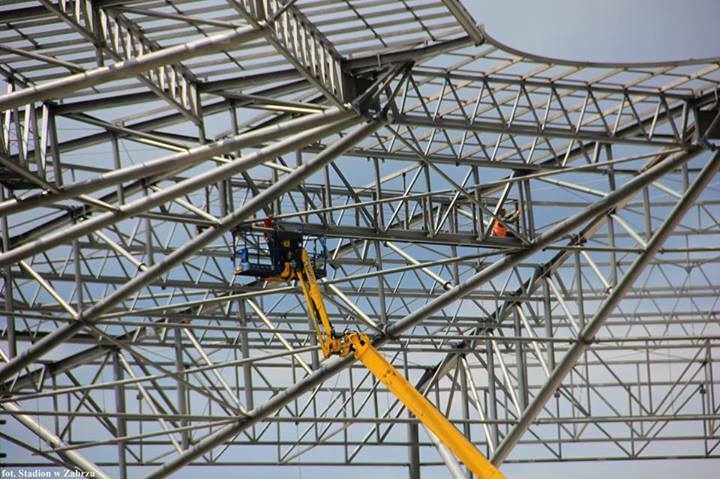 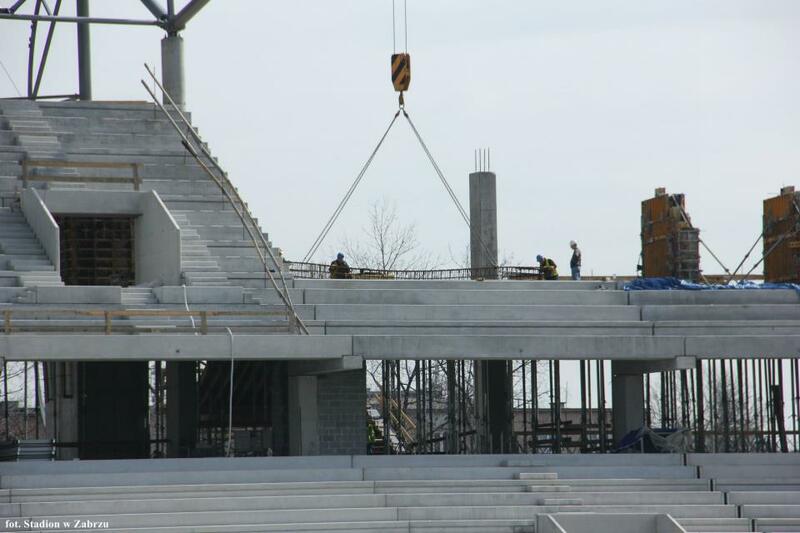 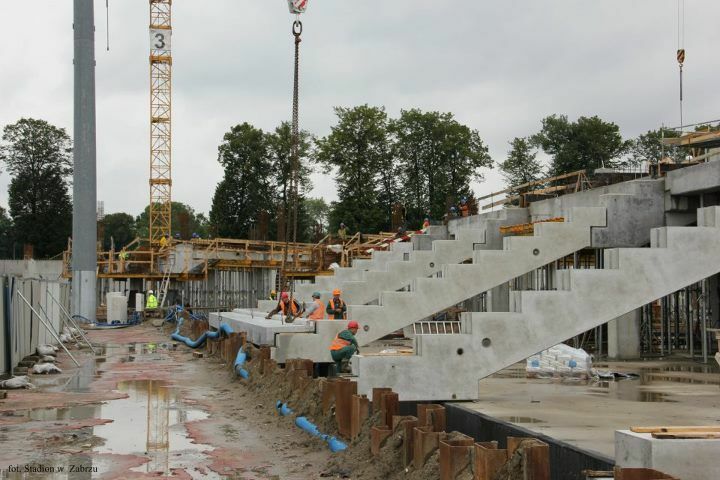 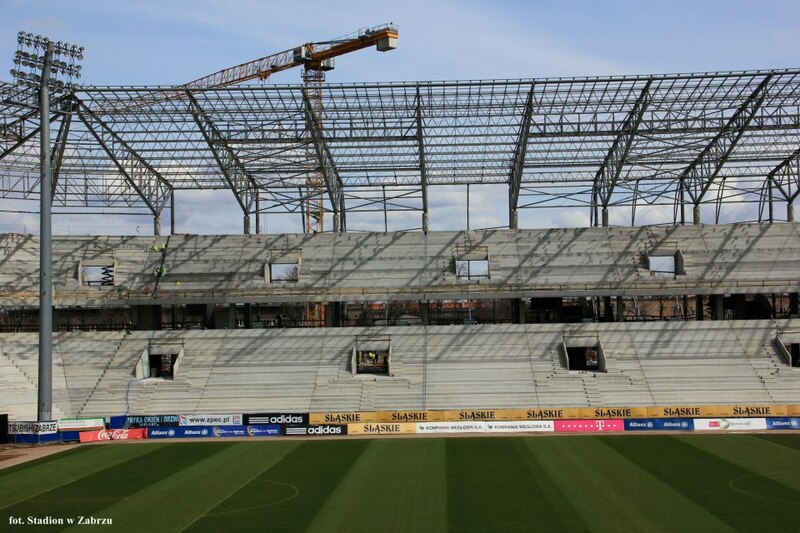 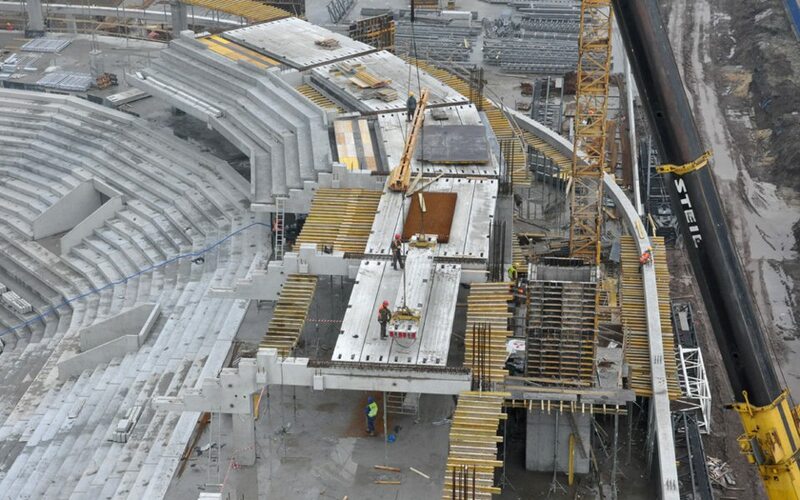 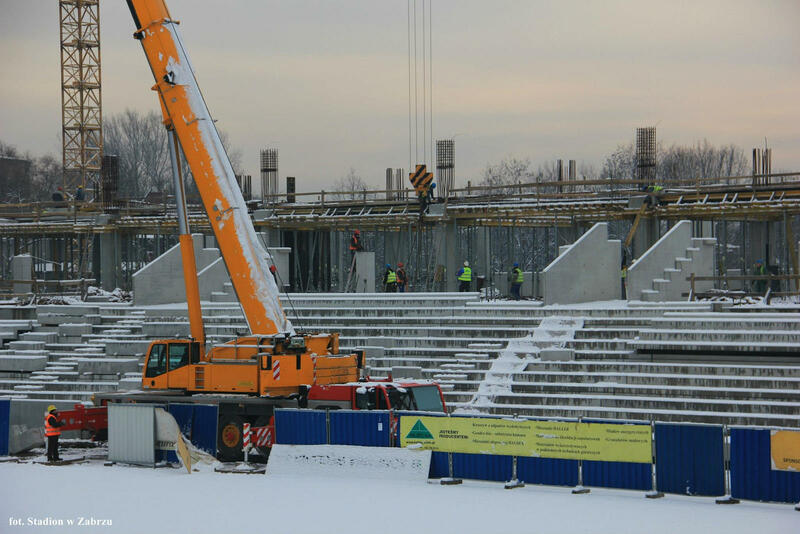 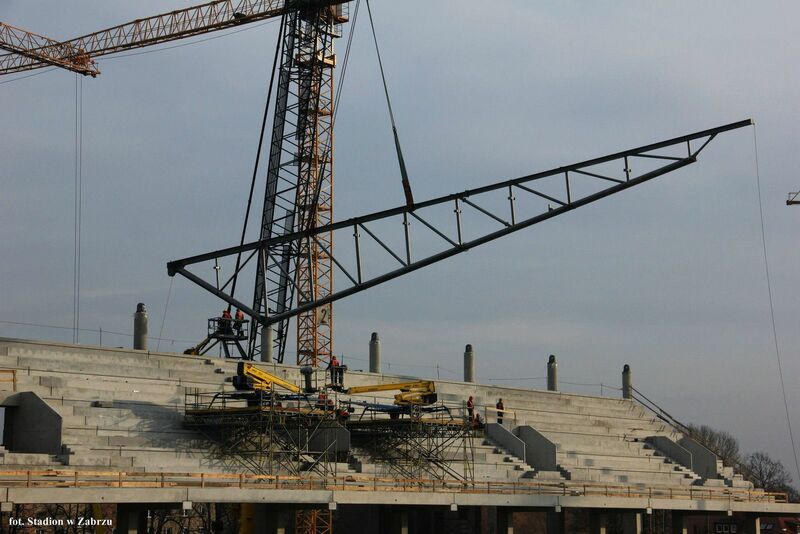 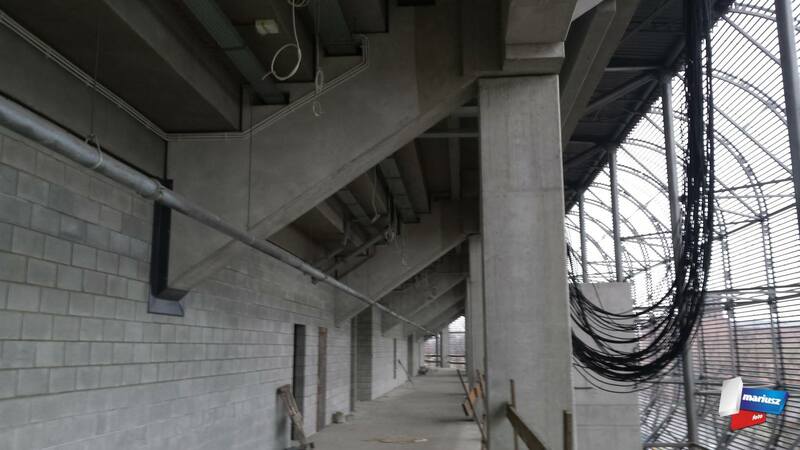 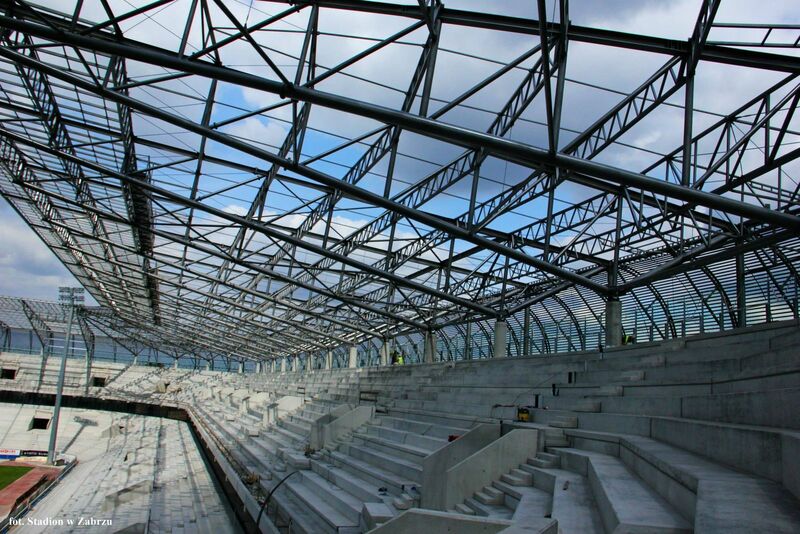 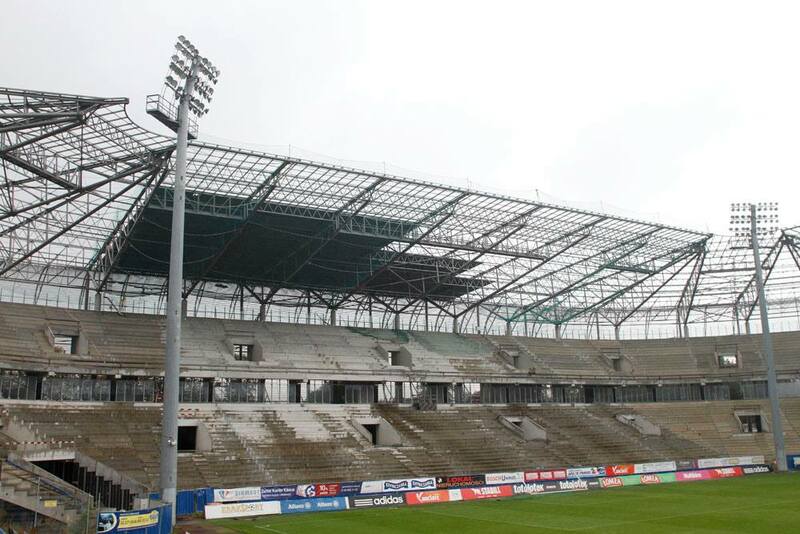 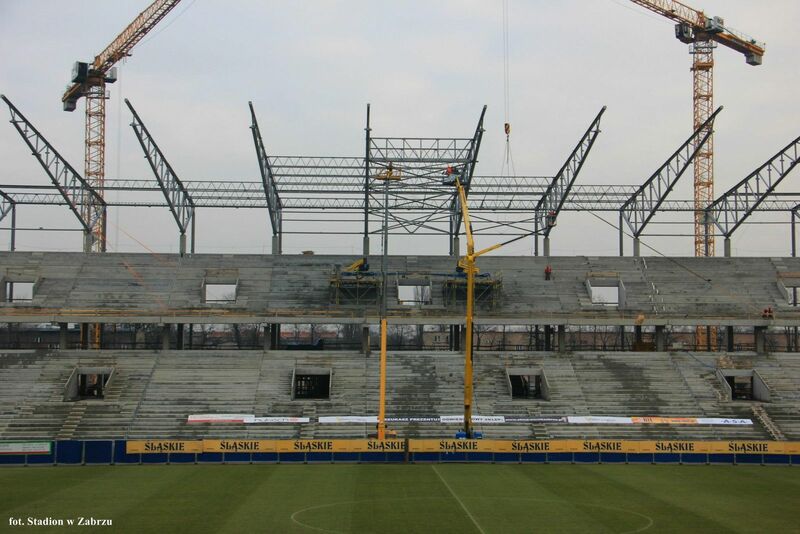 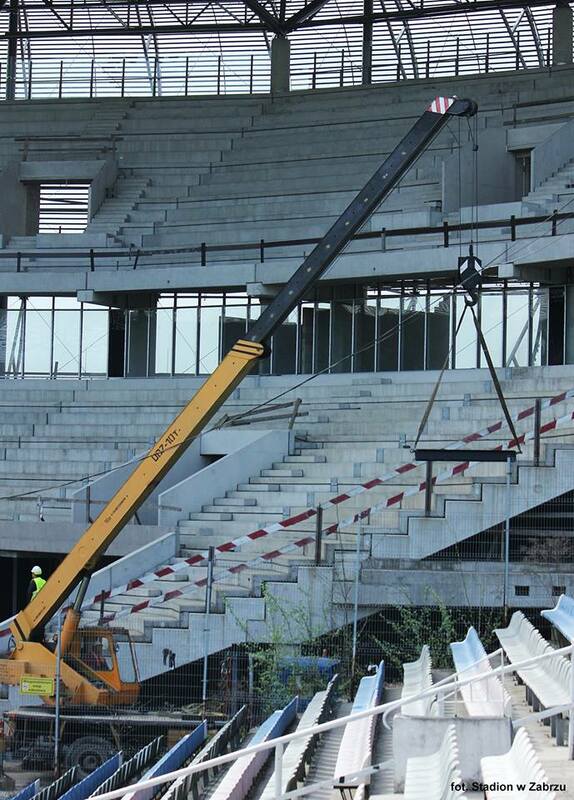 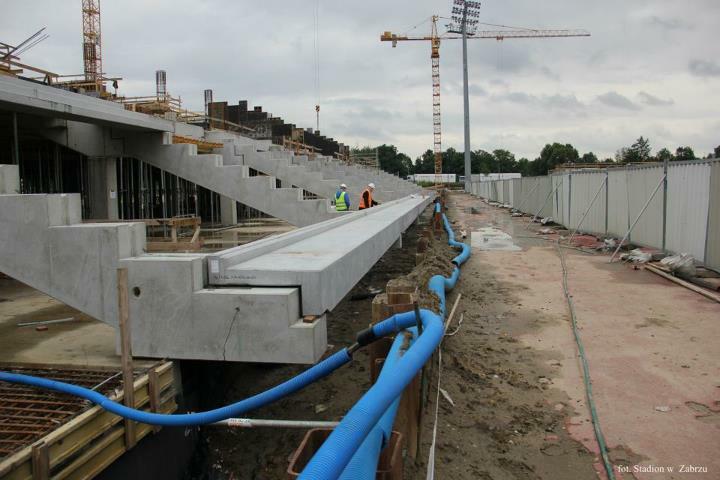 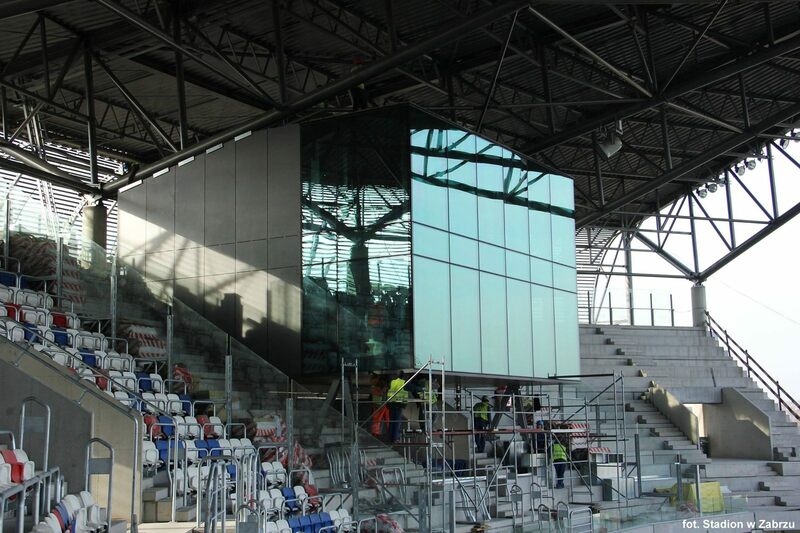 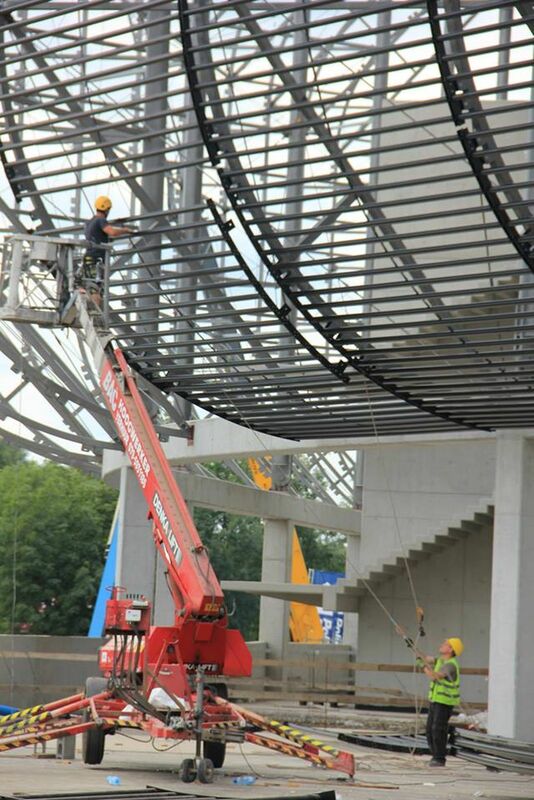 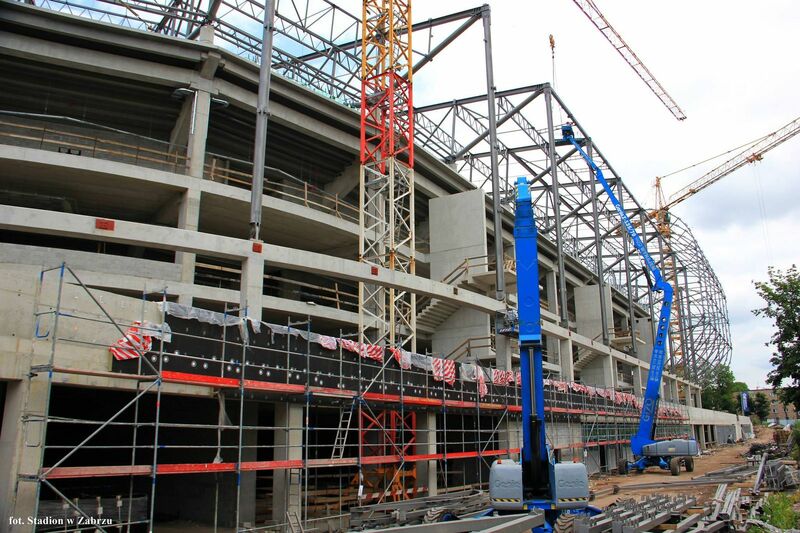 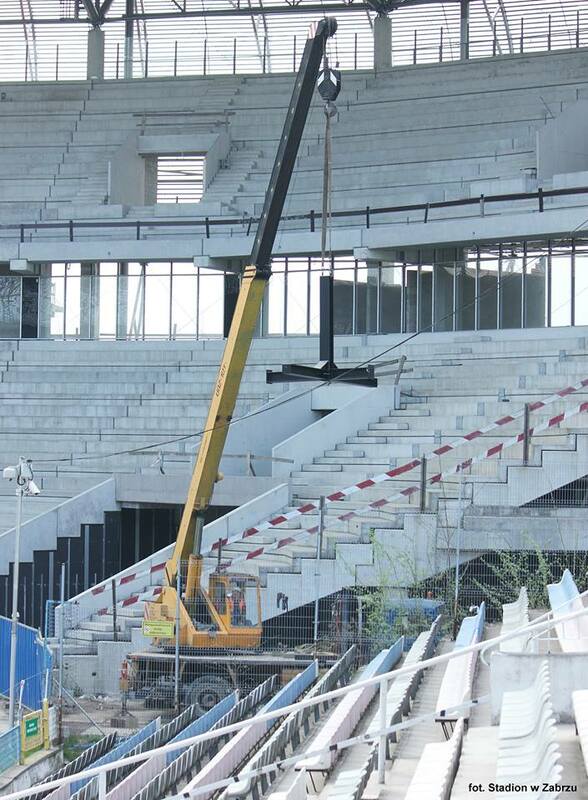 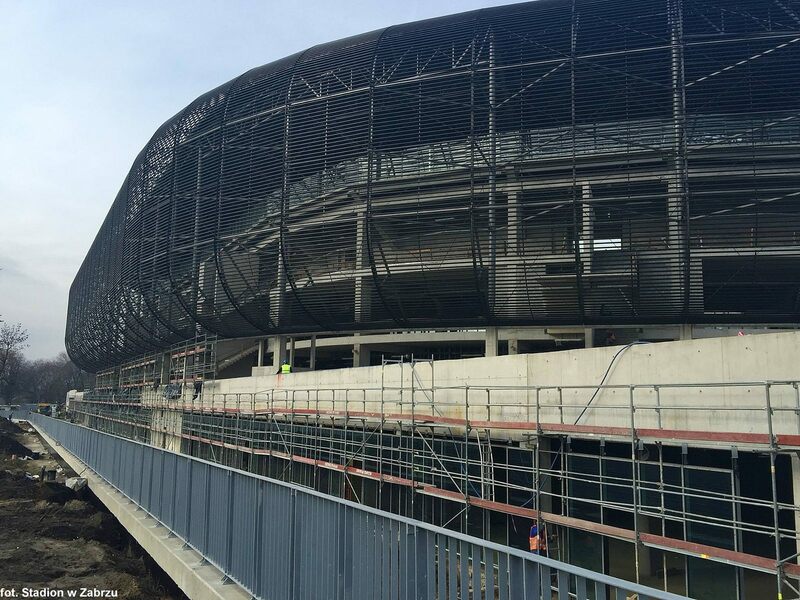 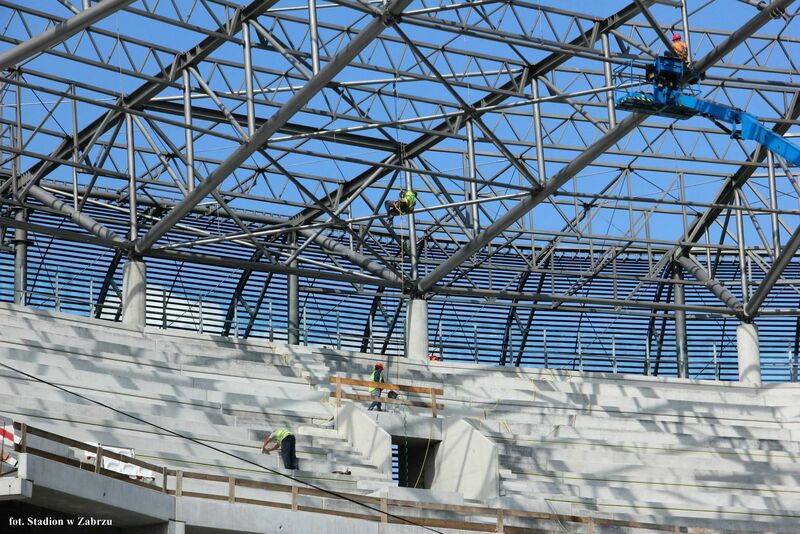 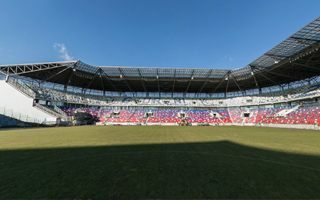 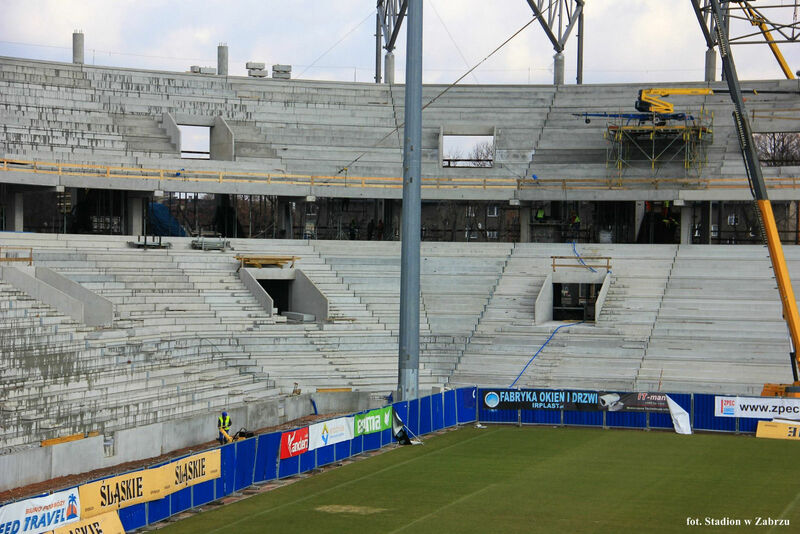 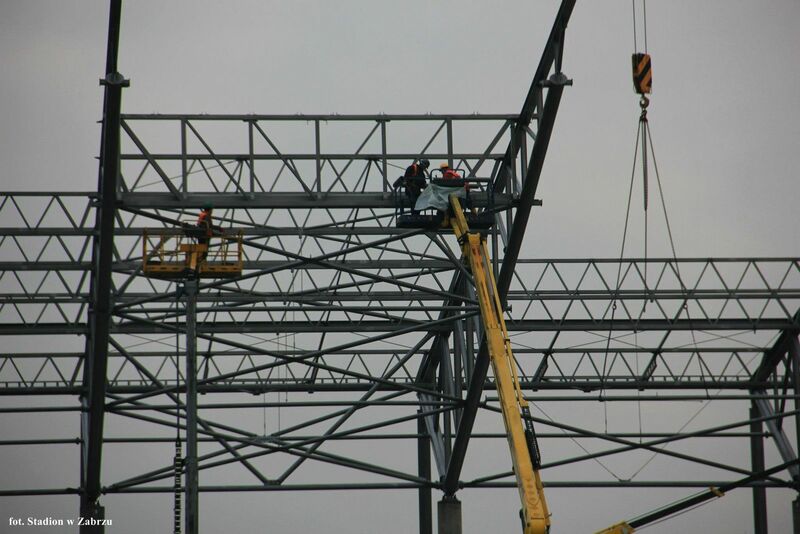 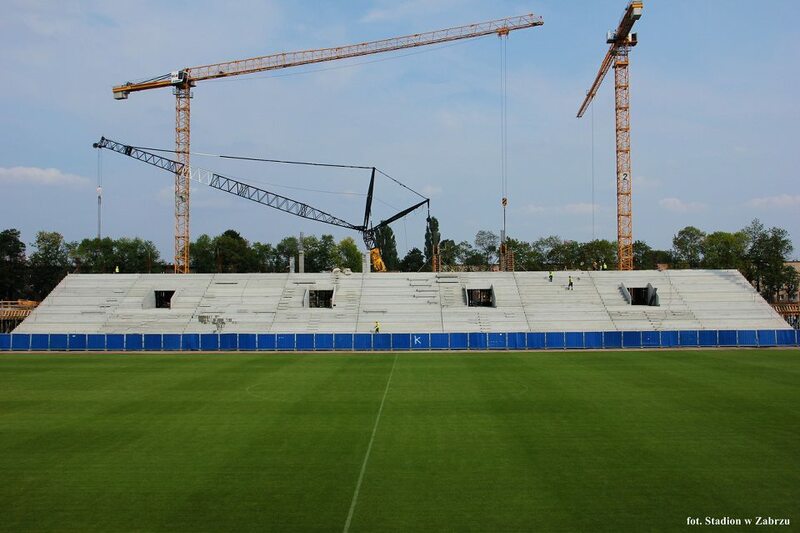 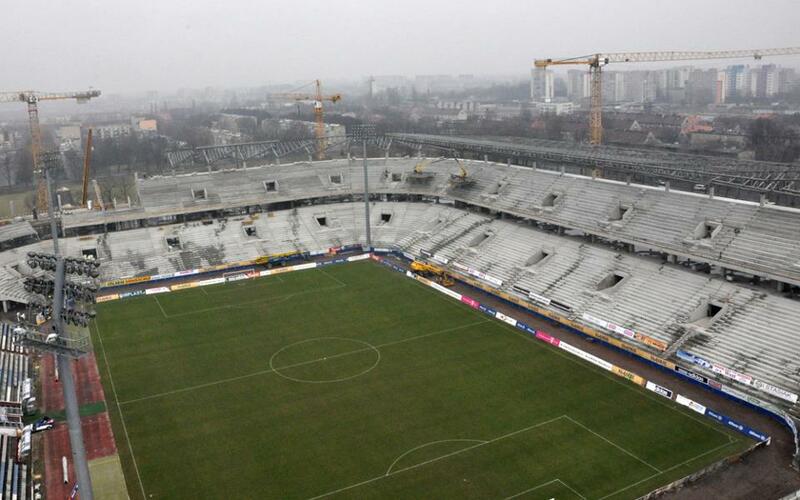 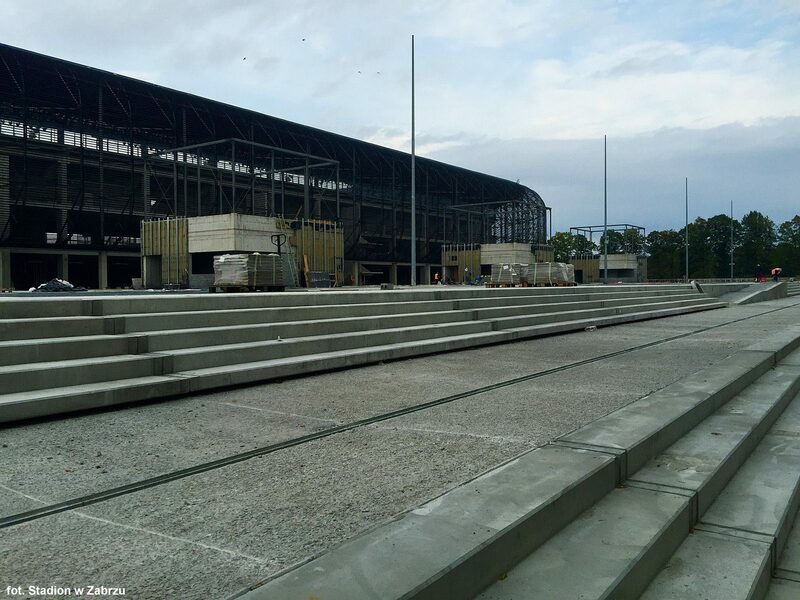 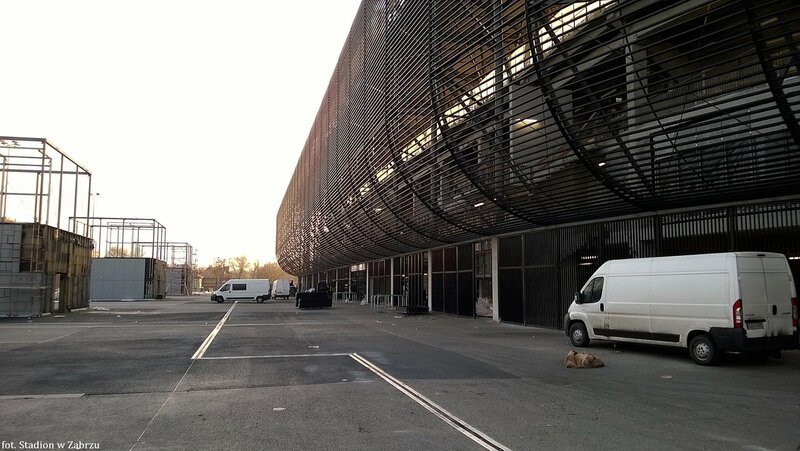 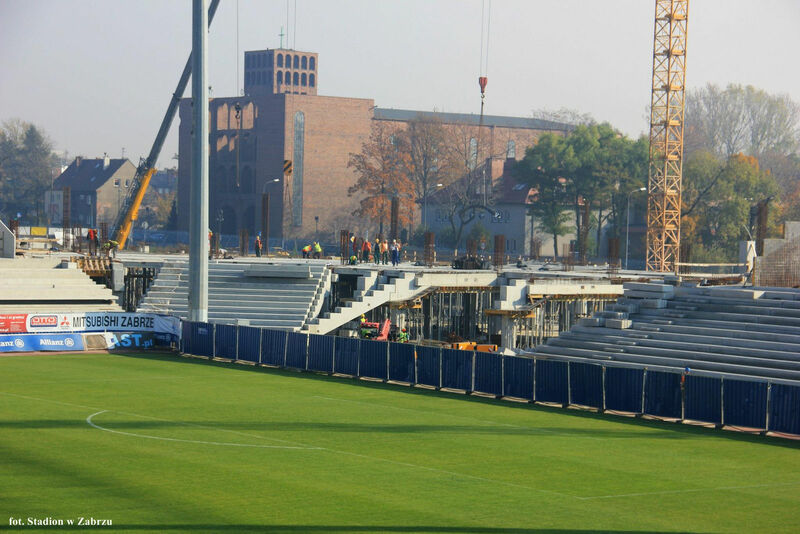 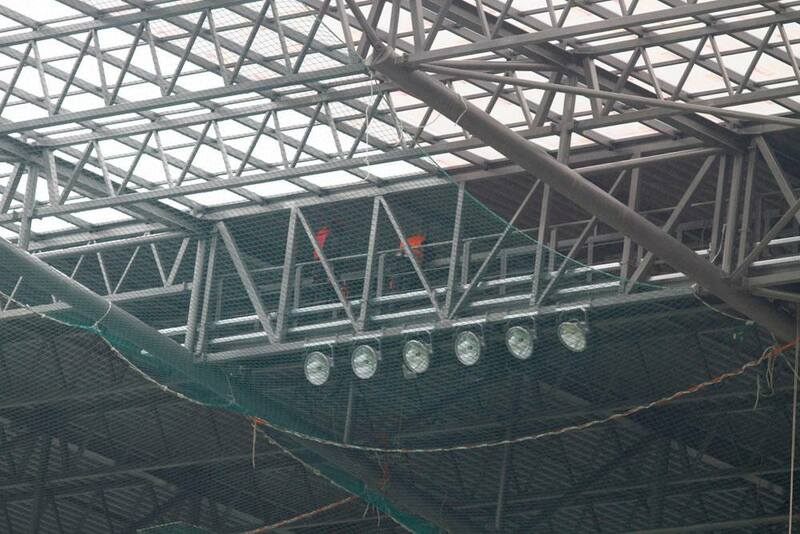 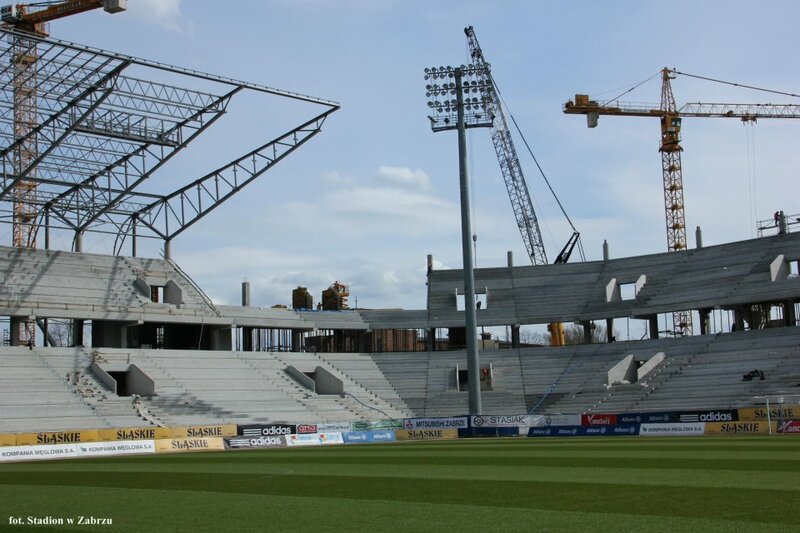 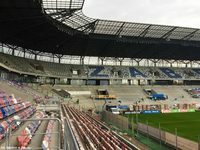 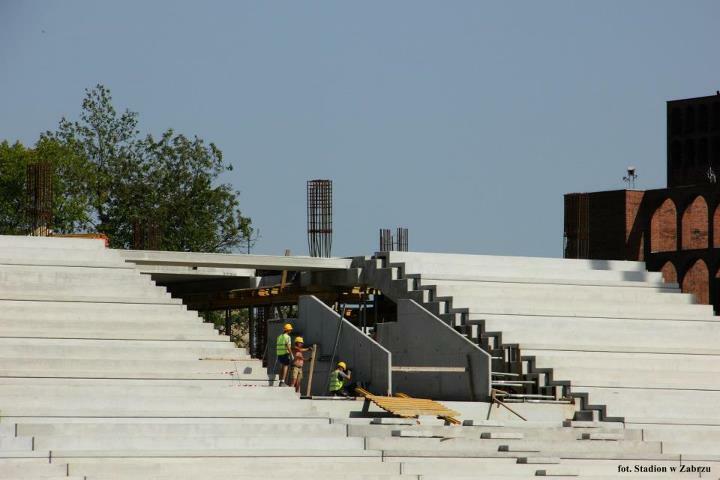 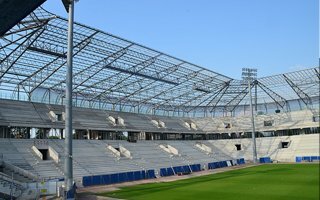 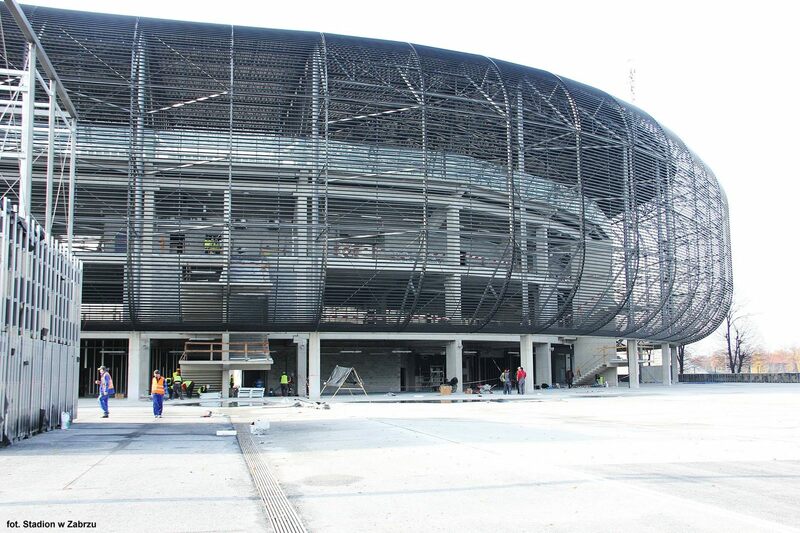 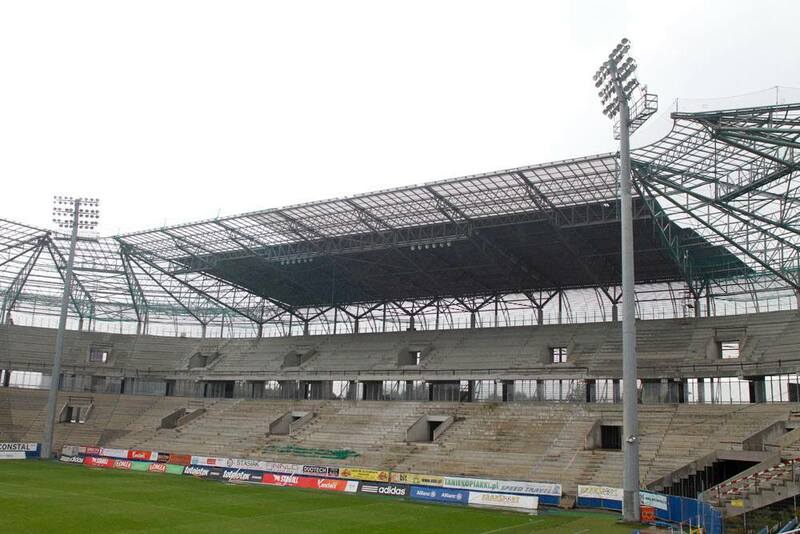 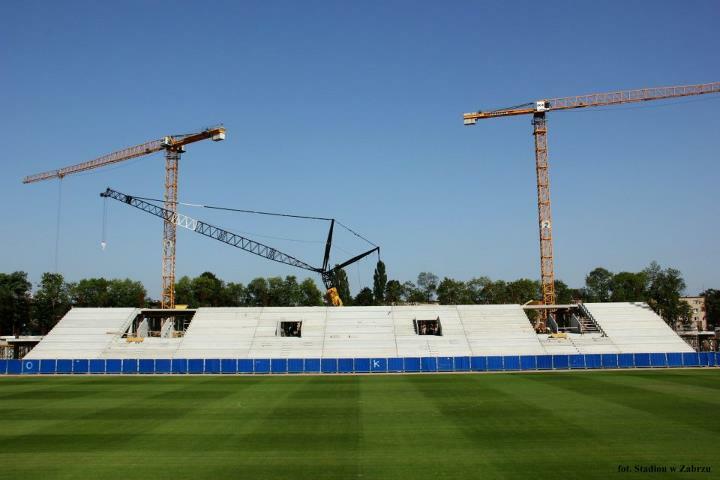 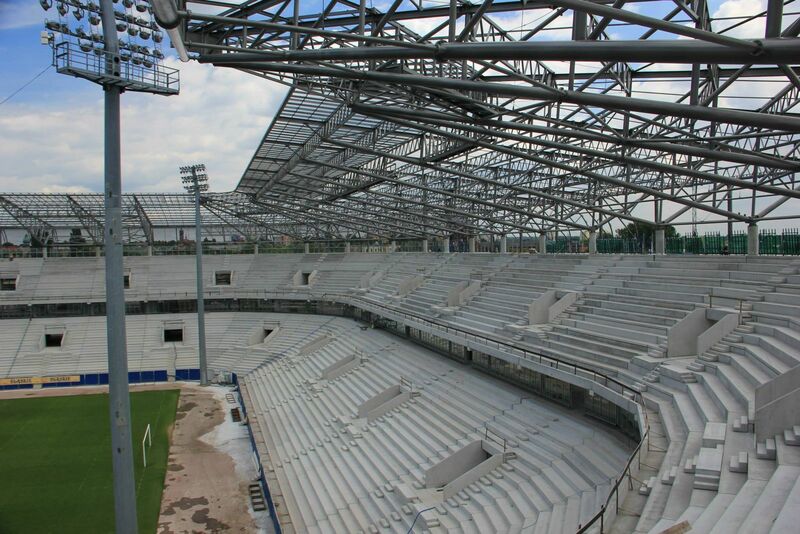 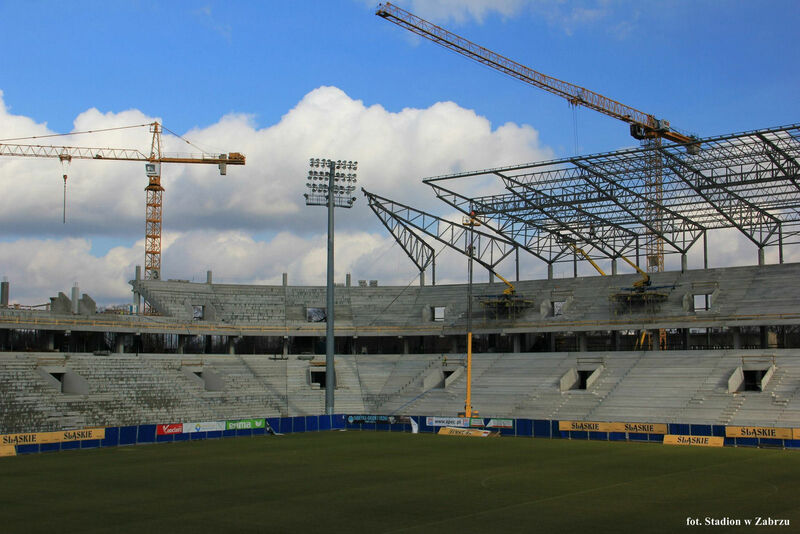 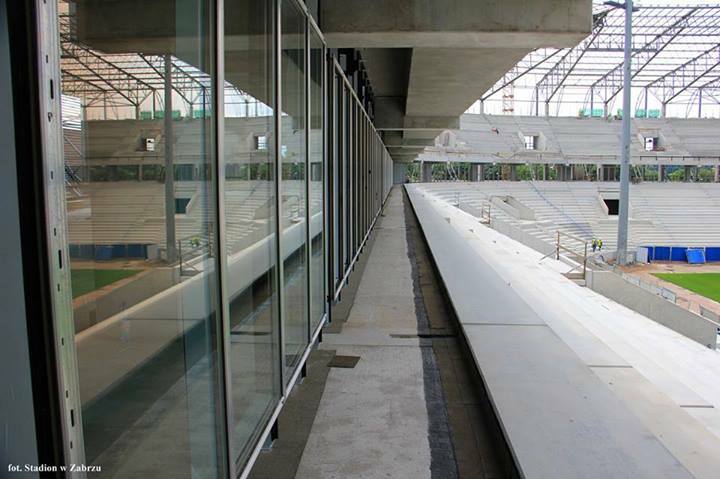 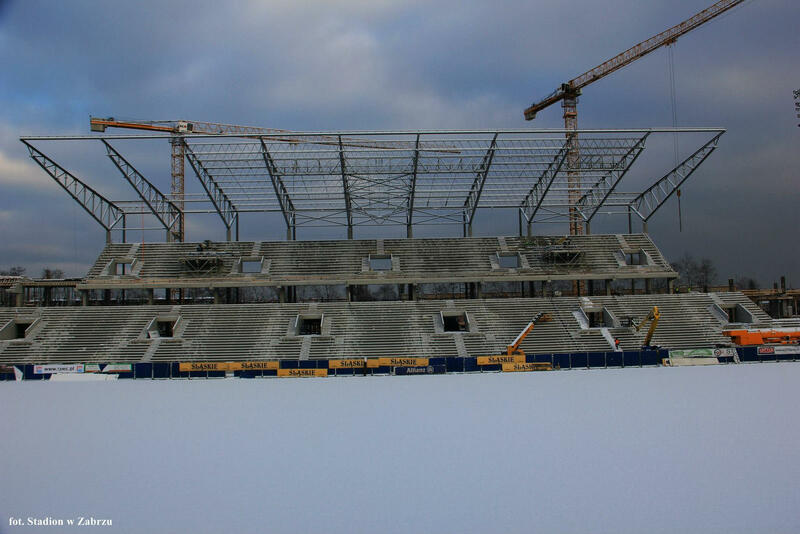 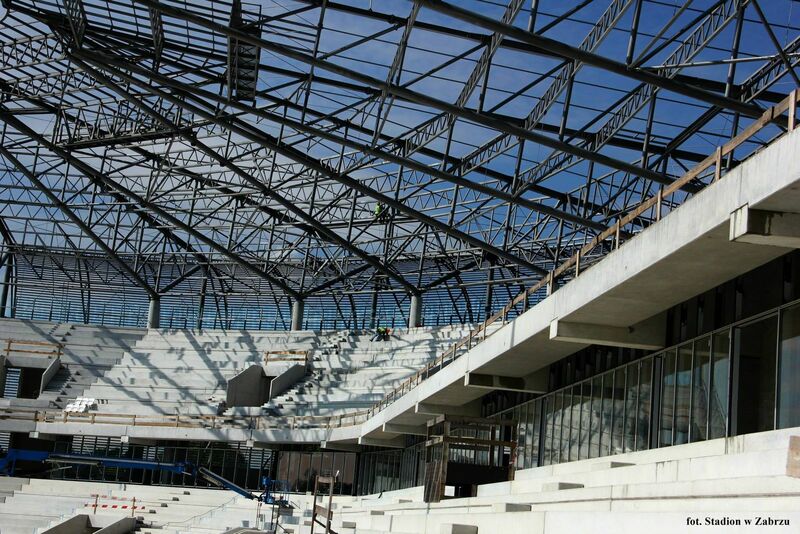 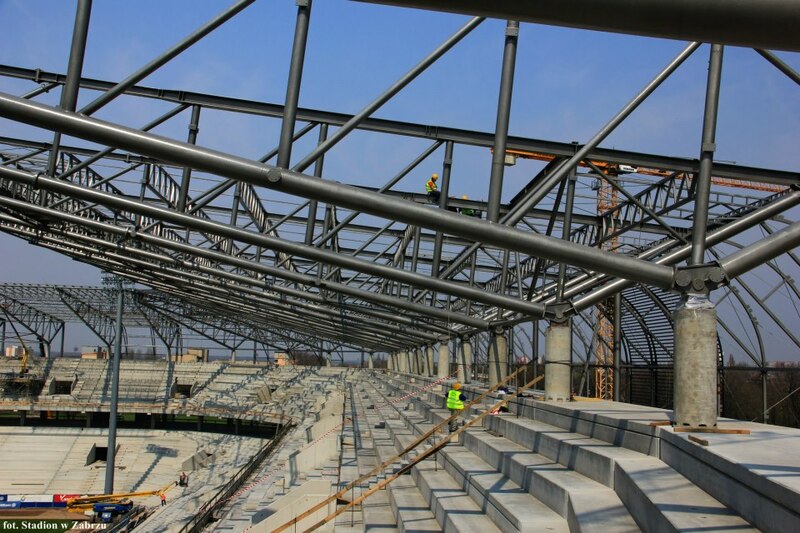 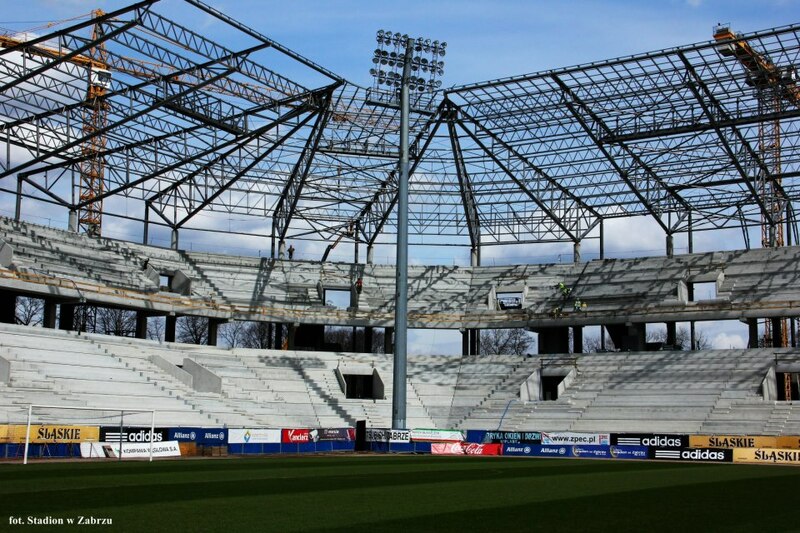 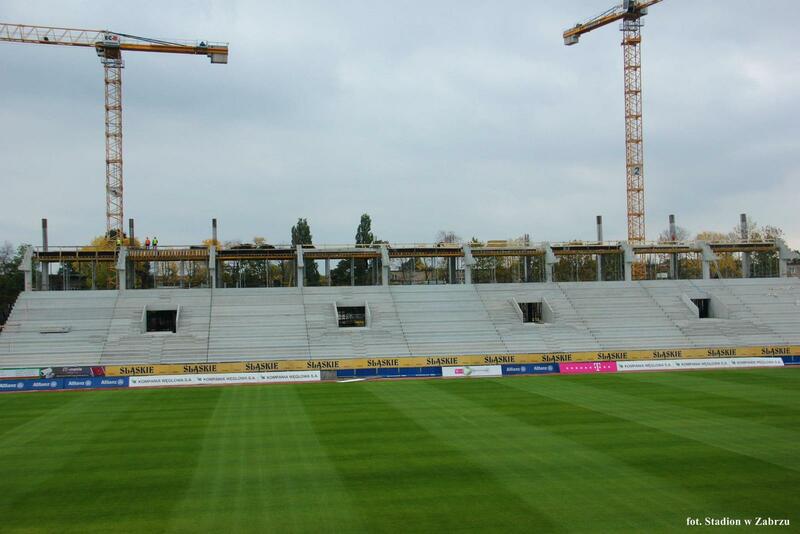 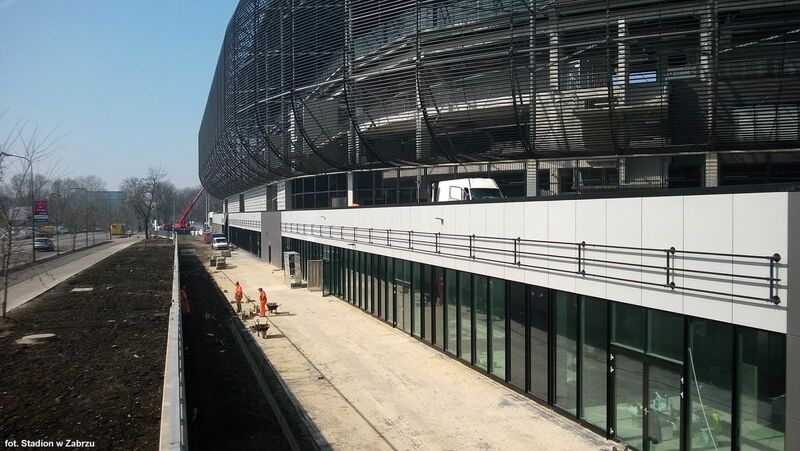 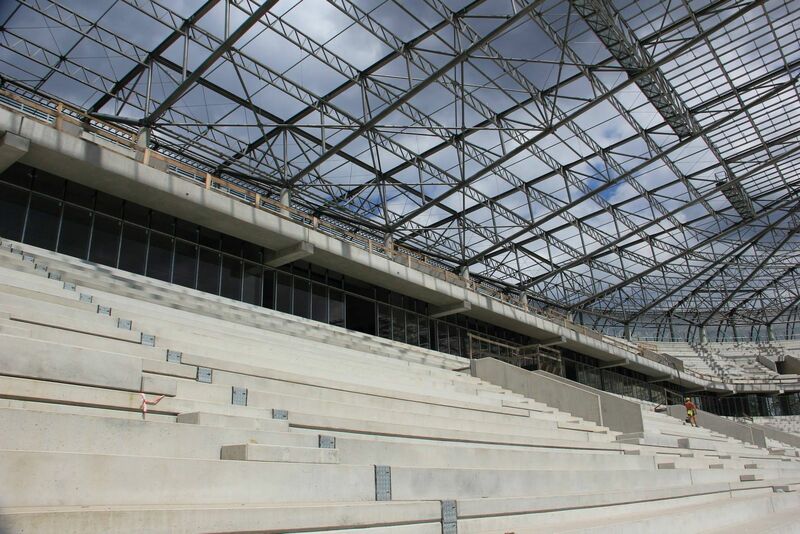 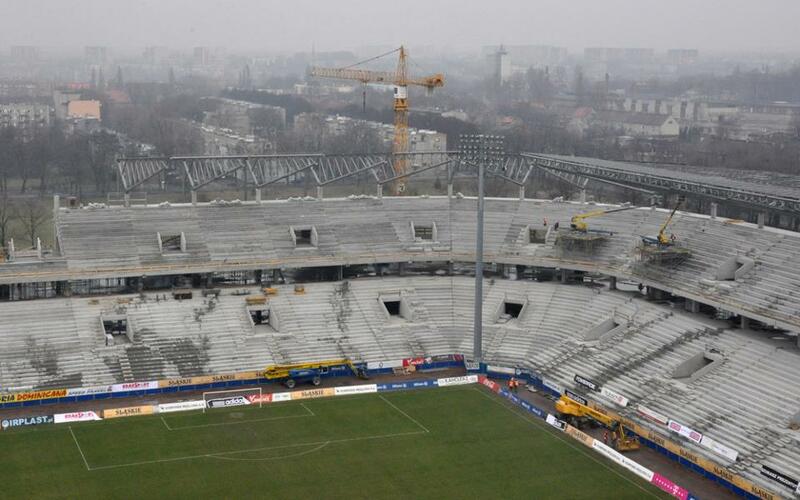 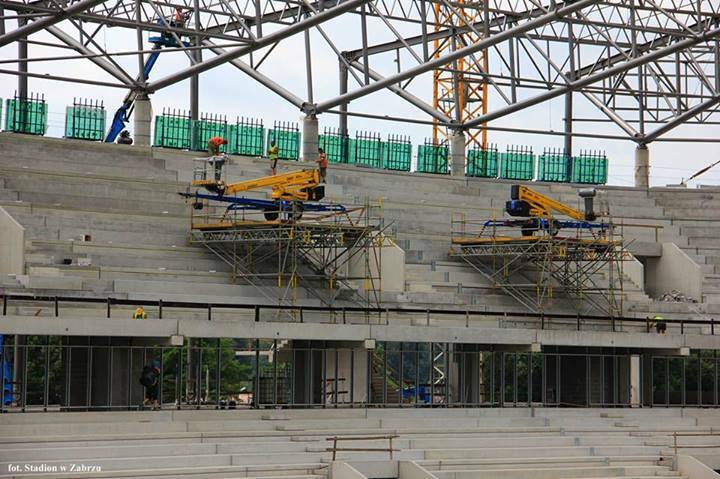 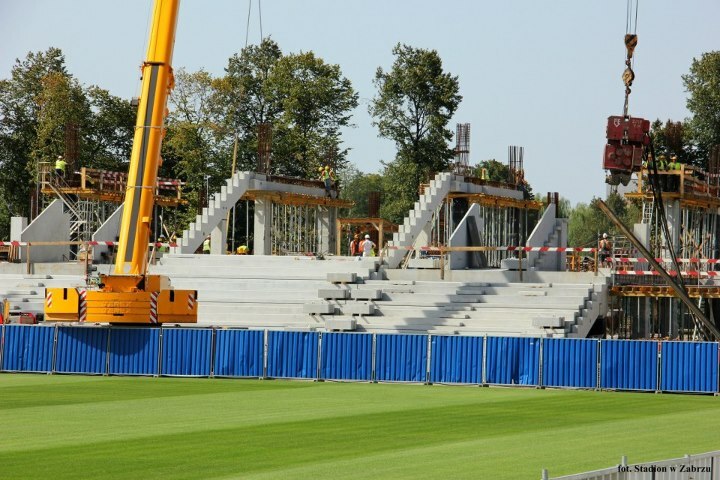 First three stands of the new 32,000-seater in Zabrze were to be delivered in just several days. 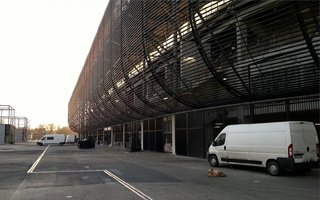 But it's been known for months that it's not possible. 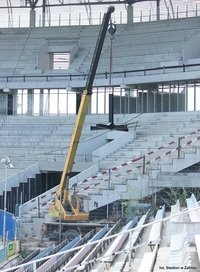 Now it gets worse, as even the new September deadline isn't within contractors' reach. 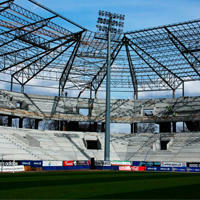 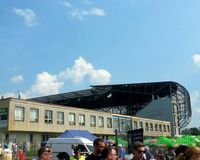 05.09.2012 Naming rights: One more deal for Allianz? 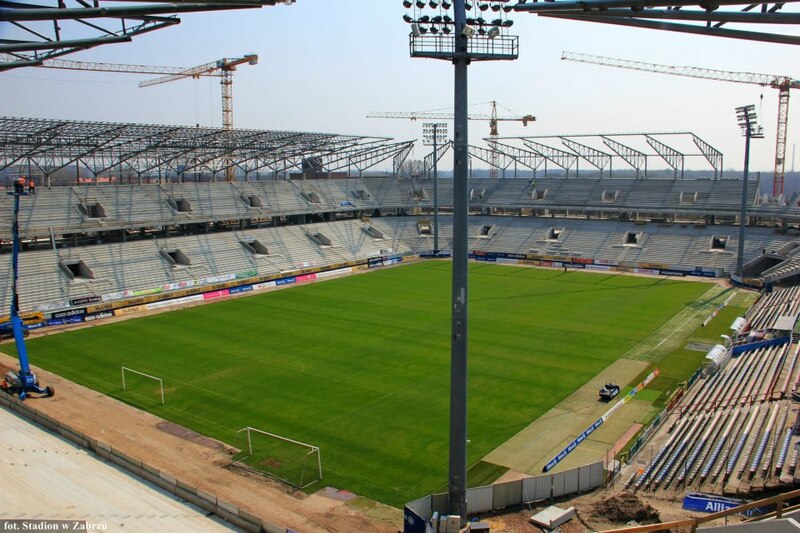 Insurance giant already bought rights for three stadiums in Germany, France and Australia. 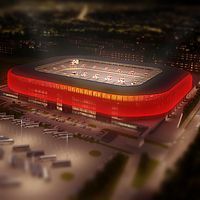 Will Poland deliver their fourth arena? 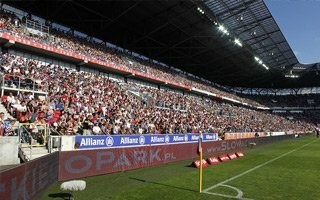 Municipality of Zabrze hope so as they negotiate with Allianz, Sport.pl writes. 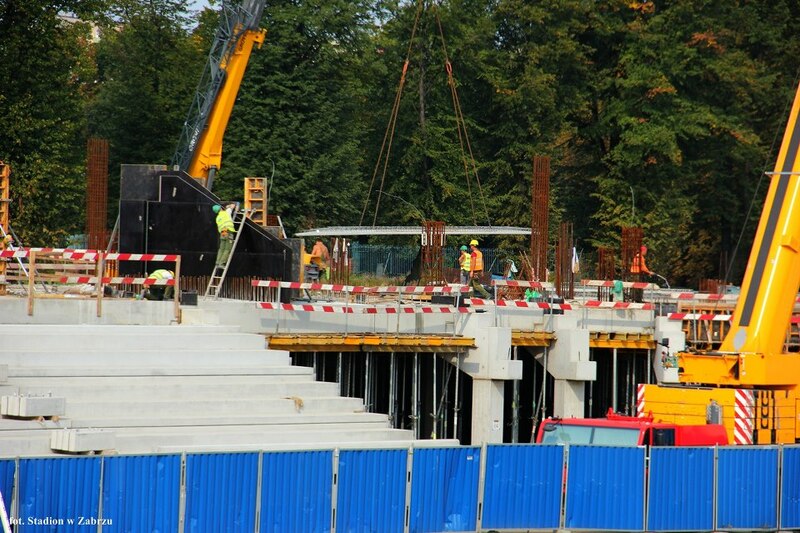 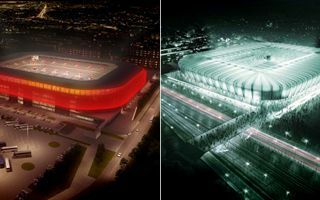 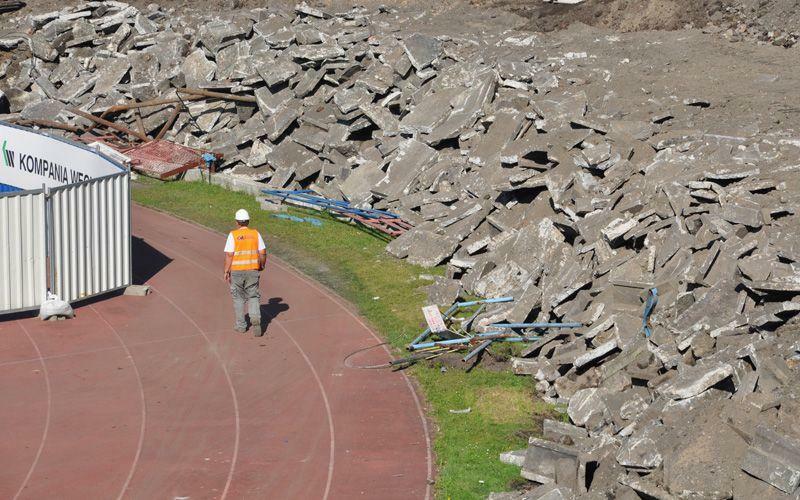 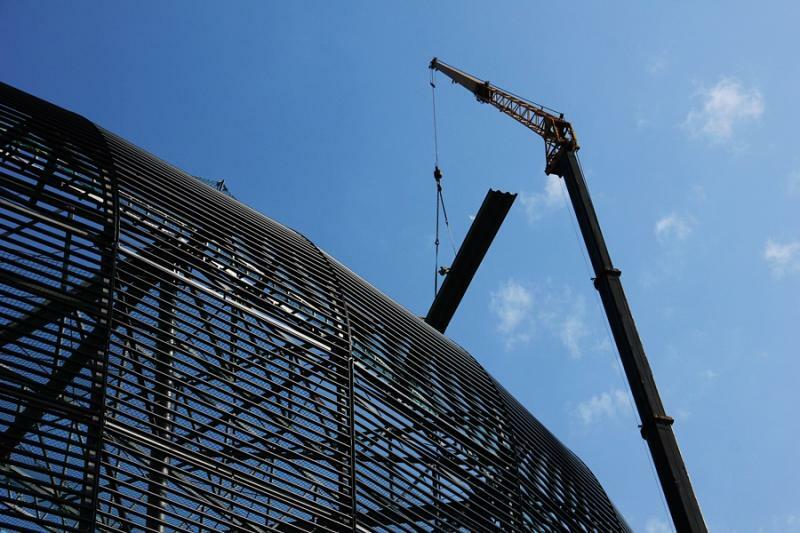 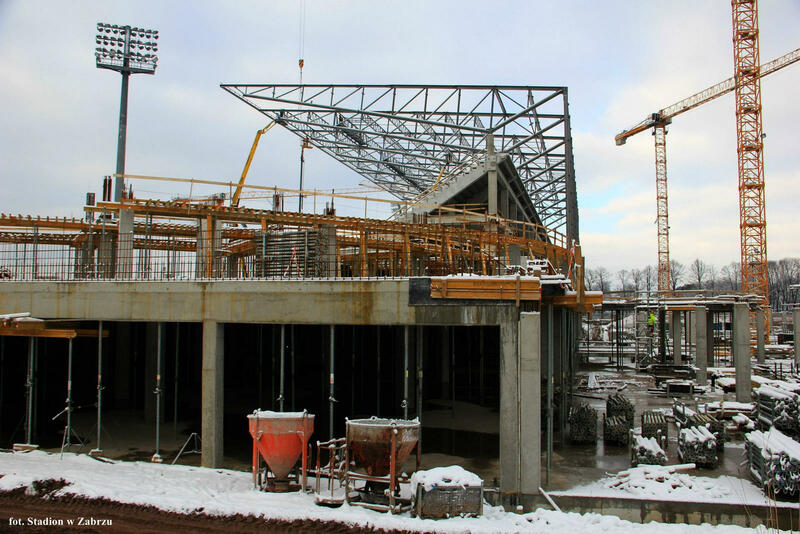 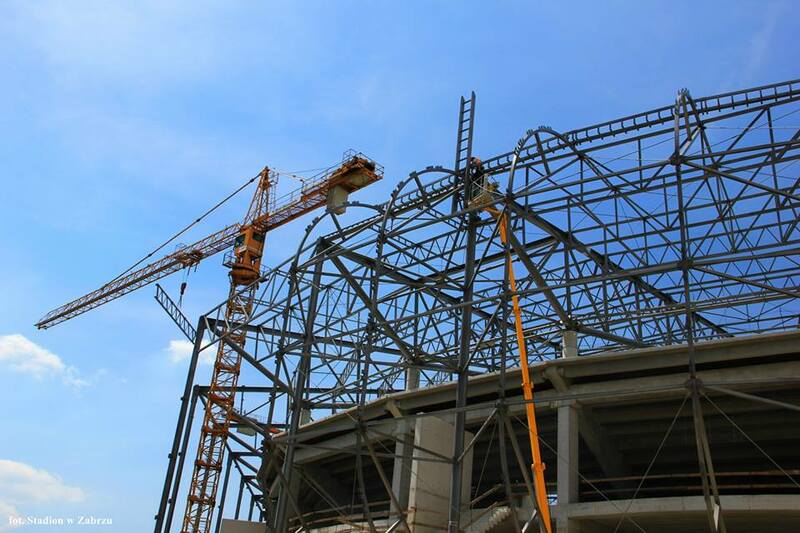 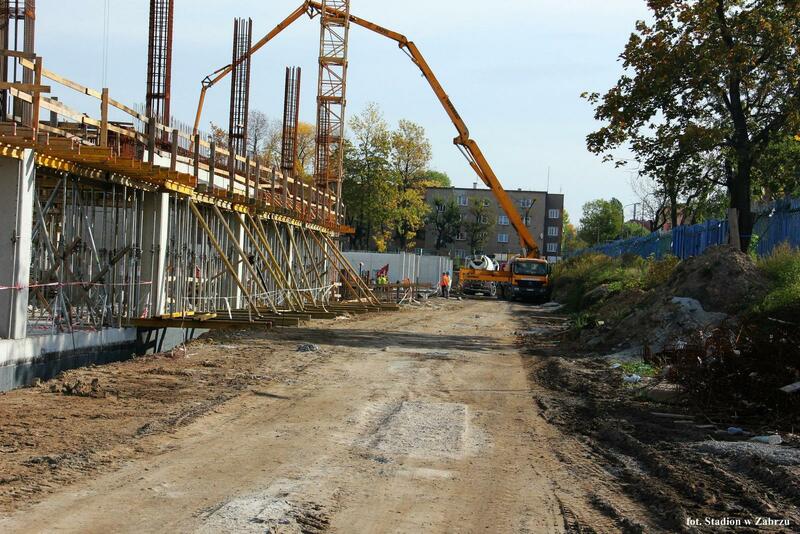 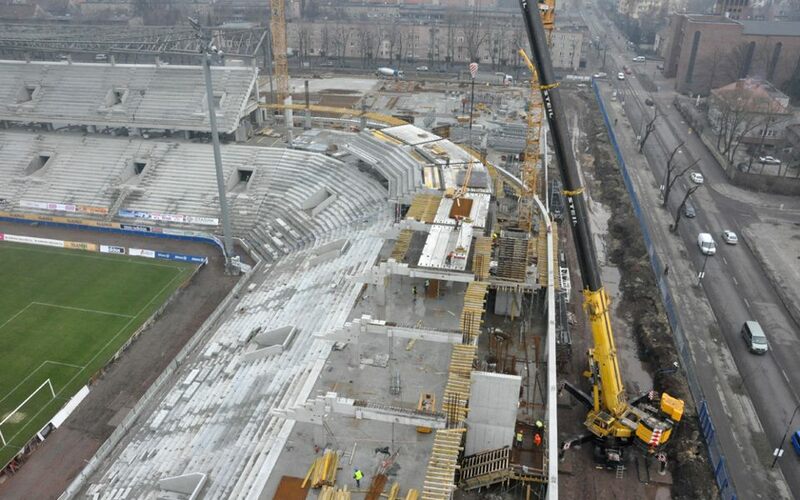 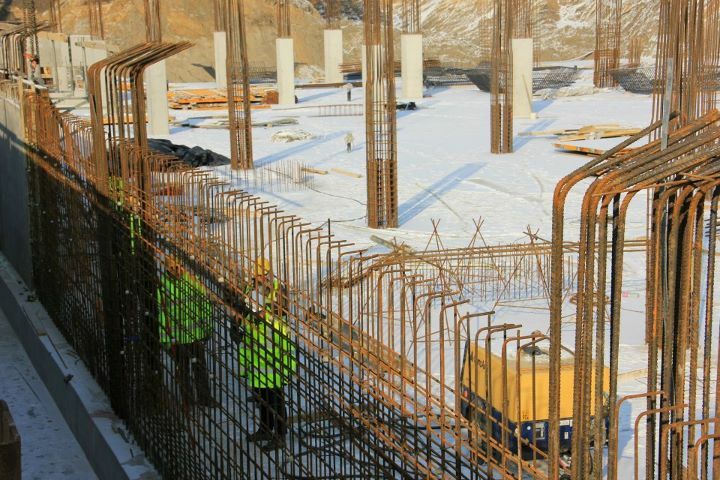 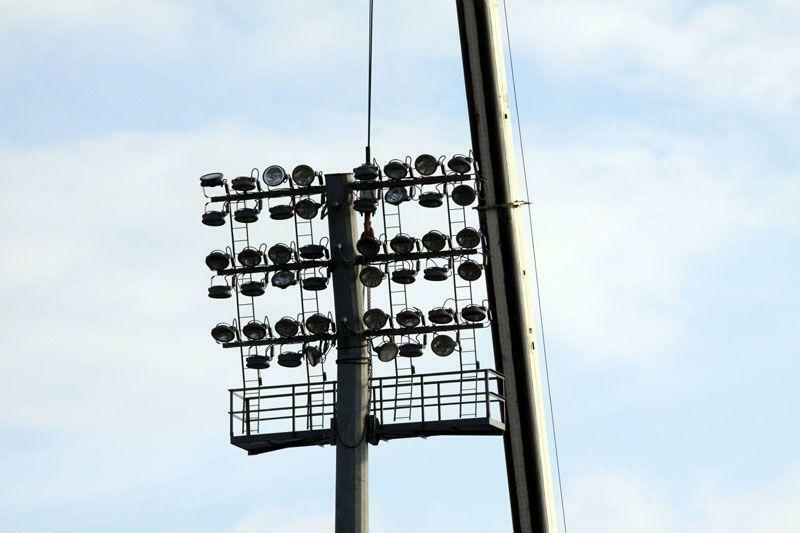 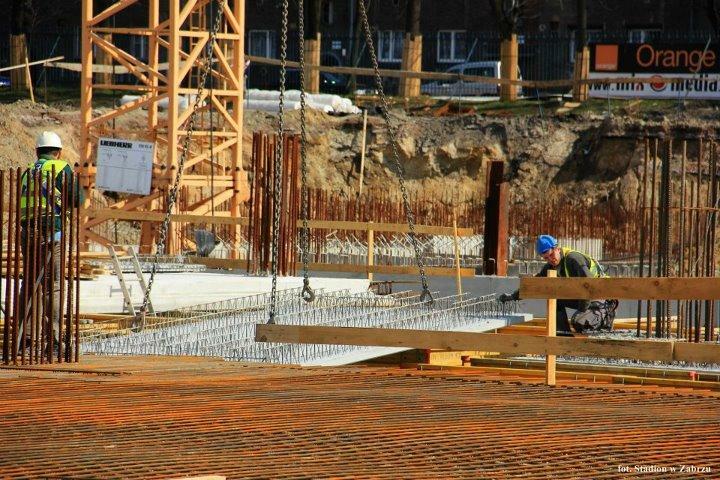 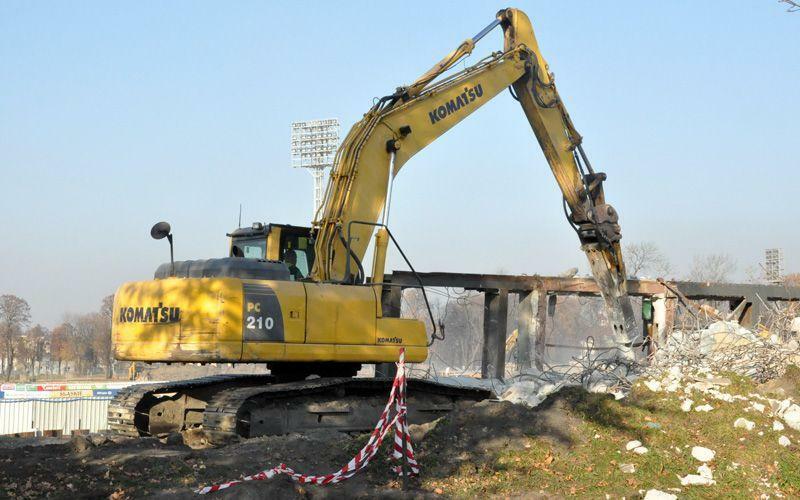 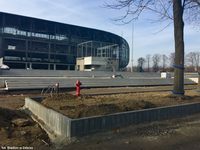 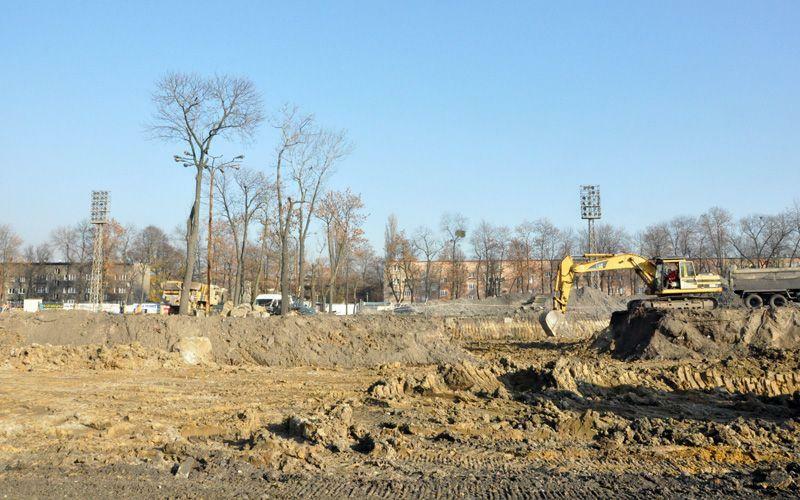 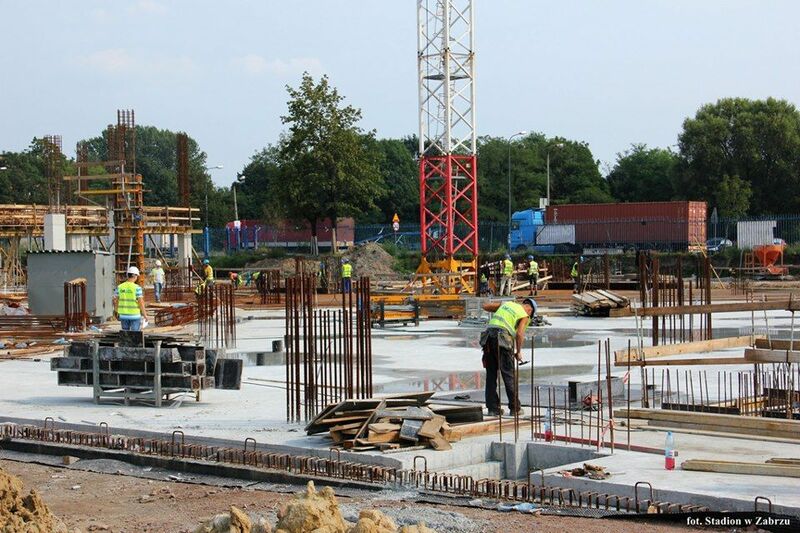 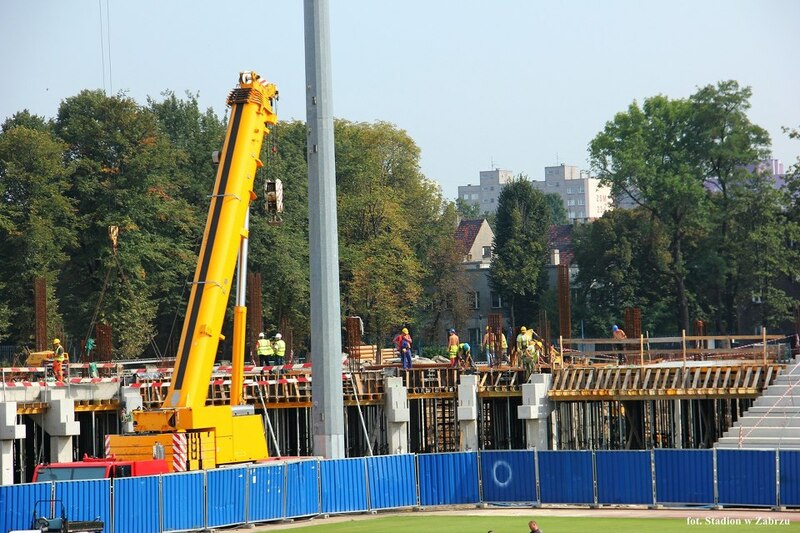 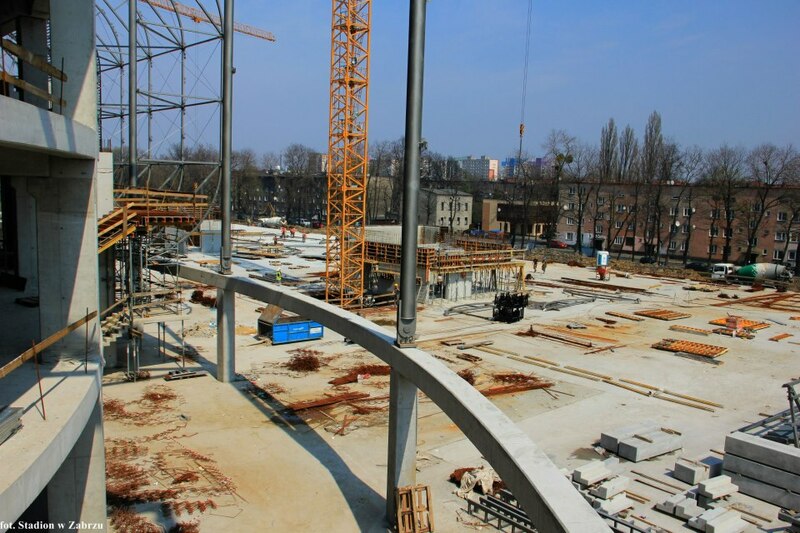 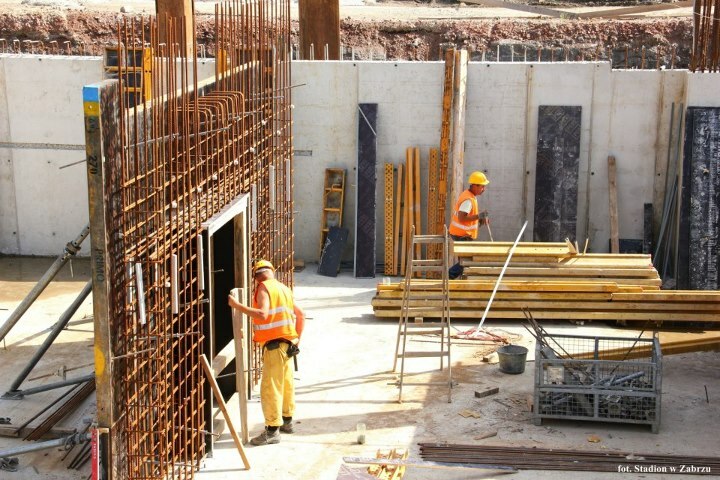 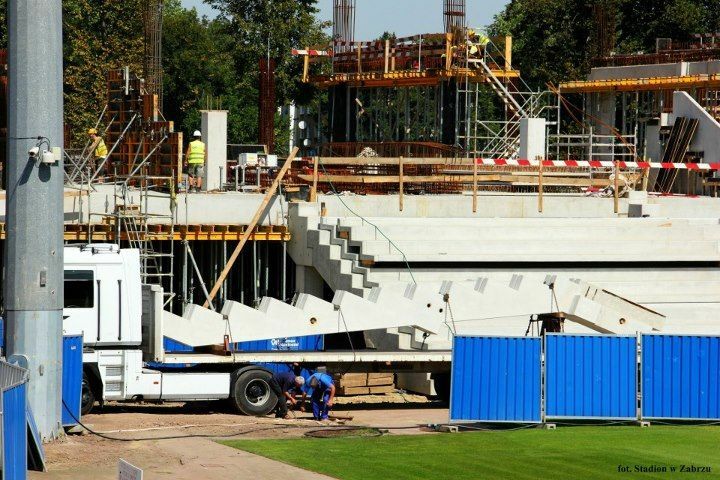 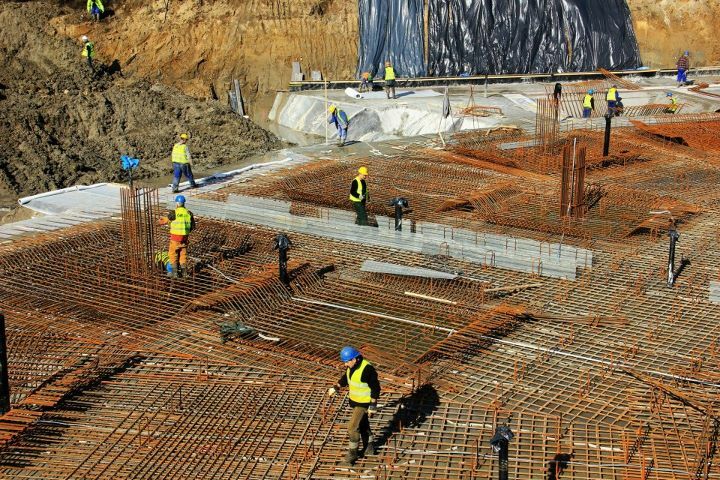 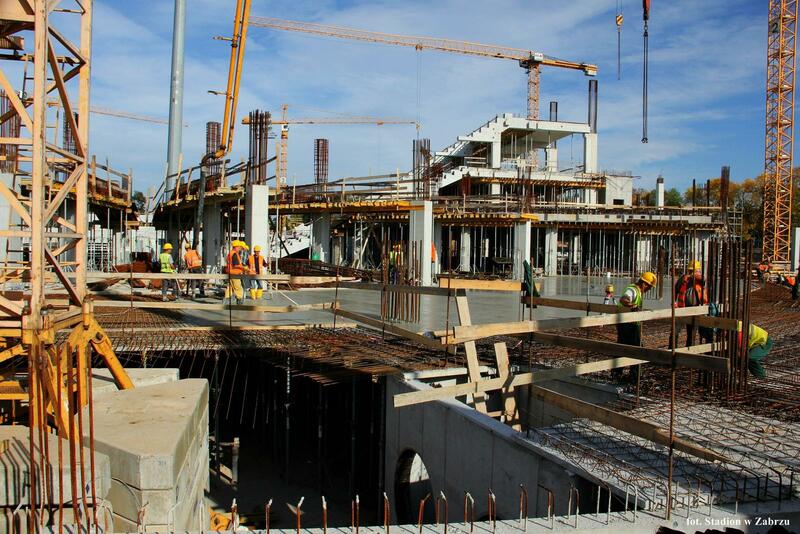 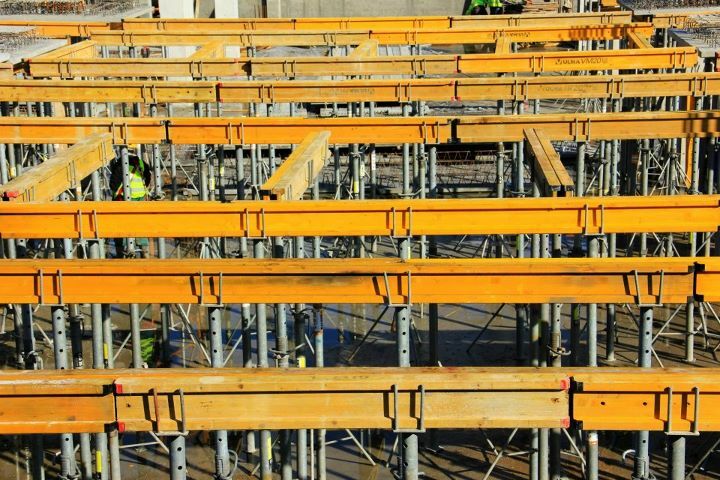 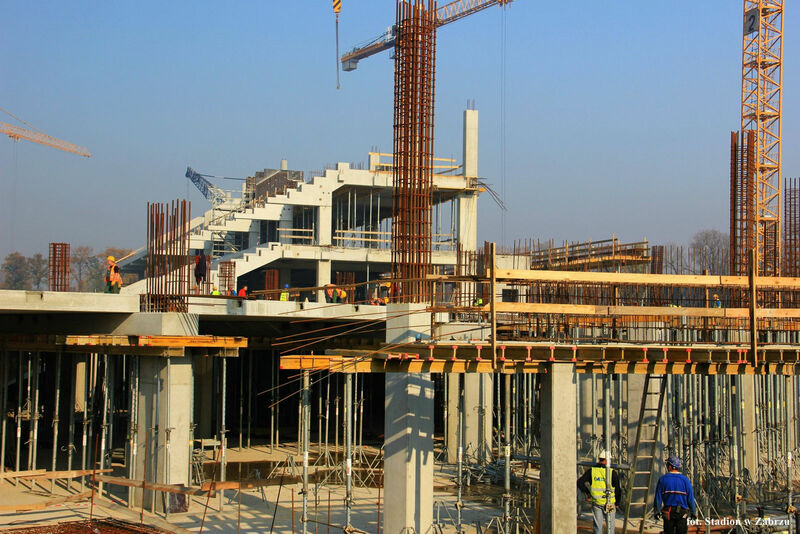 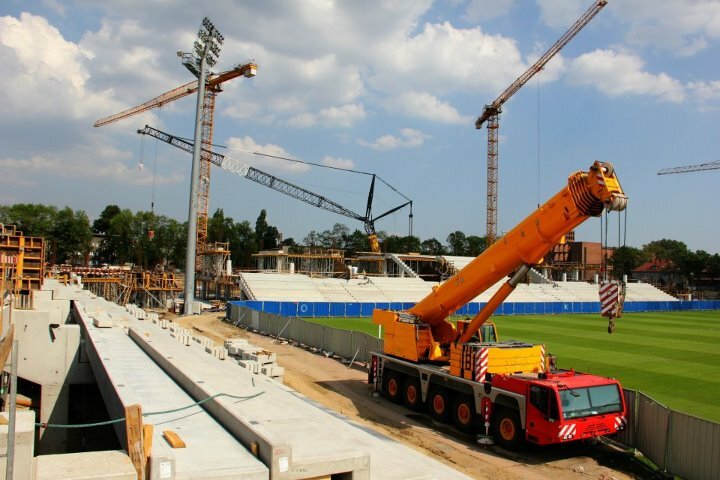 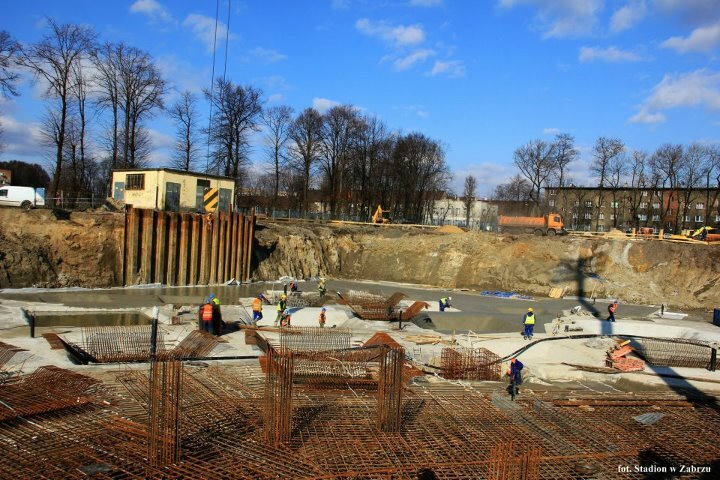 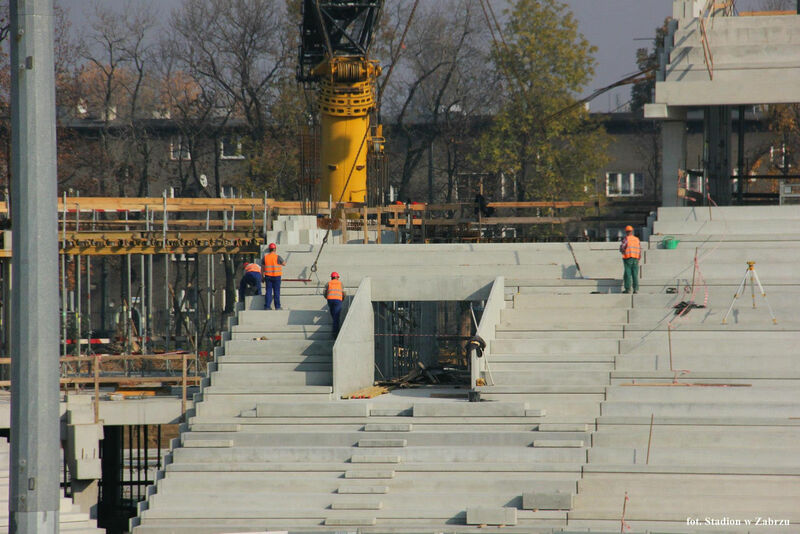 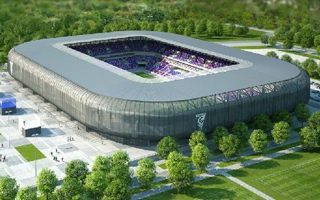 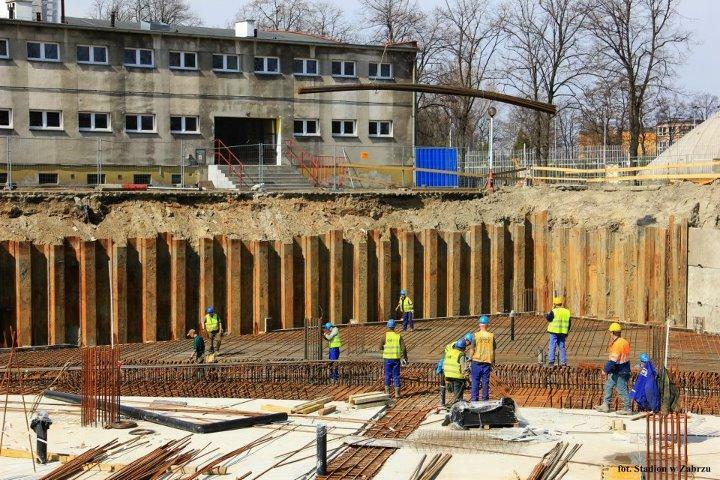 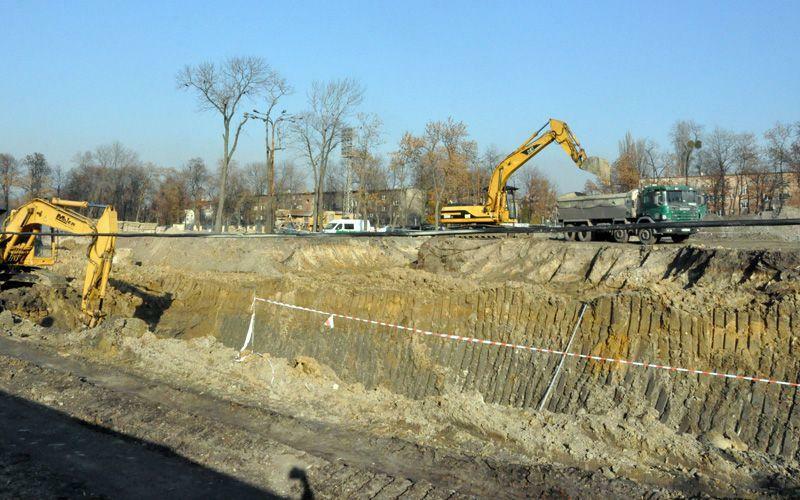 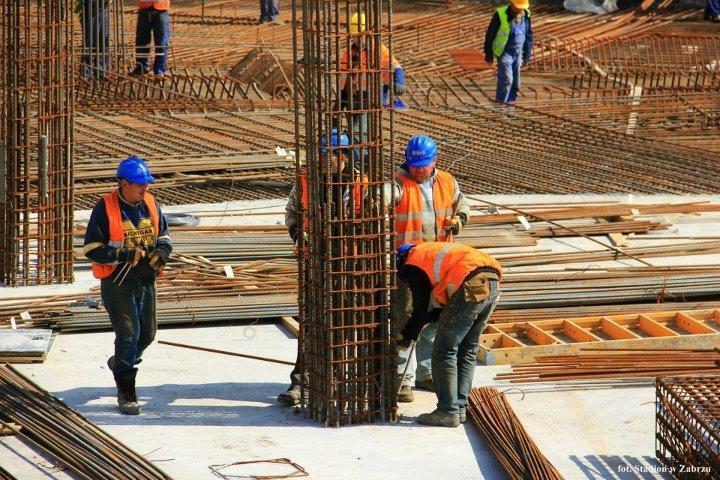 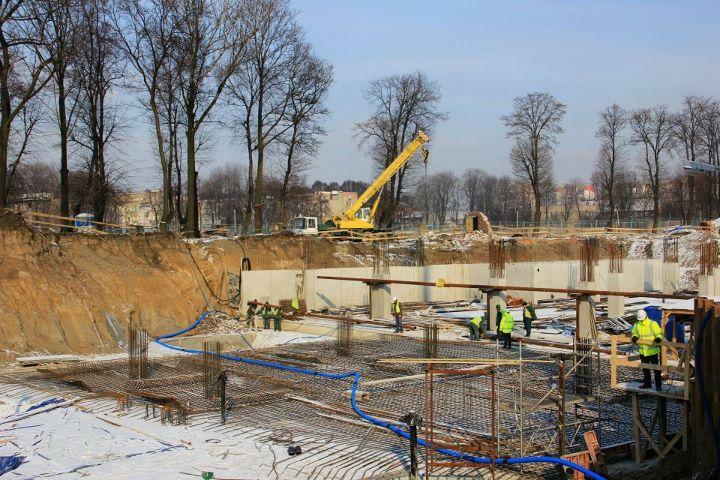 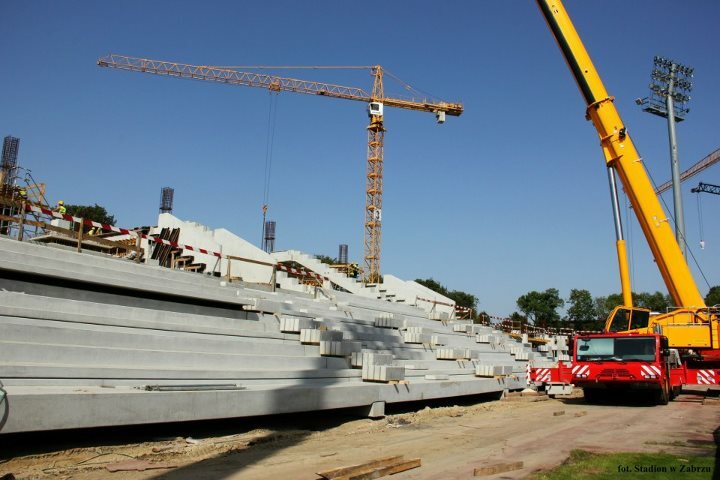 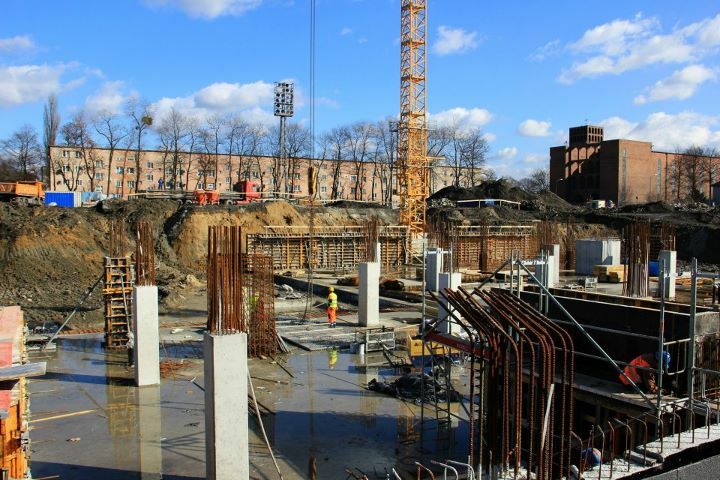 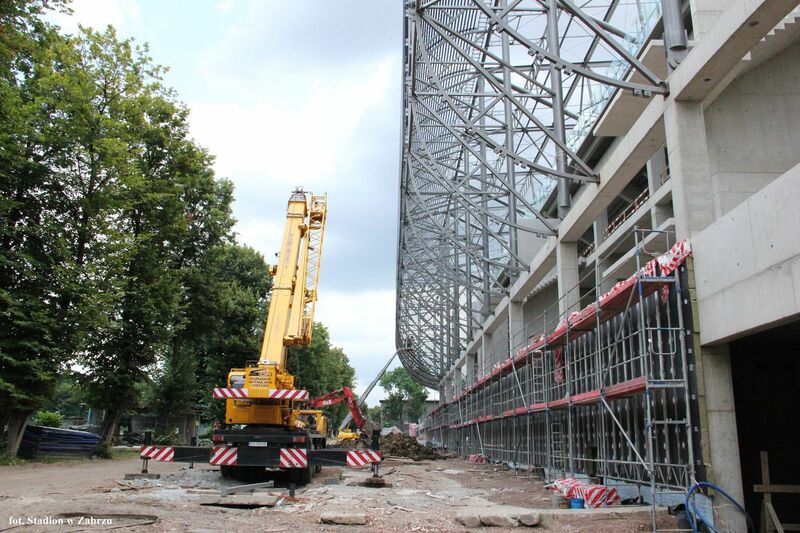 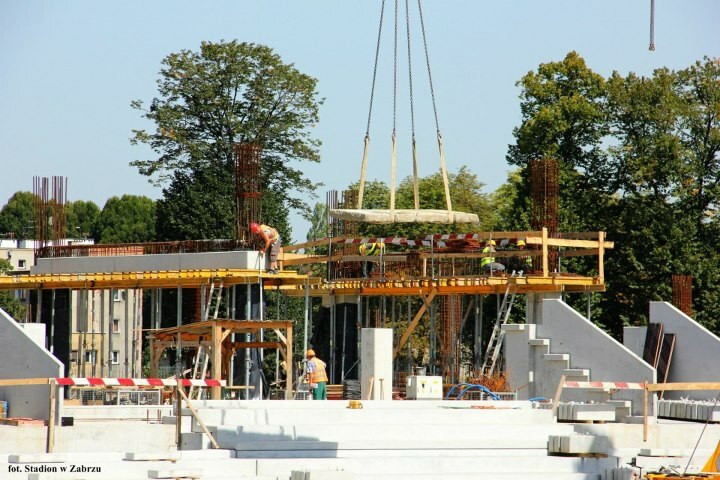 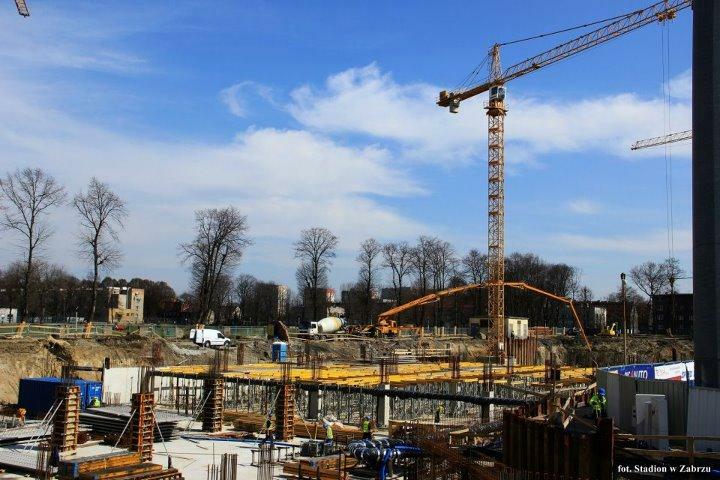 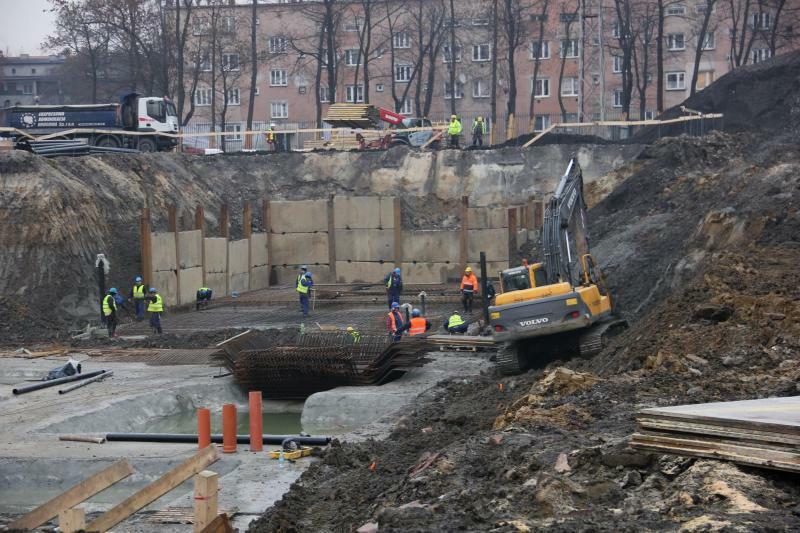 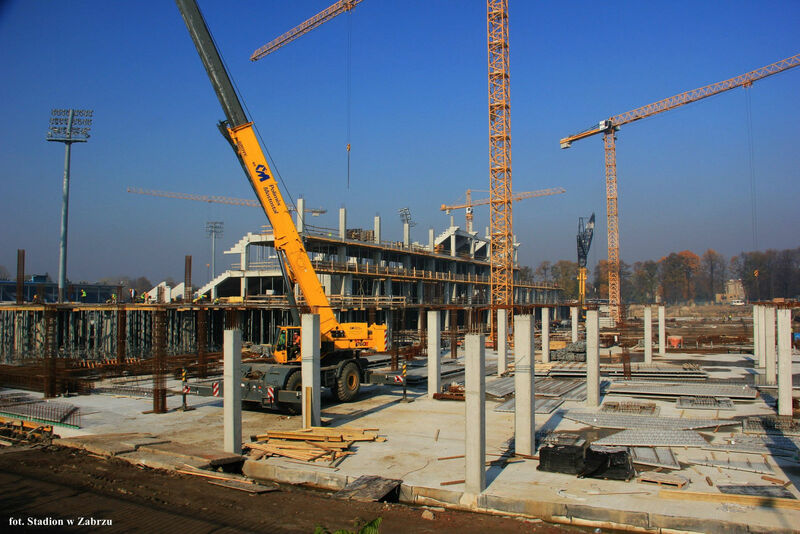 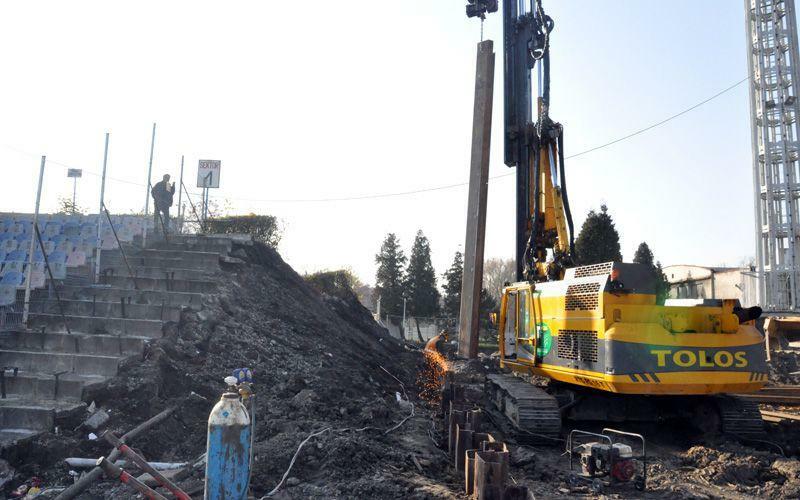 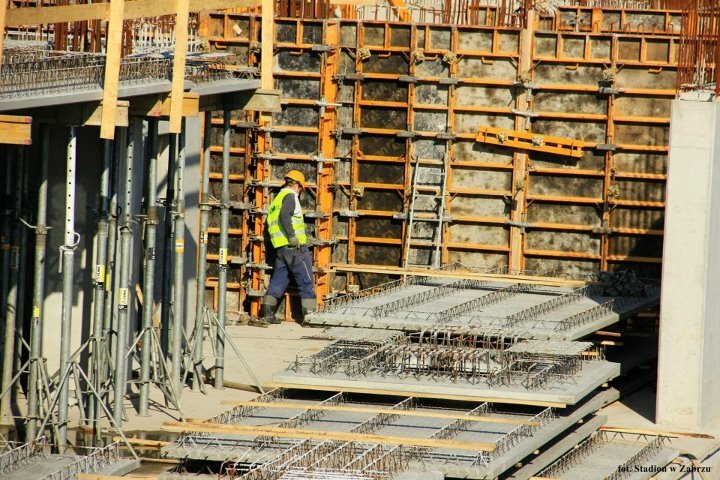 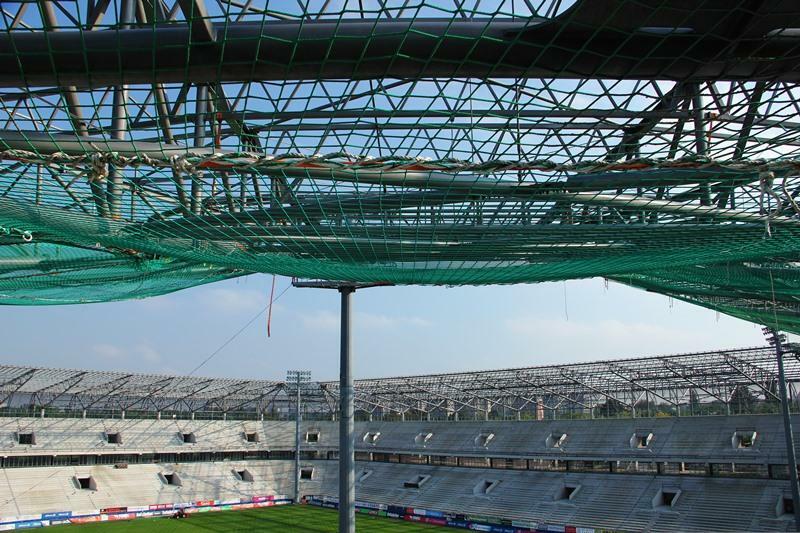 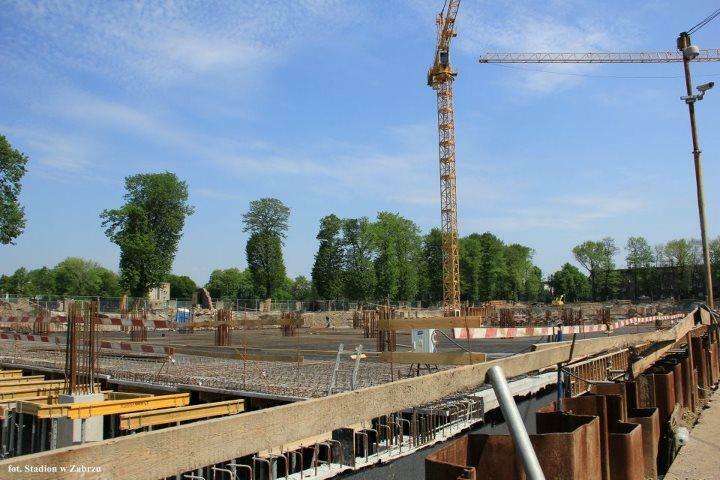 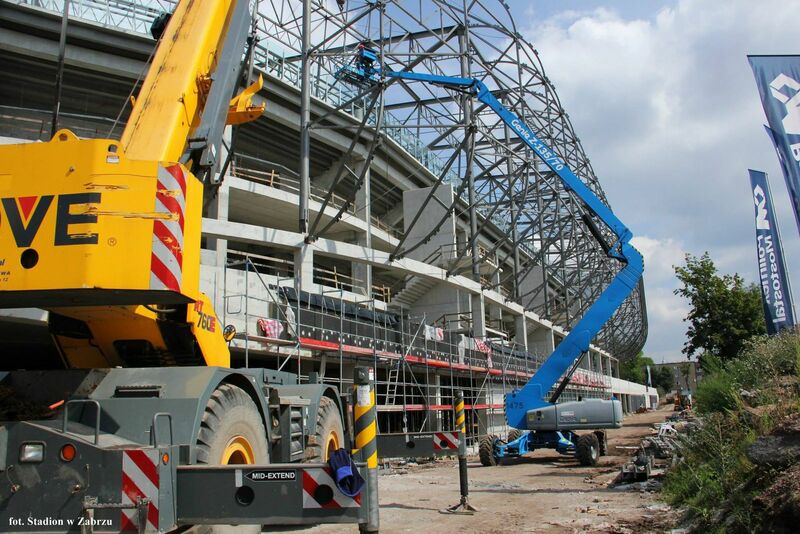 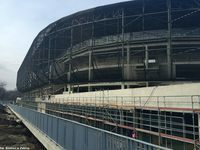 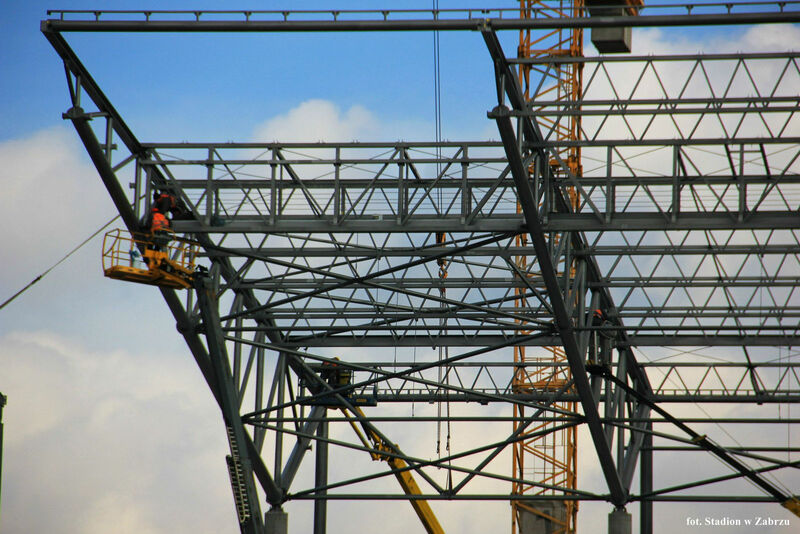 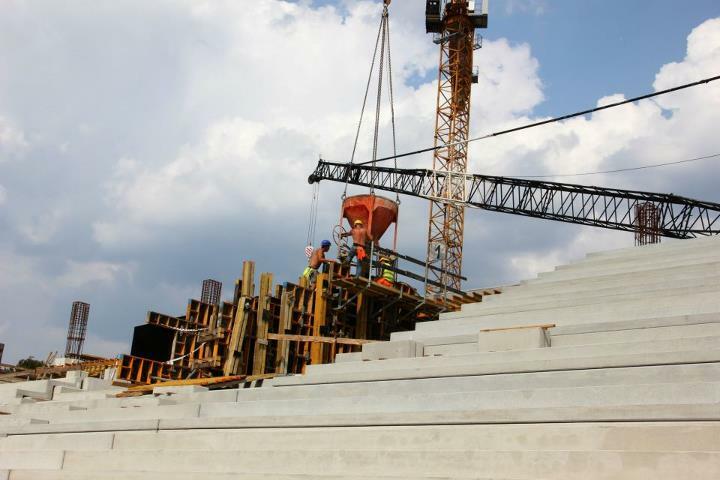 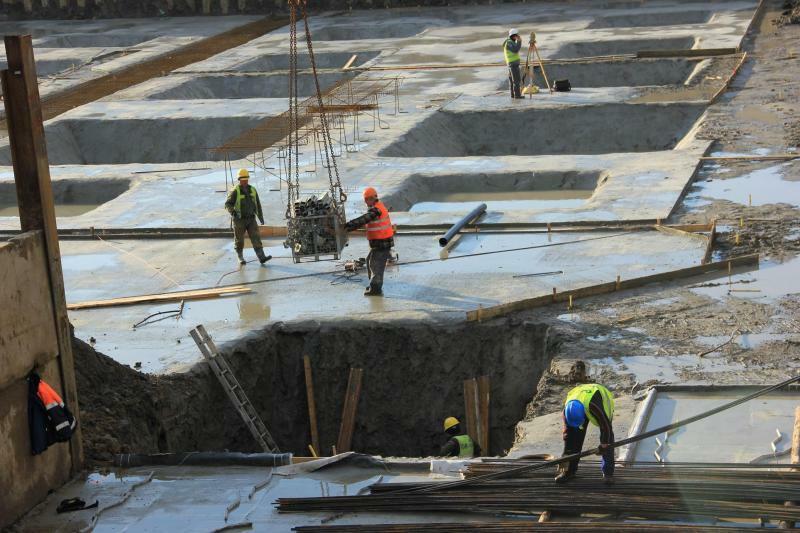 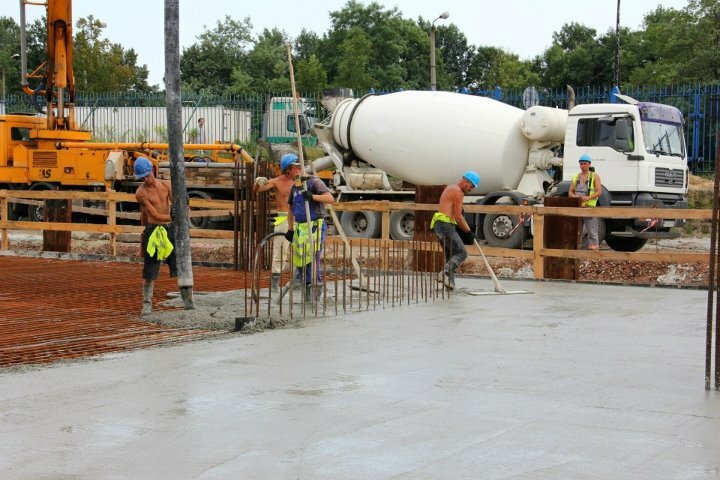 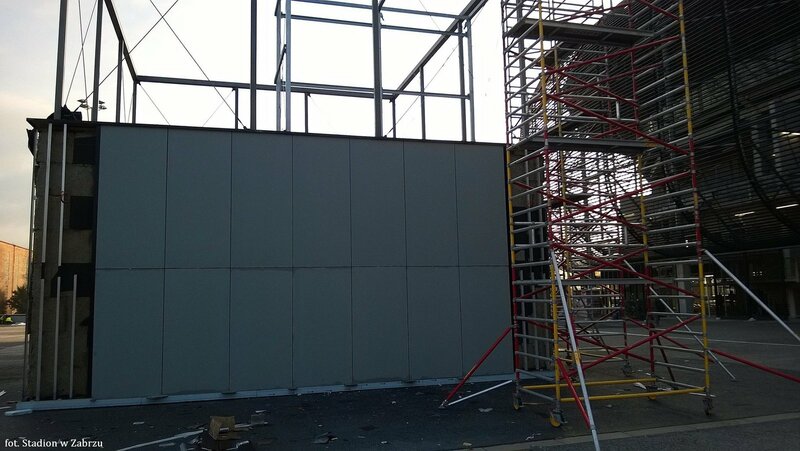 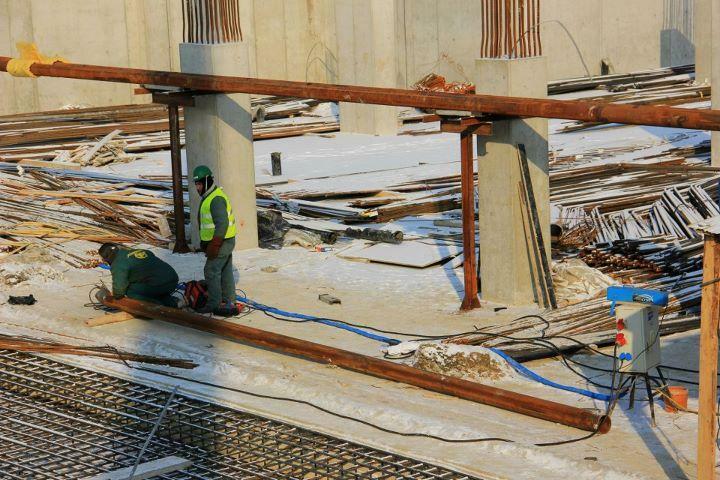 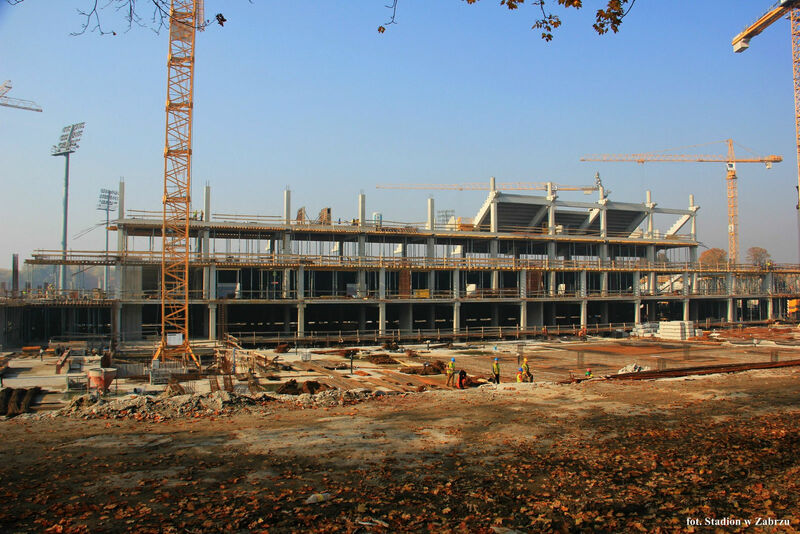 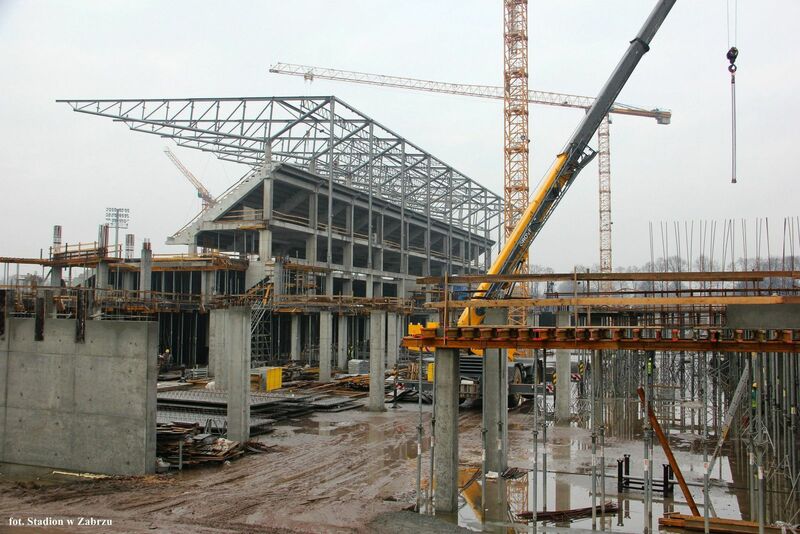 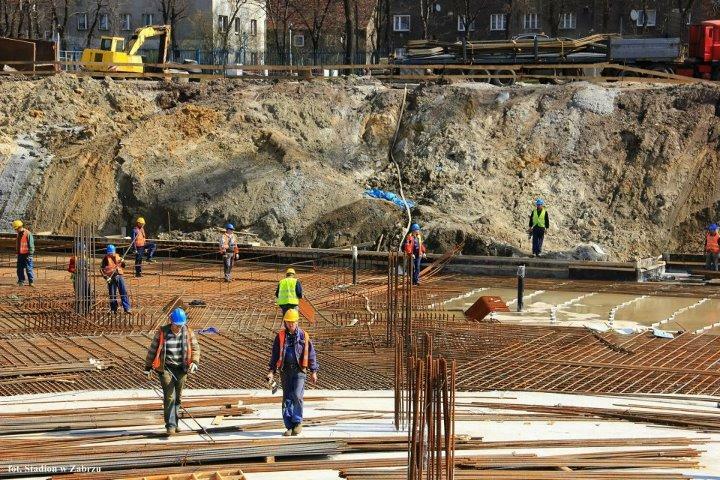 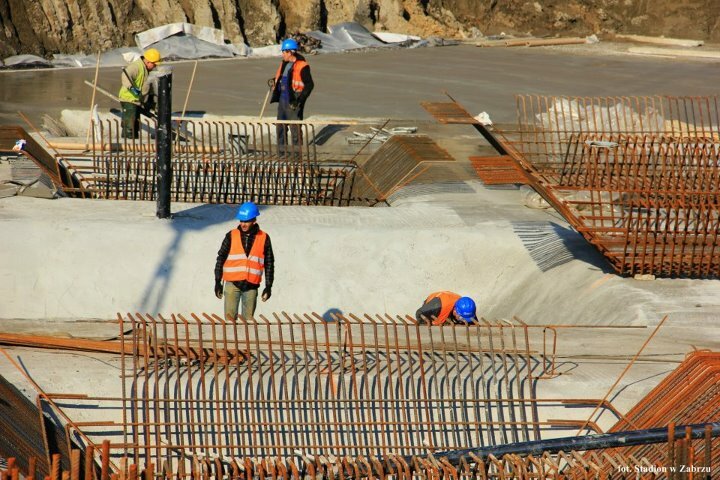 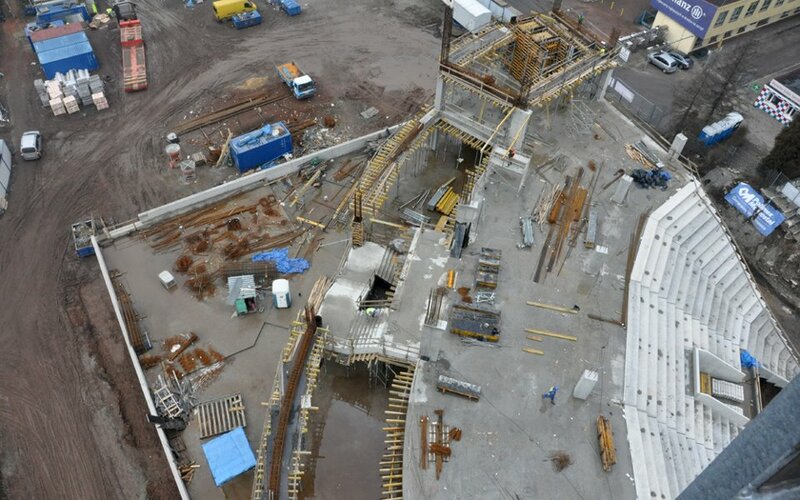 Financial difficulties of the general contractor caused delays in Zabrze, where Polimex-Mostostal is building the new 32,000-seater stadium. 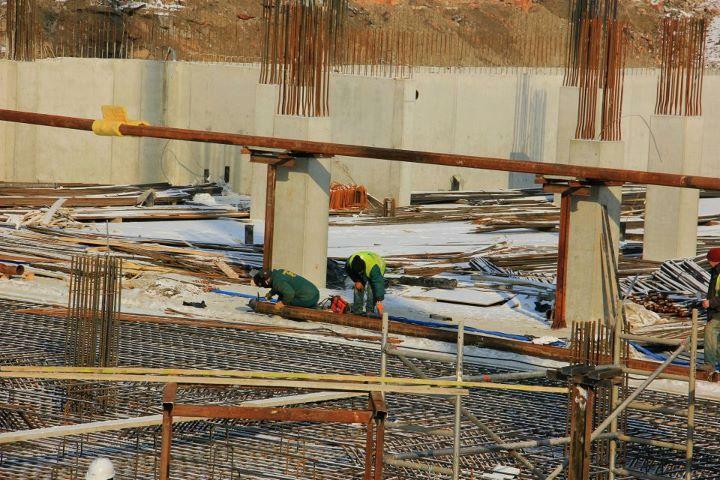 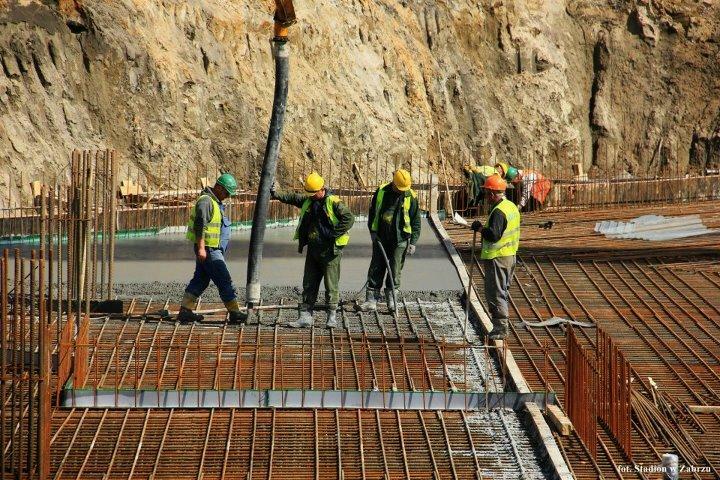 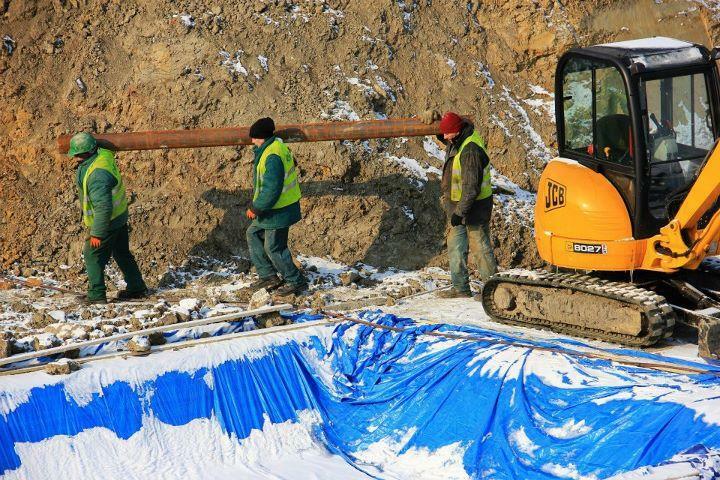 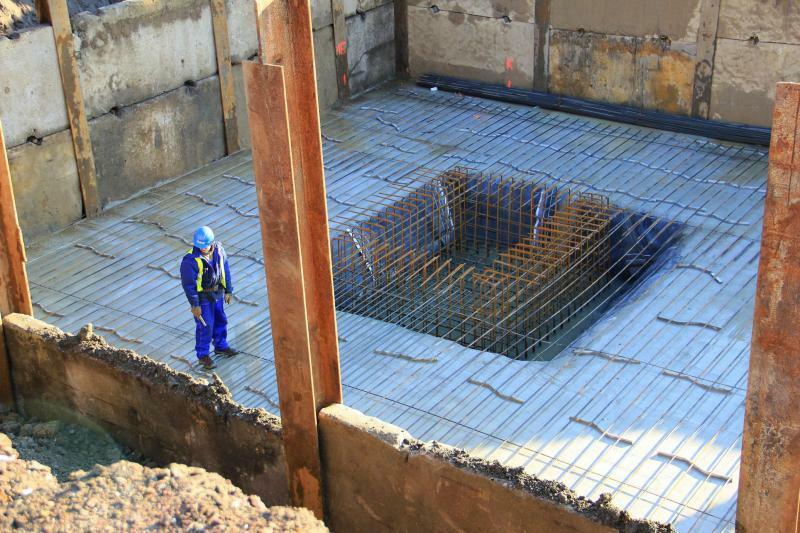 Investors are very concerned over abilities of the company to finish works in time.